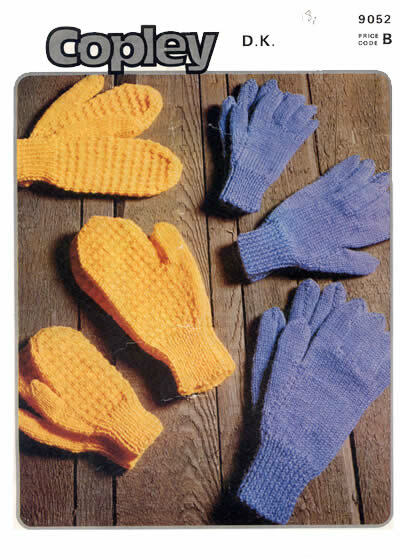 Description: Basic 4 ply sock pattern in 6 sizes and 4 designs: rib or plain, short or long. 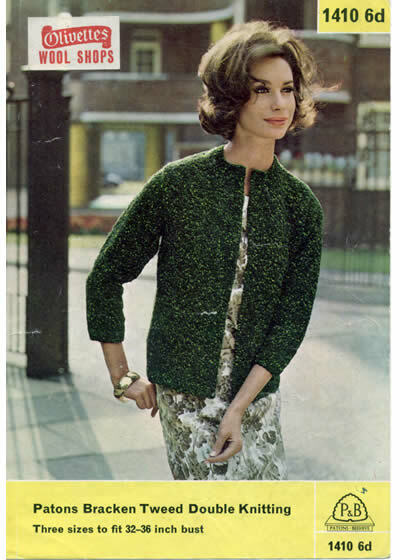 Description: Sixties textured bouclé fitted cardigan in three sizes. 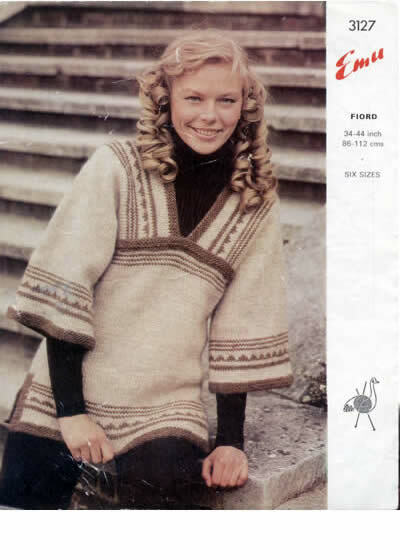 Description: Classic retro poncho and shawl design from the cusp of a new decade, where the popularity of ponchos had not diminished. 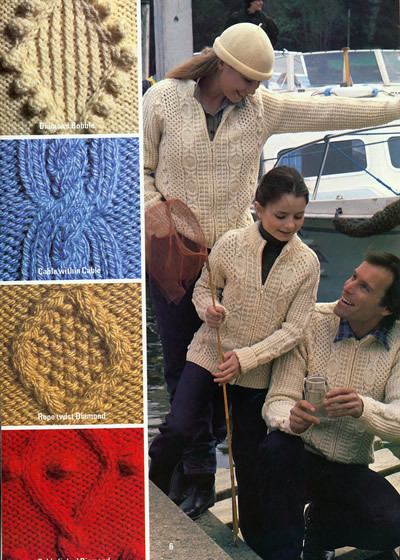 The yarn was a shaded bouclé in a lovely colour range (which I was quite keen on at the time). 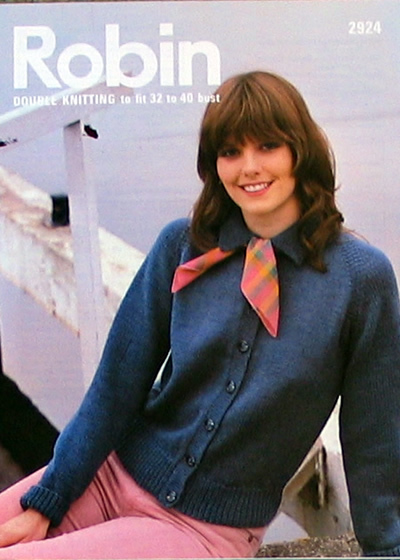 Both items are knitted but the shawl has a crochet border. 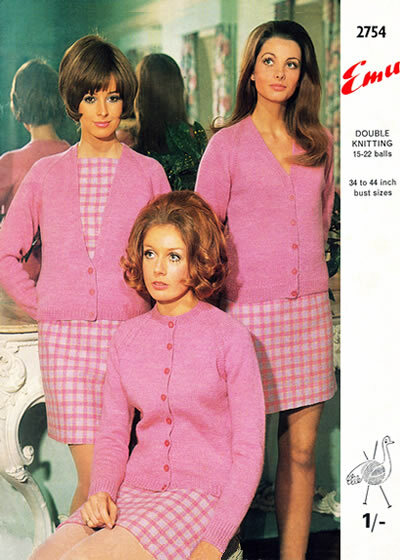 Wool brand: Purple Heather, Beehive. 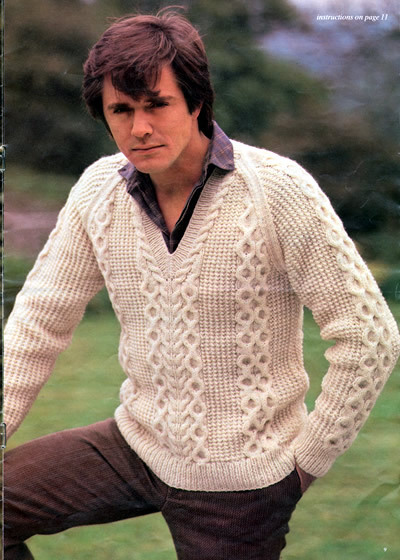 Description: Men's plain V-neck pullover or slipover. 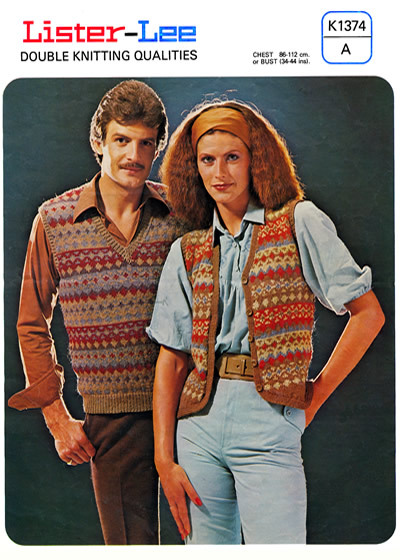 Perfect to wear when showing your holiday packing to a mate. 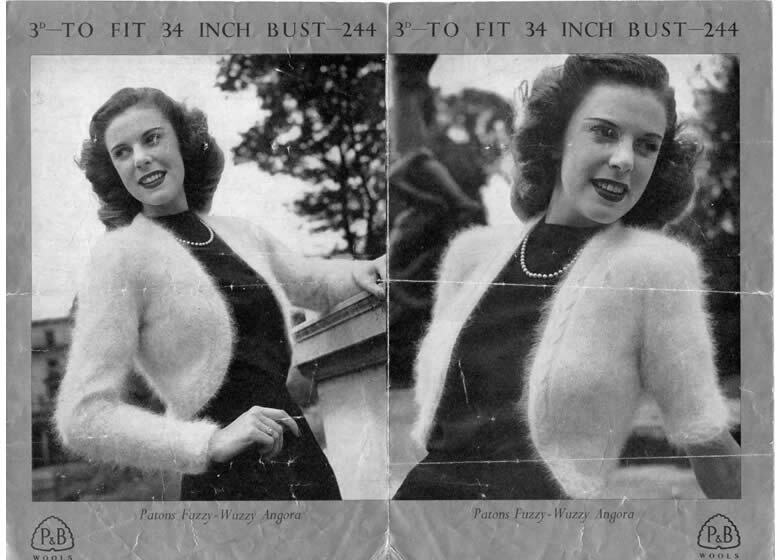 Some surface creasing to the photo (not shown) which does not affect the instructions. 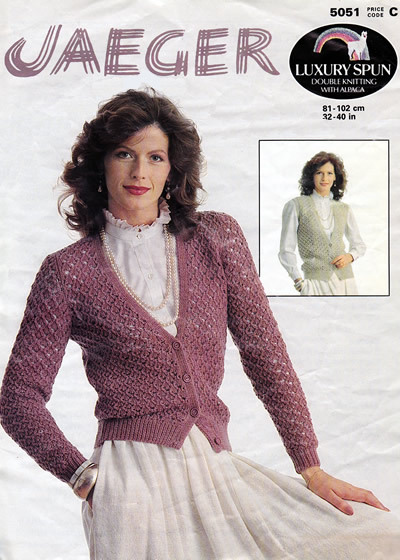 Description: Pretty twin-set where both cardigan and sleeveless top have lace insets. 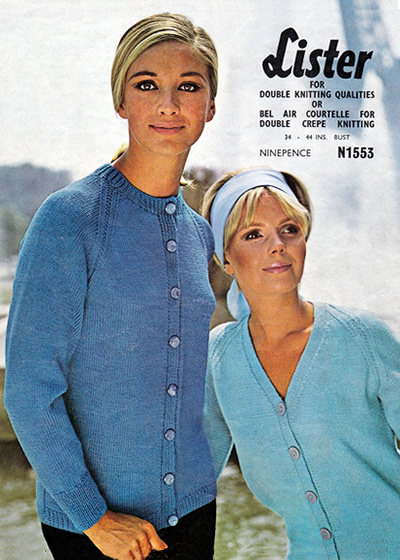 The original yarn was a soft 60% linen blend. 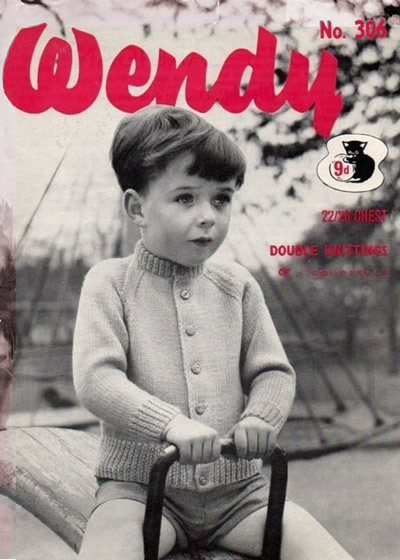 Description: V-back raglan sweater with wide roll collar. 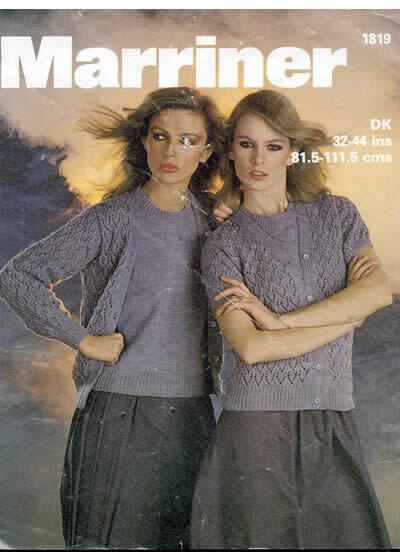 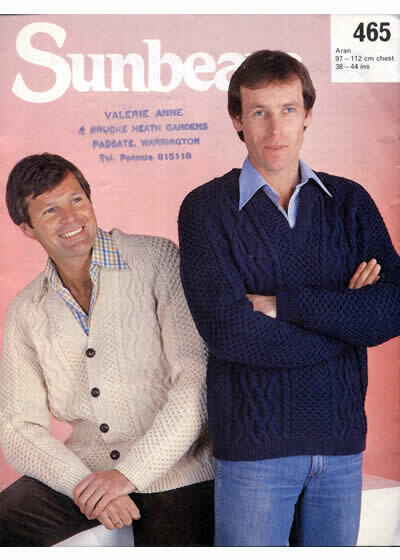 Description: Two DK sweaters with separate patterns supplied for each - raglan in ribbed open stitch, the other in lacy leaf pattern. 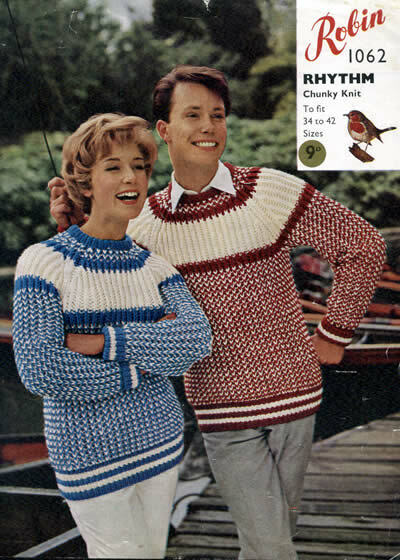 The pattern is in new condition. 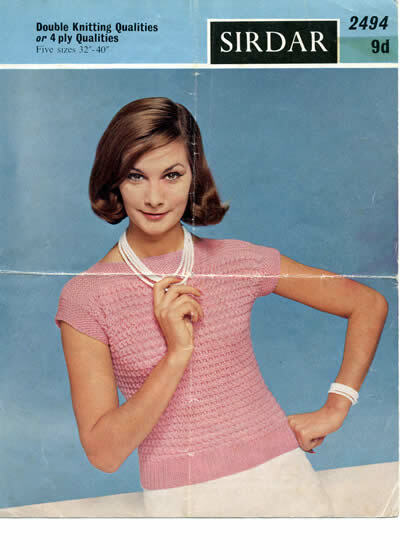 Description: Pretty summer top in fine yarn. 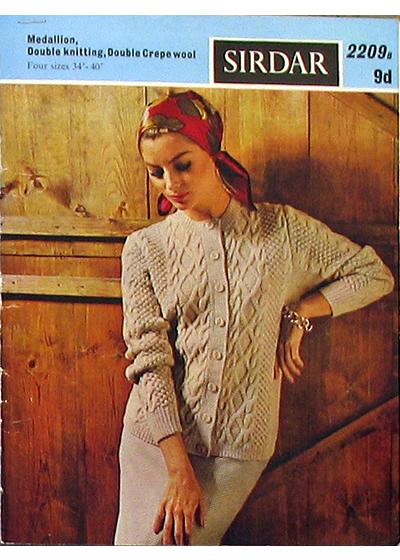 The pattern has a horizontal crease but is otherwise in good condition. 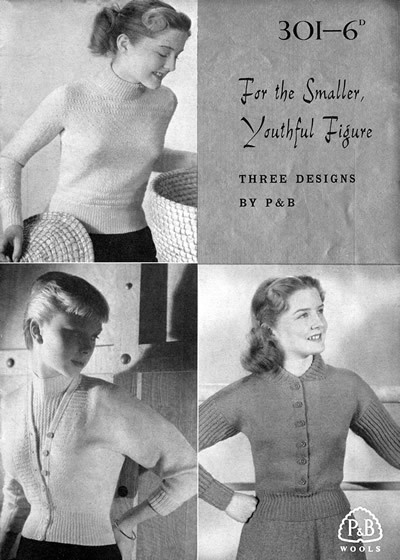 "For the Smaller Youthful Figure"
Description: Small booklet of 3 sweater/cardigans: "The High Neck is Popular - some wear it with sleeves - some wear it without" (4 ply); "A Twin Set of Character " (3 ply); "A New Version of the Chunky Style - note the dropped shoulders with ribbed collar and sleeves" (also note - it's 4 ply not chunky yarn). 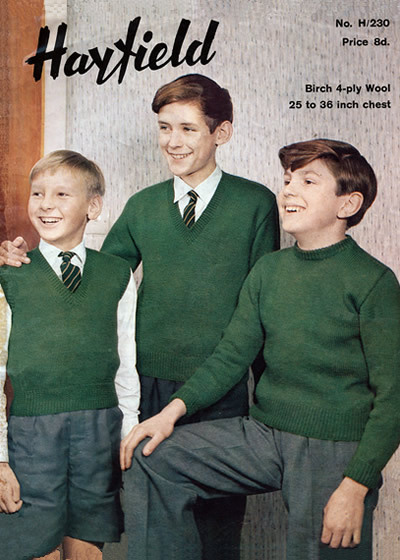 These are "teen" sizes up to 34 inch chest only. 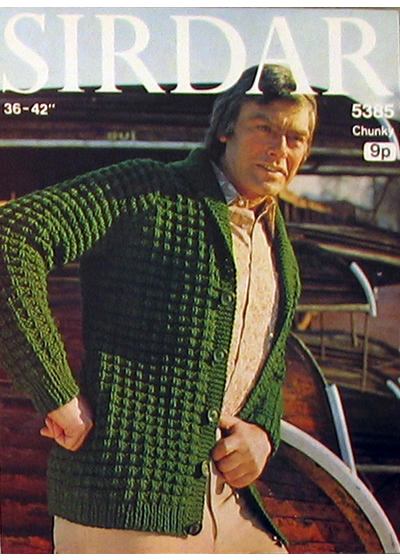 Yarn quantity: 13-17 (25g? 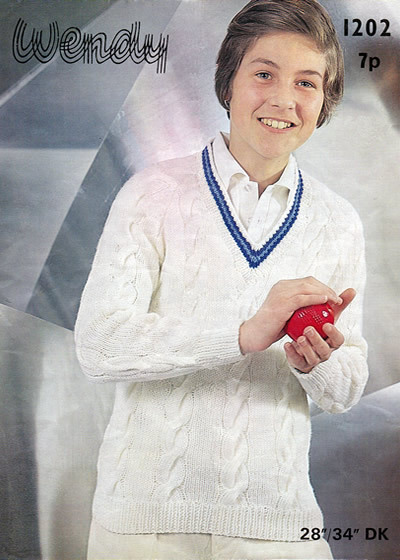 balls) plus 2 contrasts for team colours. 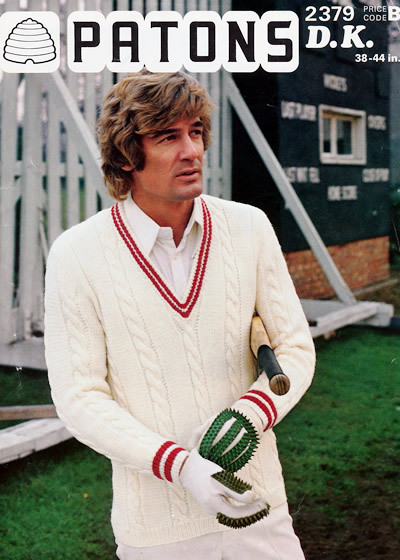 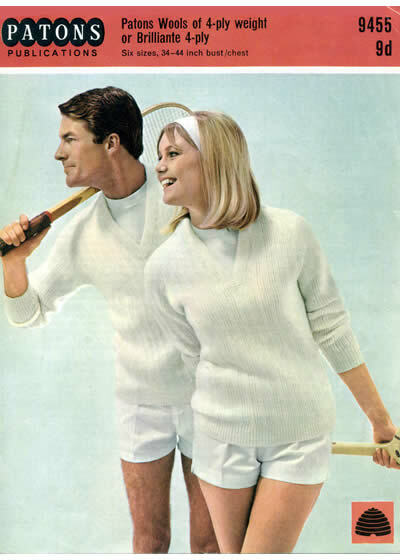 Description: Cricket or tennis sweater with long sleeves; sized for "young adult". 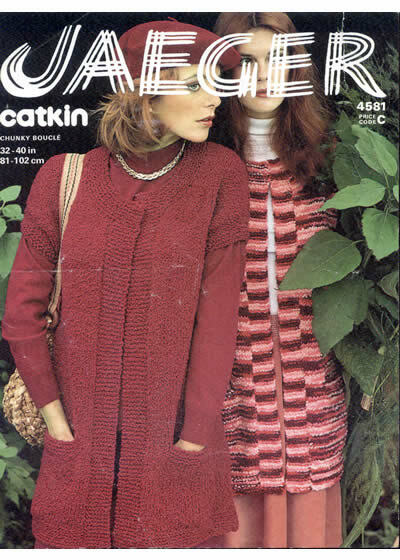 Pattern has vertical crease affecting only the cover photo. 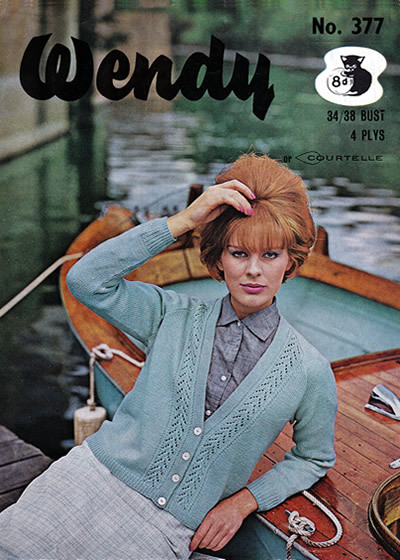 Wool brand: Super Crimp Courtelle, Gleneagle Tweed, Conella Crepe, Colorama, Service DK. 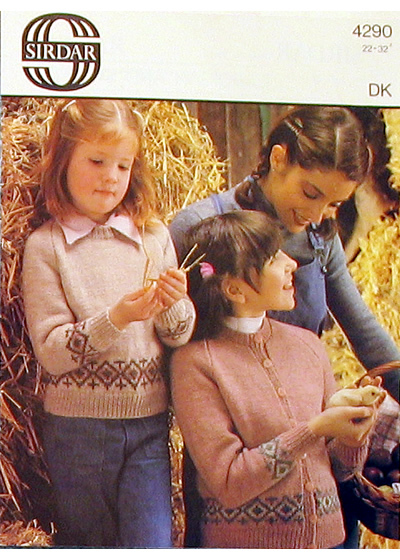 Description: Child's plain "school" V-neck sweater in DK. 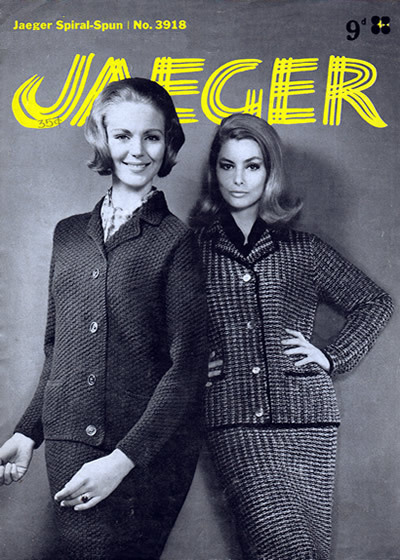 Description: Classy and stylish cardigan/jacket and skirt suit from Jaeger, in a textured stitch using 2 shades of yarn - or optionally all in one colour. 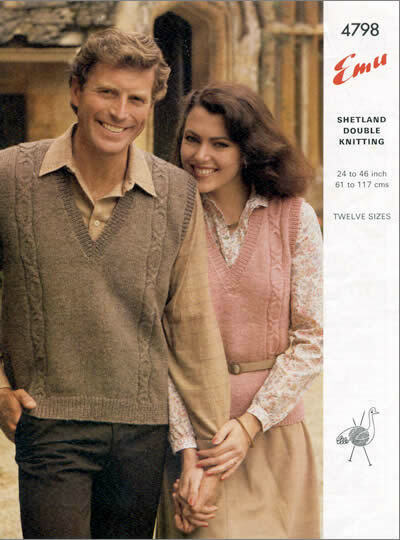 Description: Pleasing heavier weight guernsey style sweaters; plain with simple double moss stitch yoke. 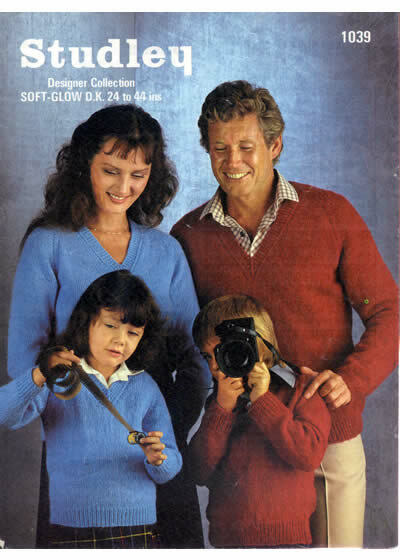 Instructions are fine but with some creasing which affects the photo. 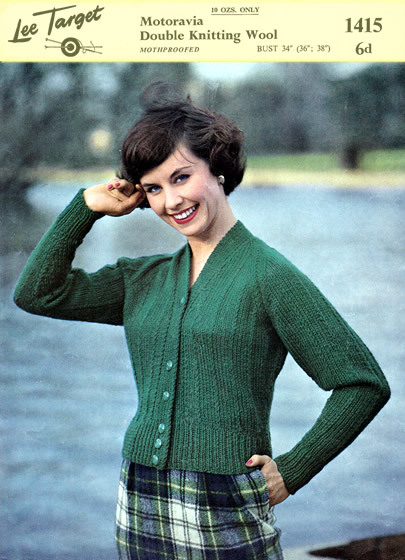 Yarn quantity: 9-13 (50g balls) for cardigan, and 7-10 for top. 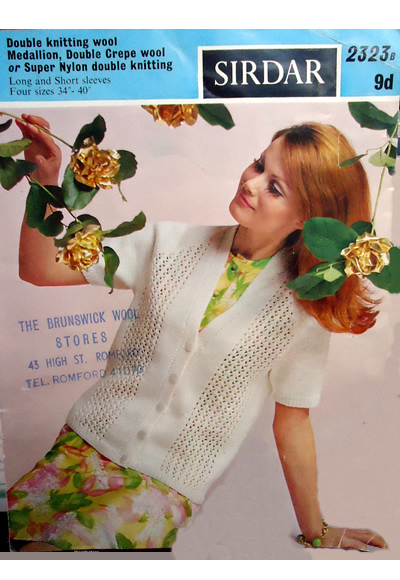 Description: Twinset consisting of round necked short sleeved top with cable/eyelet panel under the plain cardigan with same pattern as front edge detail. 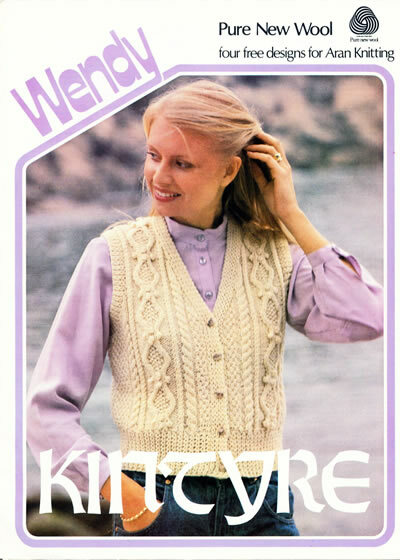 Pattern in moderate condition with some creasing which is more noticeable on front photo than elsewhere; instructions in good order. 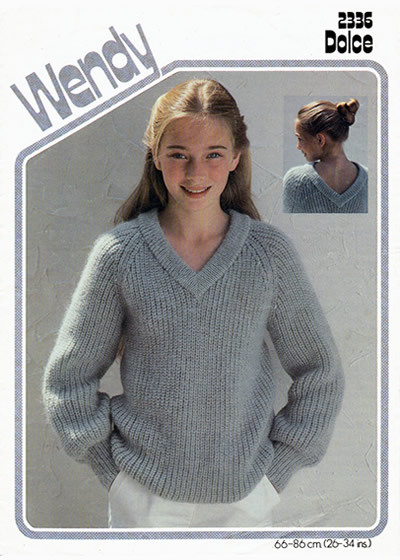 Description: Plain mohair-type chunky cardigans. 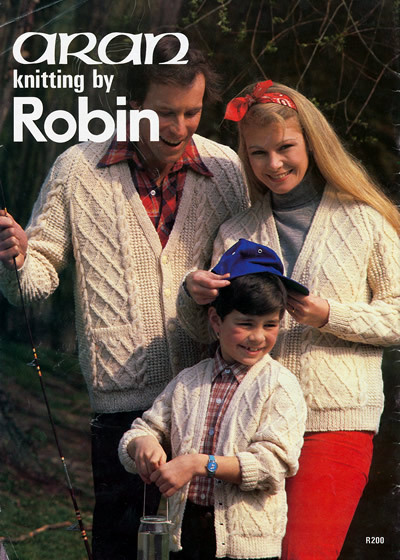 The pattern is in used condition. 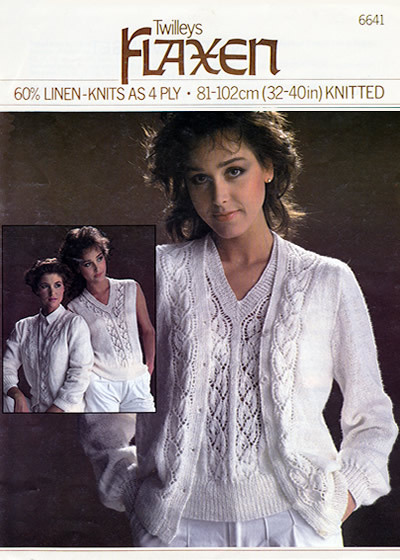 Description: Chunky eyelet lace cardigan with shawl collar and pockets. 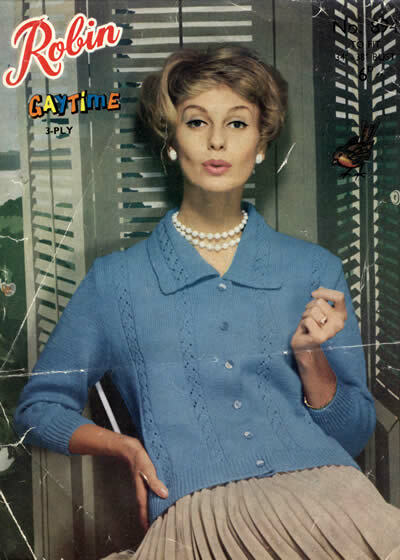 Description: Ladies cardigan with cable trim and detail on sleeve. 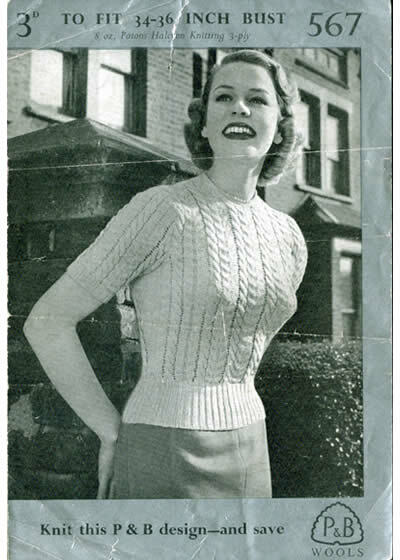 There is a horizontal crease on the photo which does not affect the instructions. 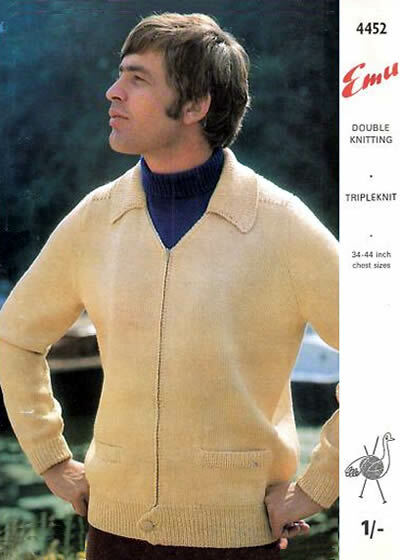 Description: Man's rib/cable pattern jacket with zip front and collar. 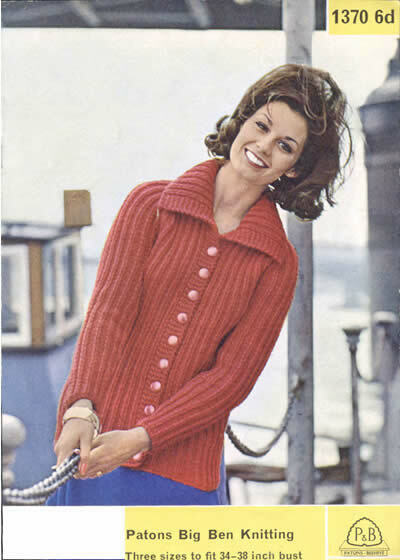 Description: Womens classic cardigan or sweater with collar. 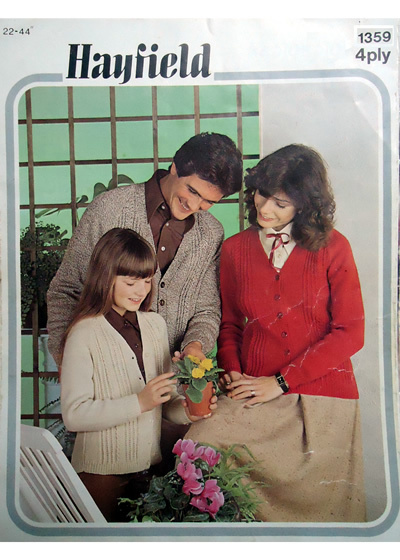 The pattern has a definite horizontal crease which affects the photo but not the instructions. 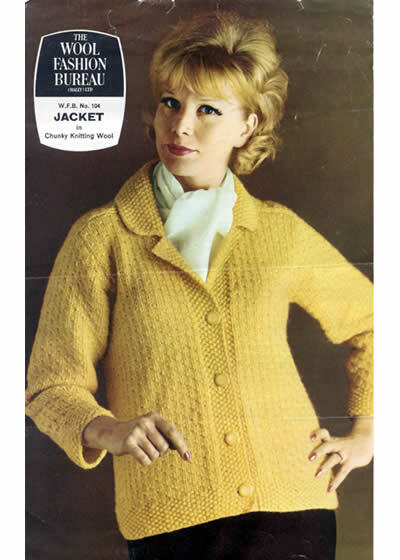 Description: Another delightful 60s plain knit jacket with zip, pockets, and collar. 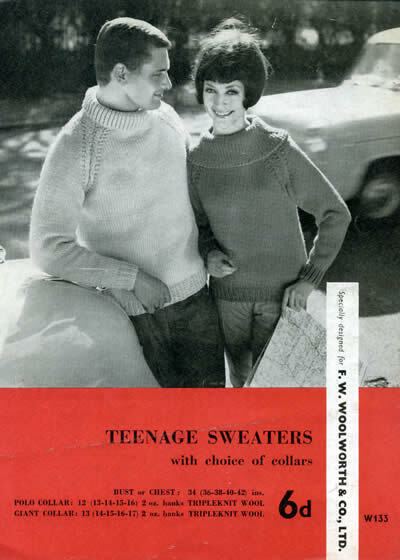 Note the trendy button closure at the welt and the interesting neckline with a polo-neck sweater worn underneath. 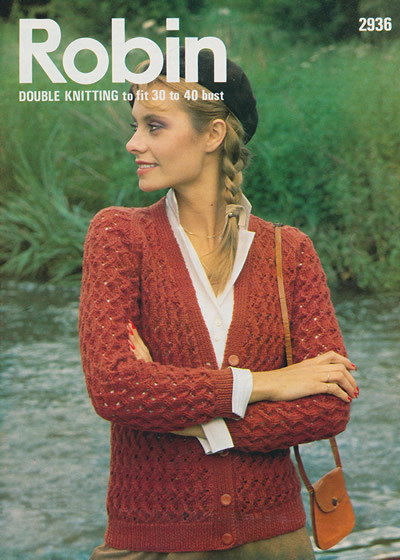 There are 2 sets of instructions - one for DK and one for "Tripleknit" which is a worsted or aran weight yarn (between a DK and a bulkier yarn). 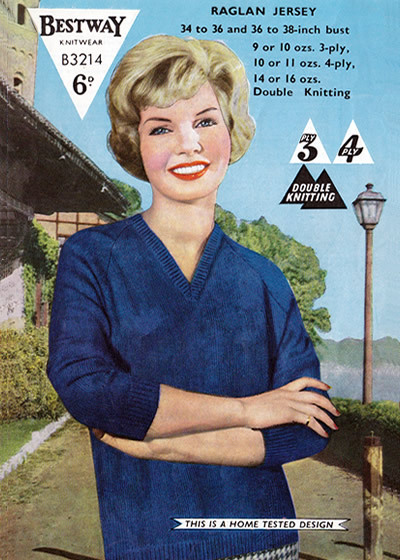 Triple knitting weights appeared in all the main manufacturers product lines in the 1960s, and, although more or less a worsted weight, it did not seem to become popular enough to gain the traction in the UK to replace double knitting as the "standard" UK yarn weight. 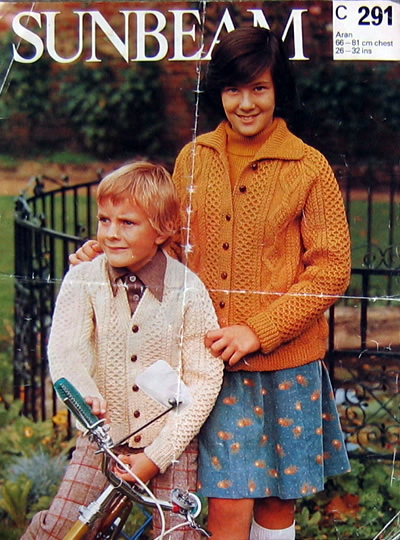 Unfortunately this pattern is again very well-worn - heavy vertical creasing marring the photo but the instructions are very clear. 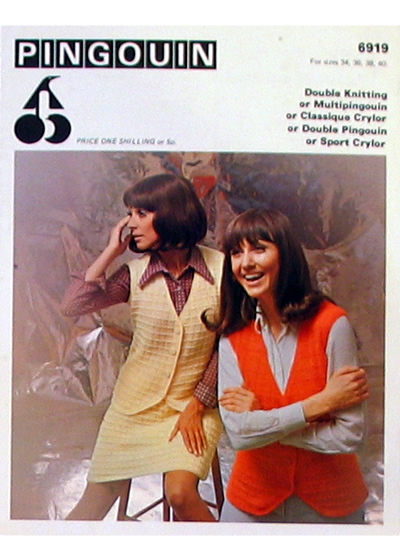 Description: Camisole top with matching short-sleeved cardigan. 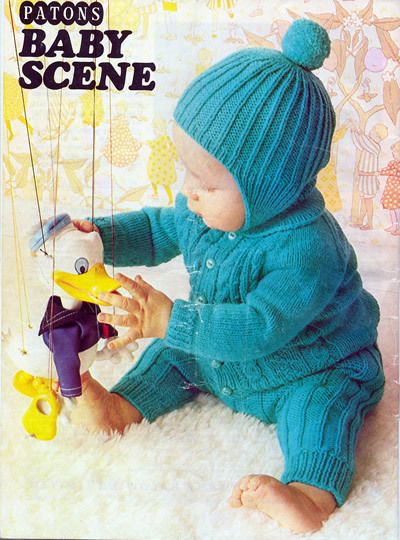 Description: Brightly coloured outfit for a baby - very 1980s yoked sweaters and leggings in slightly fluffy yarn to mimic adult fashion of the day. 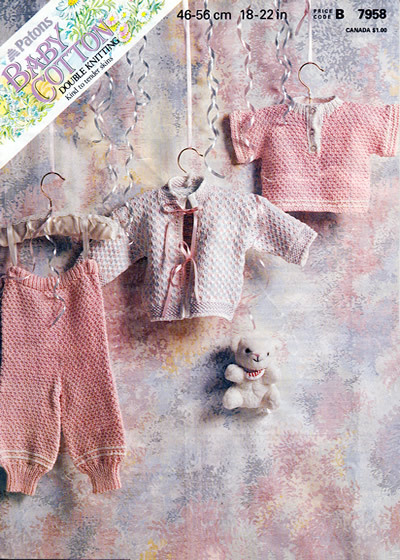 Description: Pastel 3 piece outfit for a baby. 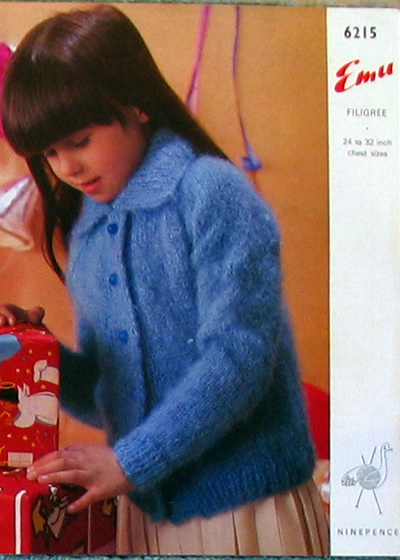 Description: Child's jacket with hood, side pockets, and front zipper, or guernsey style sweater. 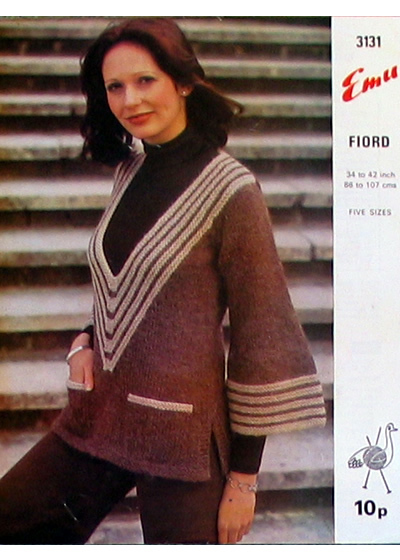 The pattern is badly creased and the front photo is badly marked by creases (not shown in photo). 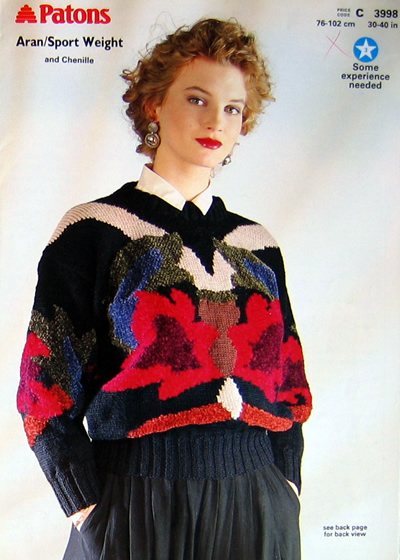 My main excuse in offering it in such well-used condition is that I think it's a delightful pattern and I have not seen it on many other sites - so here it is. 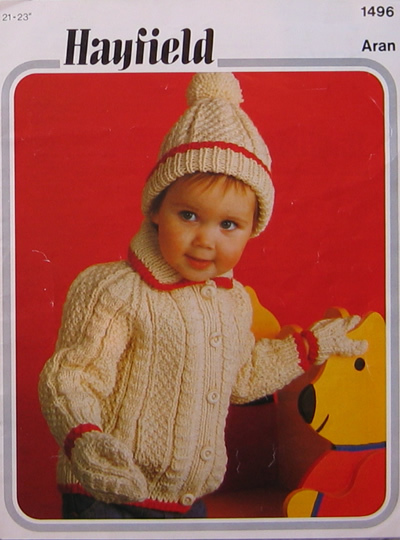 Description: Plain child's cardigan. 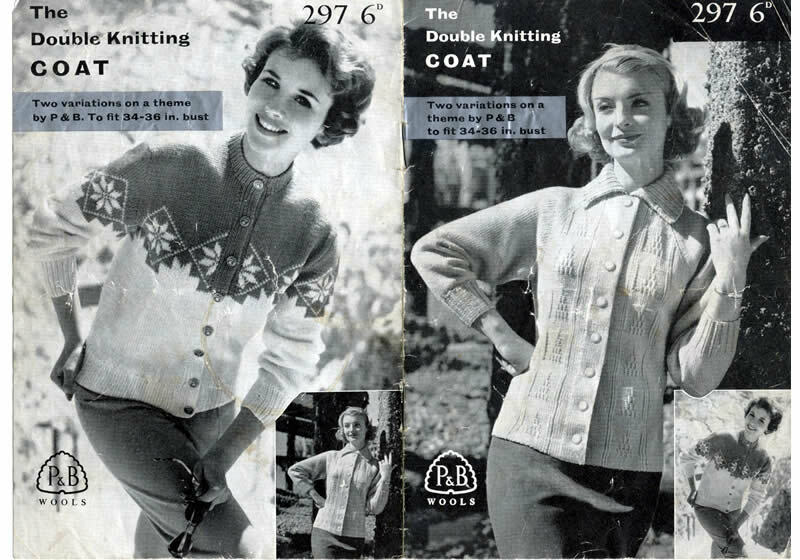 The pattern instructions are very clear; however in its history it has been torn and repaired with tape. 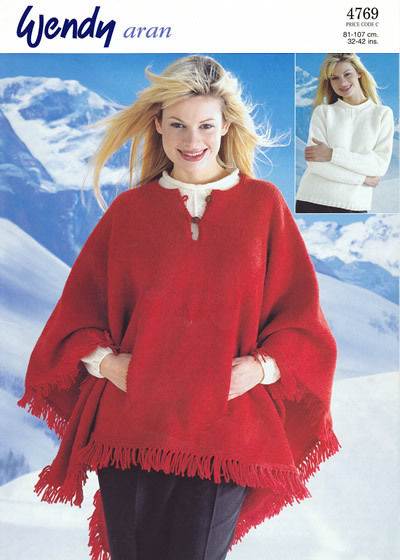 Description: Modern plain poncho with front pockets and fringing, plus plain sweater to wear underneath. 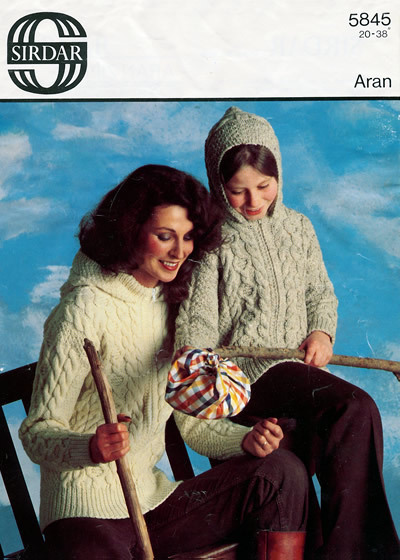 A booklet of Aran knits in Capstan yarn. 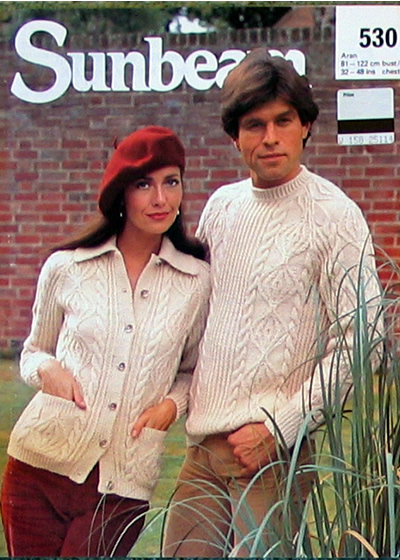 Sweaters, cardigans, hat, mittens, coat all as featured in the photos - click on thumbnails for popups. 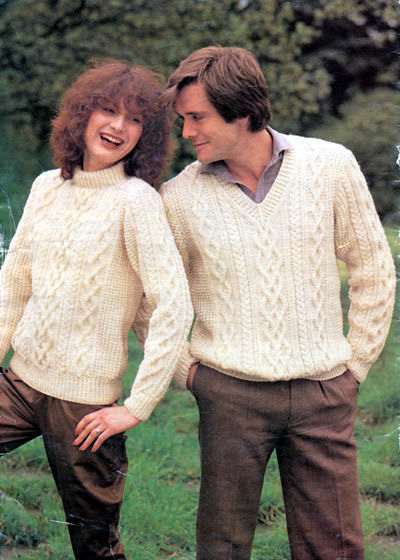 12 designs sized in the range from about 34 inch chest for the women's sizes up to about 42/44 for the men's designs. 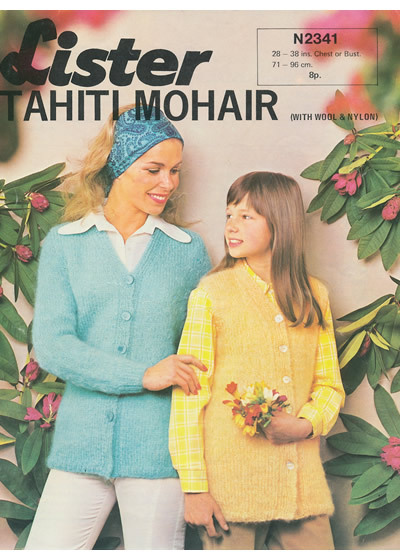 The booklet looks cosmetically in fairly poor condition especially the cover and spine (not shown in photos); however there are some nice designs and the instructions are not damaged. 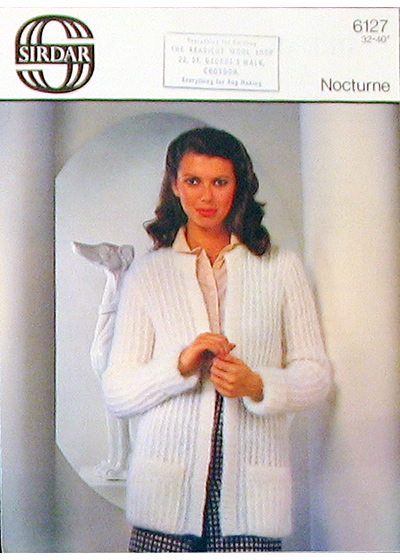 Description: Dolman cardigan knitted in stocking stitch knitted sideways from cuff to cuff. 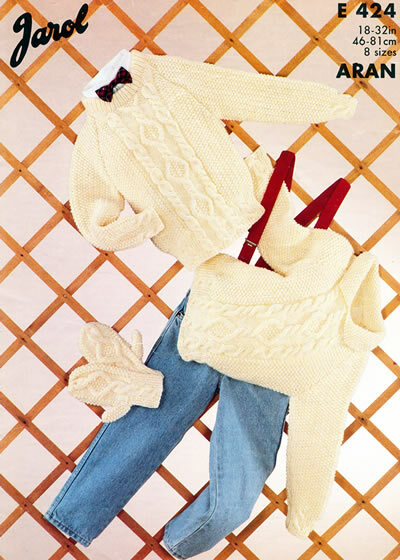 Description: Loose sleeveless chunky top. 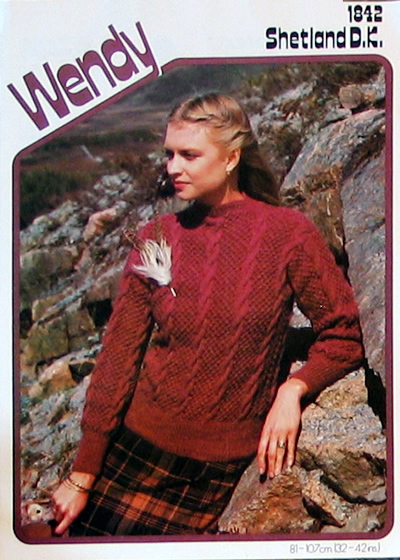 Needle size: 4½mm and 3¾mm. 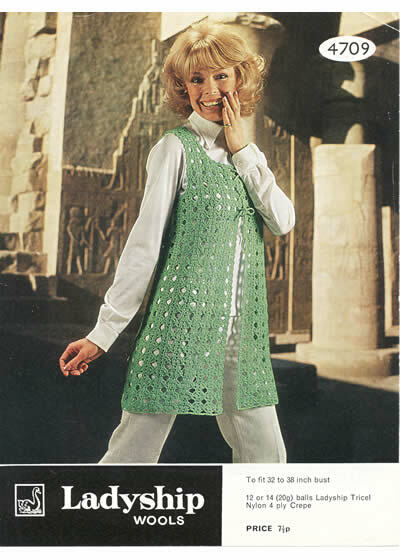 Description: Traditional sleeveless V-neck pullovers with a discreet cable pattern. 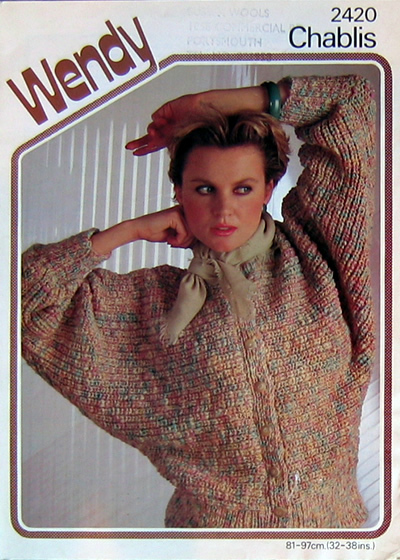 Description: Chunky jacket with hood. 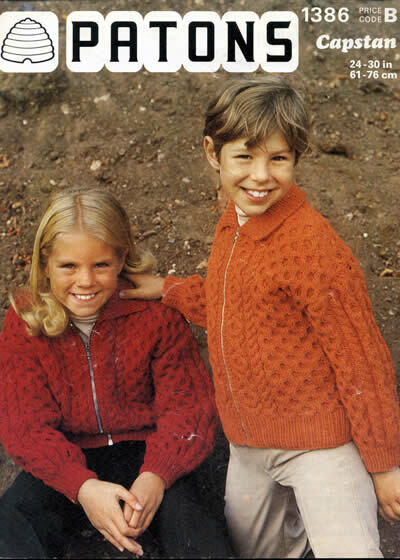 Description: Classic V-neck cardigan in fine yarn with eyelet lace front panels. 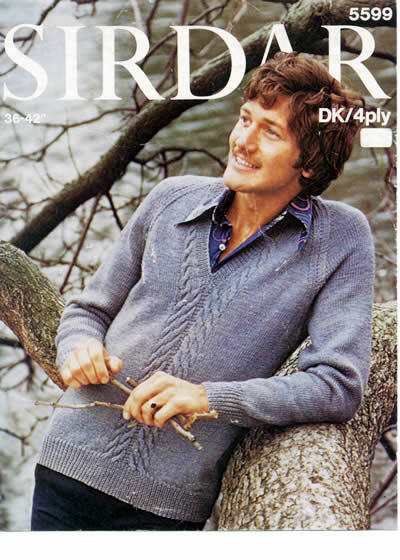 Description: V-neck sweater in fisherman's rib or brioche stitch in smaller sizes up to 34 inch chest only. 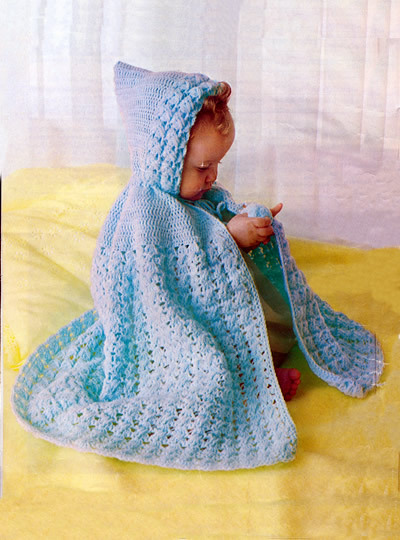 The yarn is a fluffy type which means you knit on larger needles and get a larger tension. 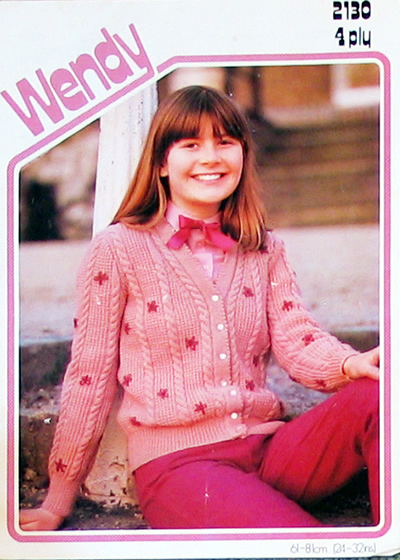 Despite the photo I do not see any sign that the pattern has a V both front and back - the picture shows the girl wearing the sweater back to front (as was fashionable in the 80s to have V-back tops). 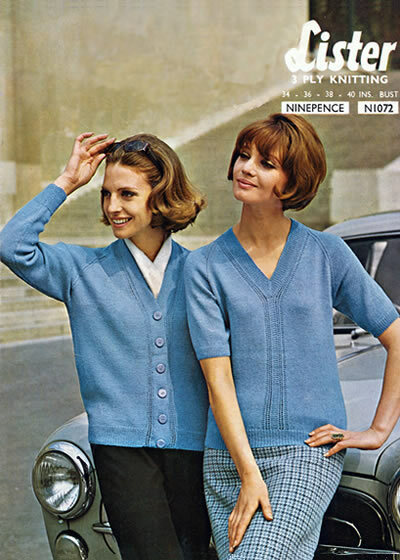 Description: Classic cardigan - perfectly plain or eyelet pattern. 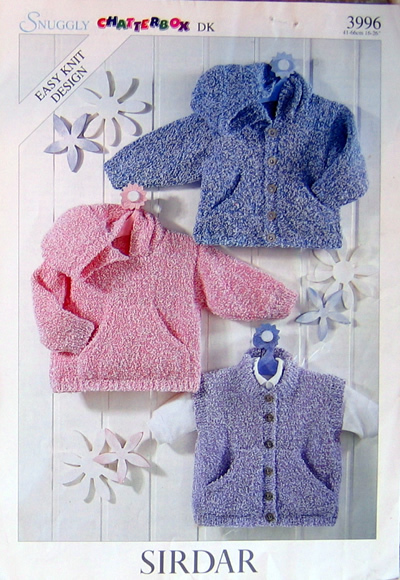 Description: Elegant twin-set where both cardigan and top have long sleeves. 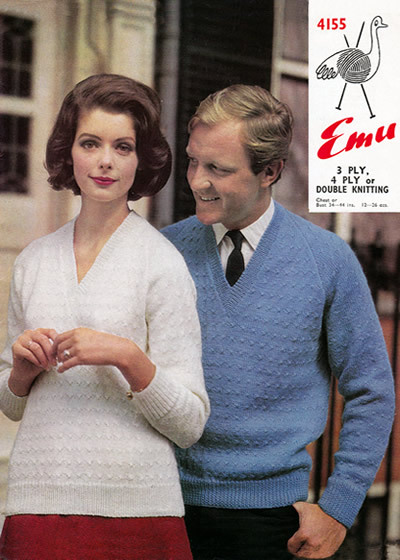 Knitted in 4 ply - a soft luxurious pure wool (Pingolaine). 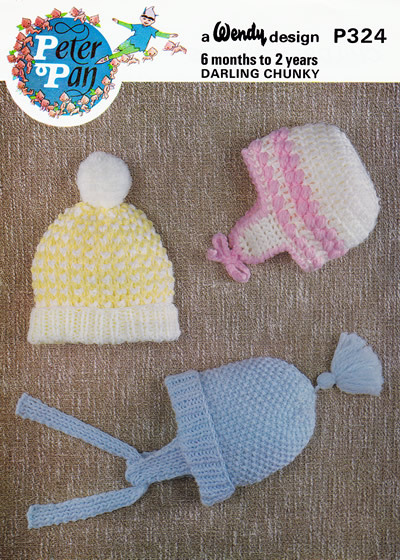 Description: Pretty hats in chunky yarn for children. 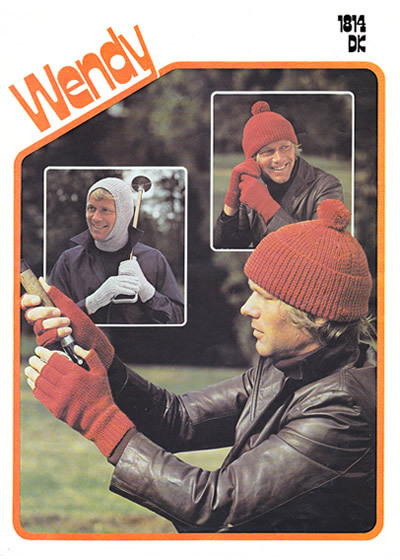 Description: Straight forward and plain gloves, mittens bobble hat, and helmet for men. 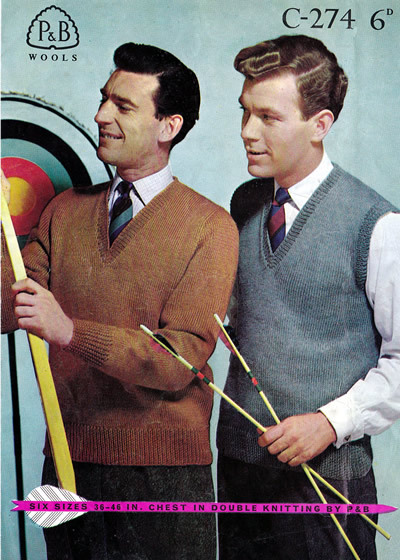 [Men that fish it seems]. 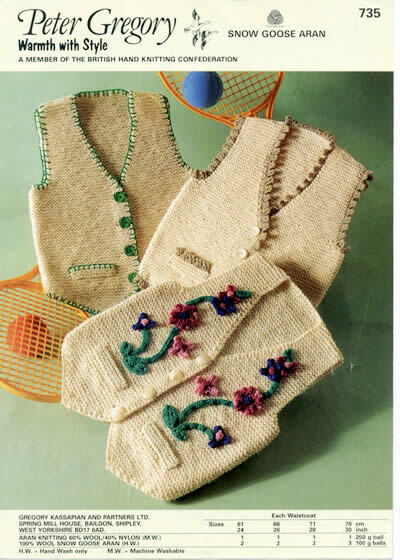 Description: Sleeveless summer top with buttons at shoulder. 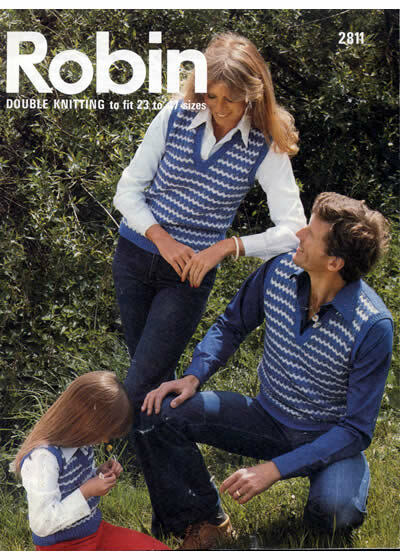 Description: Conventional waistoat or vest with front panel pattern and optional pockets, in a range of family sizes. 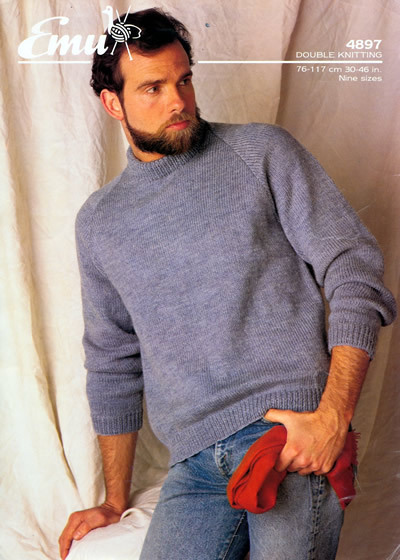 Description: Loose-fit polo-shirt style sweaters in fisherman's rib or brioche stitch. 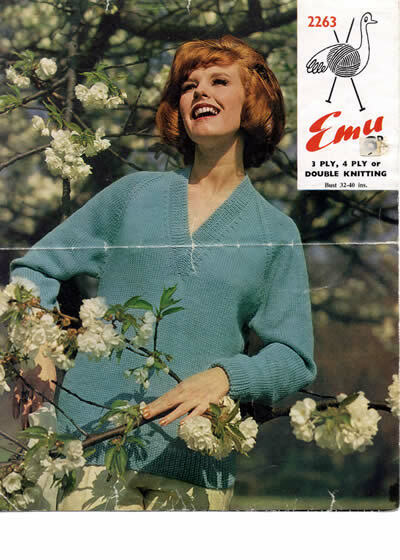 Description: Summery sweater in soft cotton-type slub yarn. 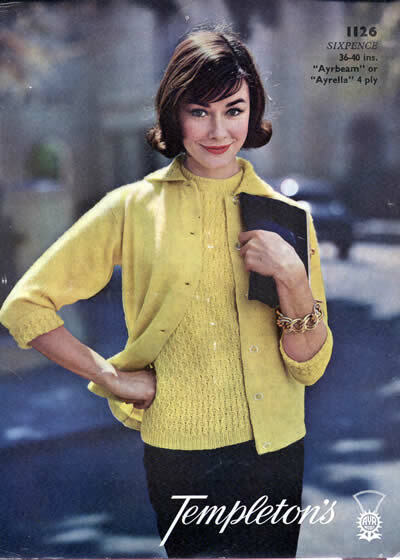 Description: Chunky eyelet pattern sweater, with side panels kitted sideways to create a dolman-like sleeve. 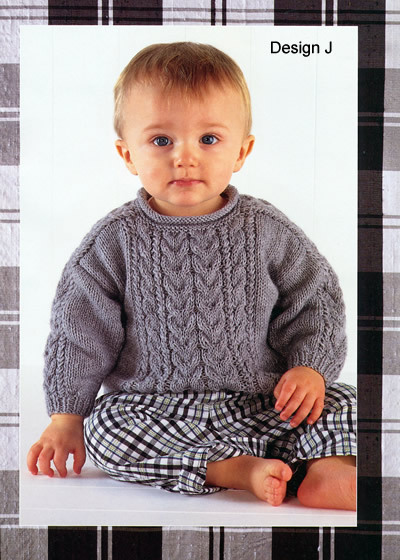 Description: Plain V-neck raglan sweater in a limited size range but in a choice of yarn weights. 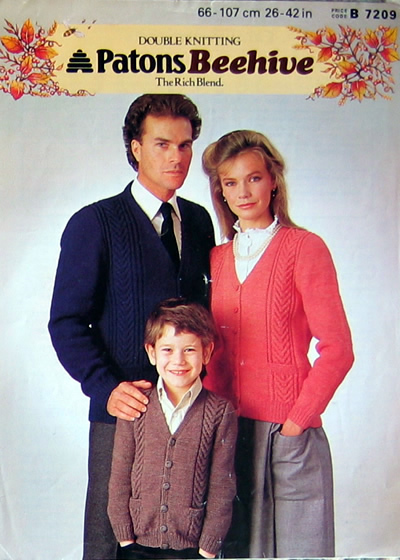 Pattern is in good condition. 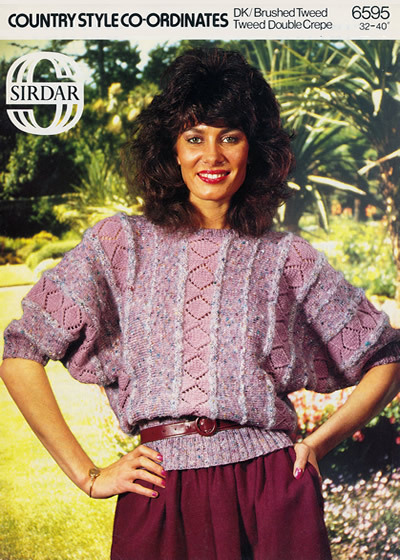 Description: Shetland sweater in cable pattern with blackberry stitch variation. 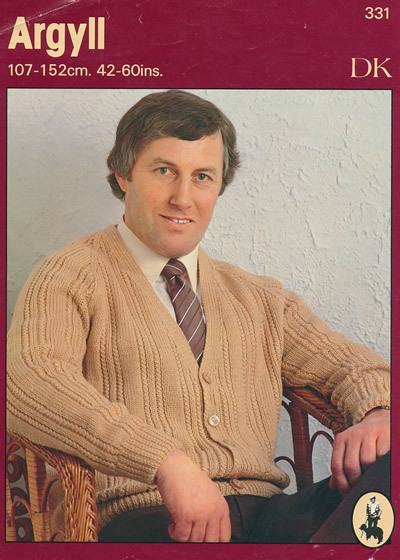 Description: Aran style cardigan in lighter weight double knitting yarn. 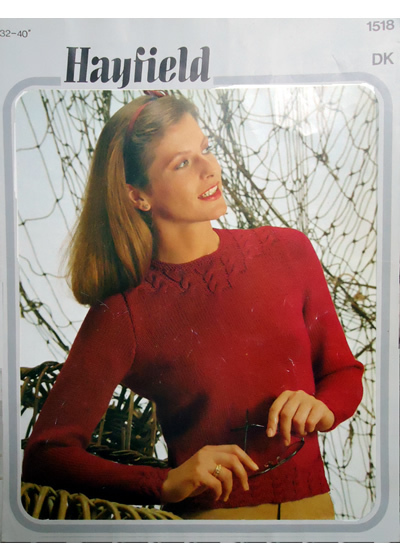 Description: Plain sweater with a decorative stitch panel at the yoke in a worsted or Aran weight yarn called triple knitting (between a DK and a bulkier yarn). 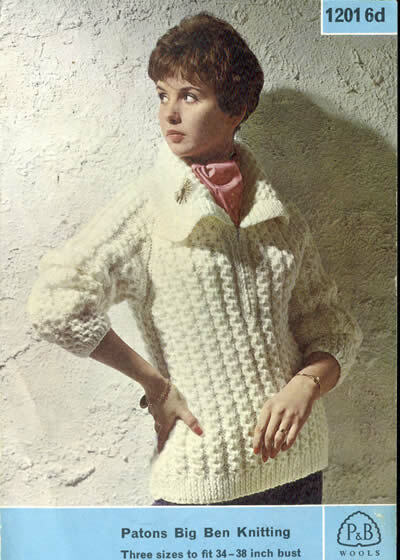 The sweater has a back neck opening which has a crochet edging. 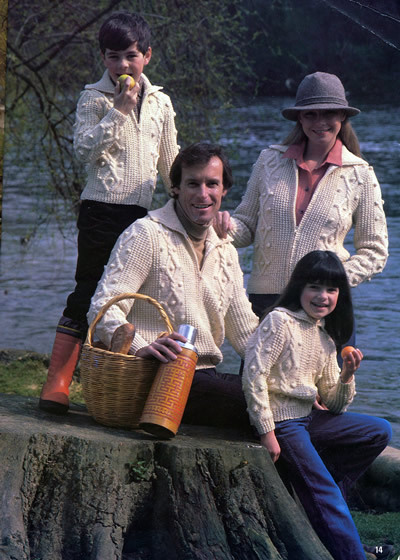 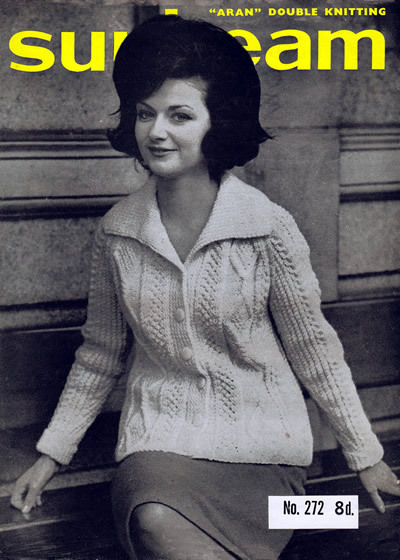 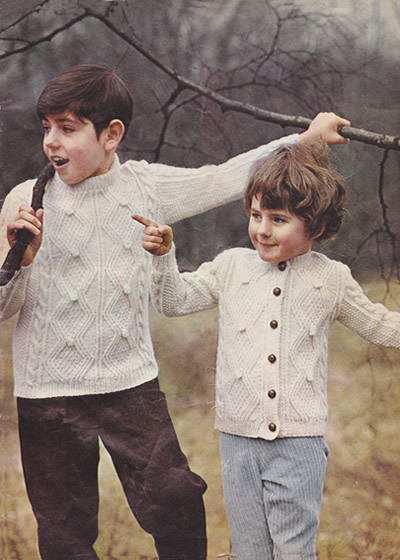 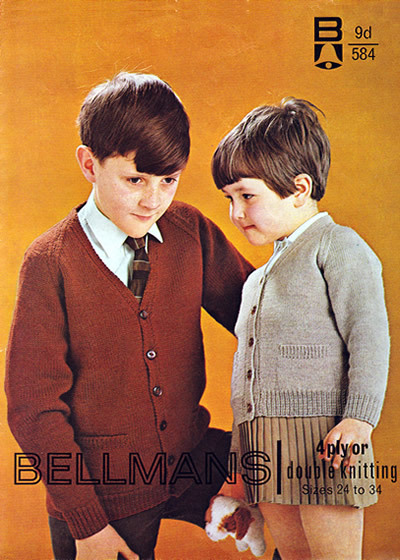 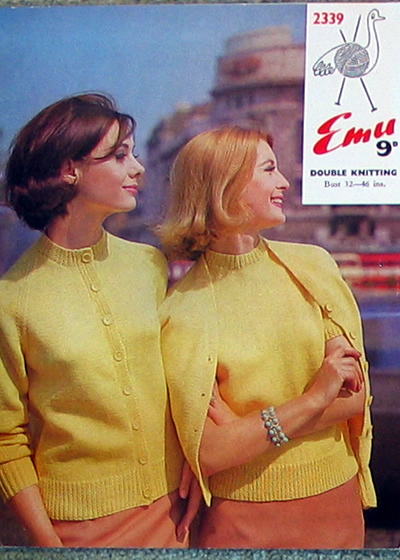 "Triple knitting" appeared in all the main manufacturers product lines in the 1960s; although more or less a worsted weight it did not seem to become popular enough to gain the traction in the UK to replace double knitting as the standard yarn. 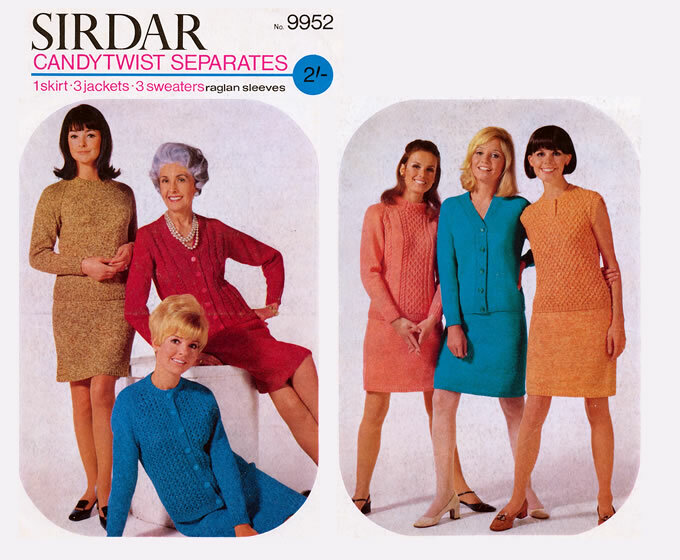 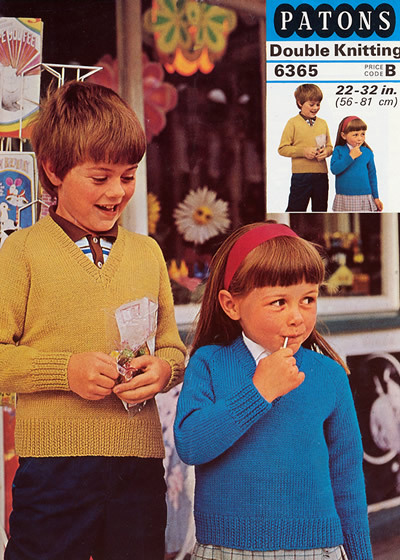 Sirdar produced a clutch of patterns for their Candytwist yarn - many of them featuring classic straight sixties jacket/skirt combinations, and all relatively plain to show off the tweedy texture in the yarn. 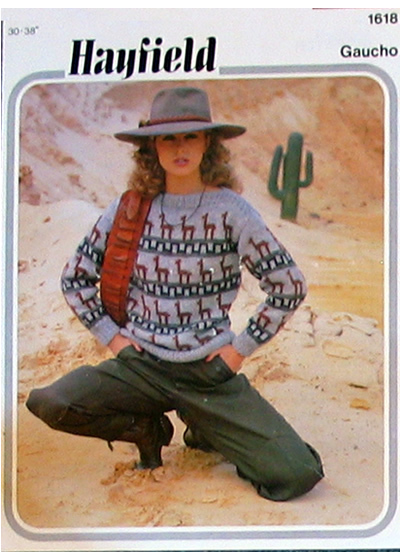 Description: Women's plain chunky sweater. 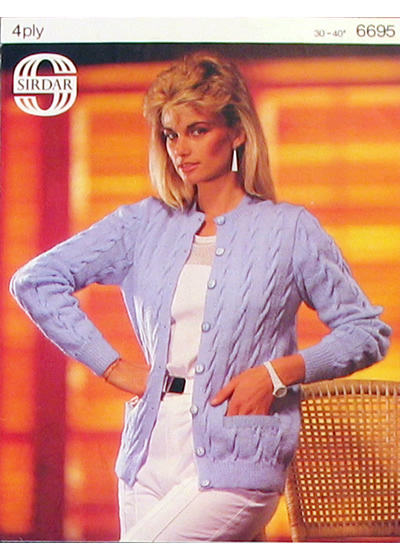 Description: Classic cardigan with a mock cable effect using twisted rib style stitch. 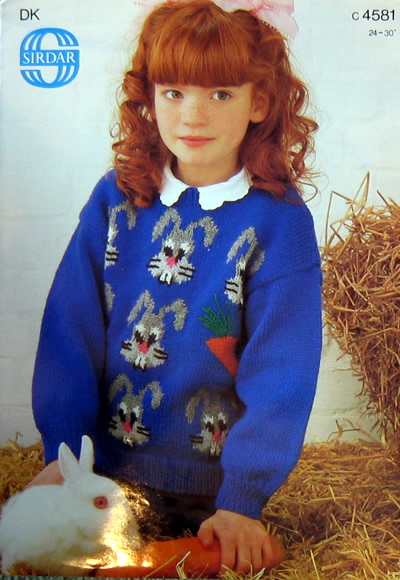 Description: Interesting design cotton slub summer sweater. 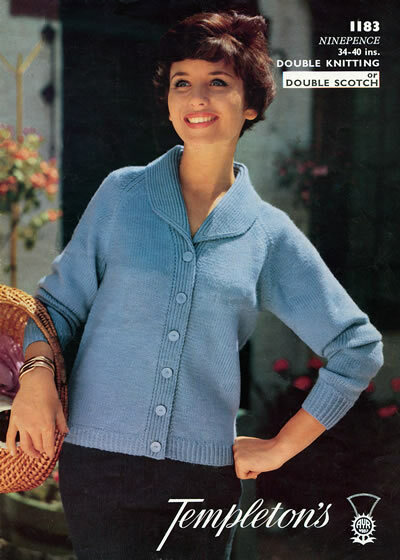 Description: Classic plain cardigan with collar. 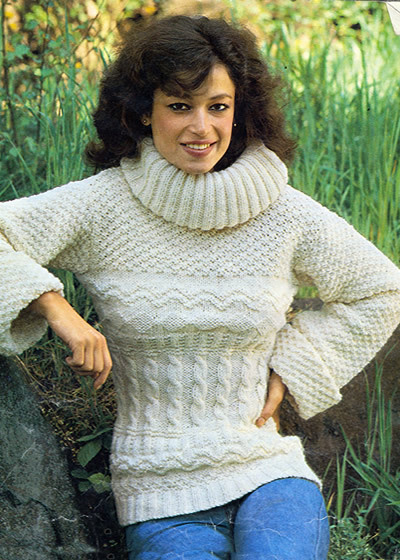 Description: Textured V-necks with 3 versions in 3ply, 4ply, or double knitting. 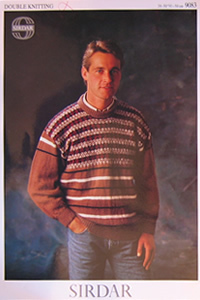 Description: Men's plain pullover or slipover. 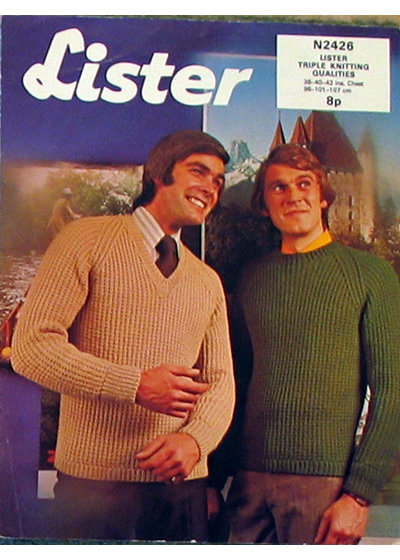 Perfect for slipping down to the village green for that legally required archery practice (or a pint). 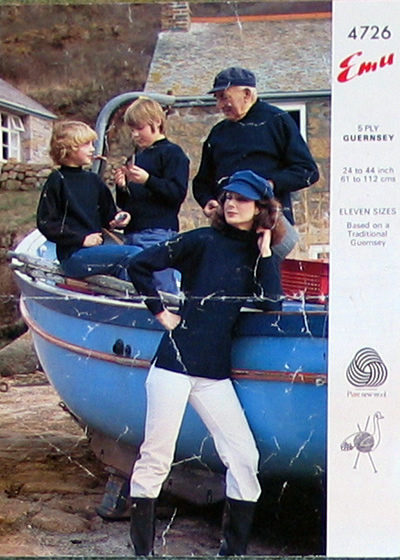 Some surface creasing to the photo (not shown) and some working marks on instructions by previous owner. 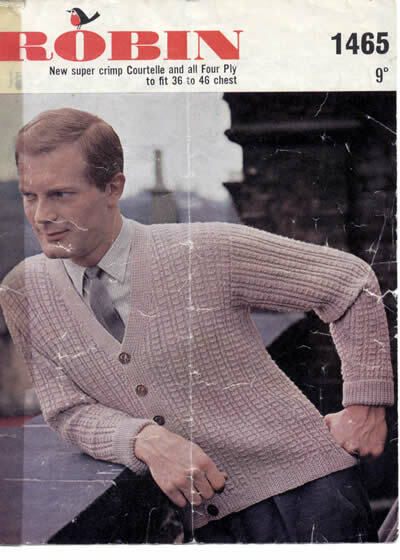 Description: Perfectly plain man's jacket or cardigan with 3 versions in 3ply, 4ply, or double knitting. 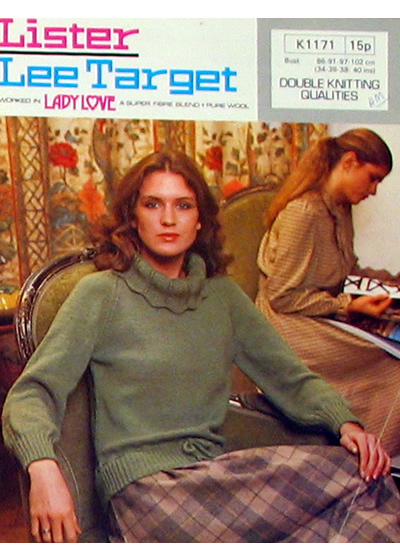 There is a definite vertical crease line on cover picture (not shown in photo) which does not affect the instructions. 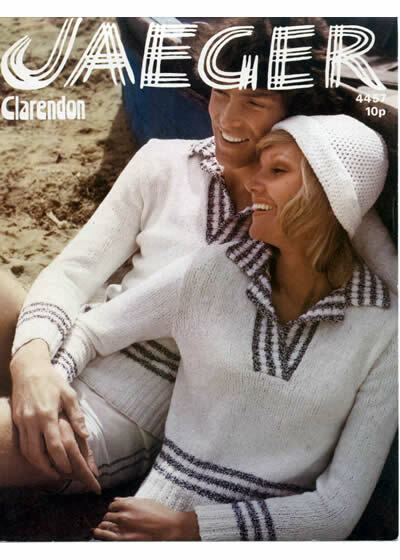 Description: Eighties cotton summer slipover. 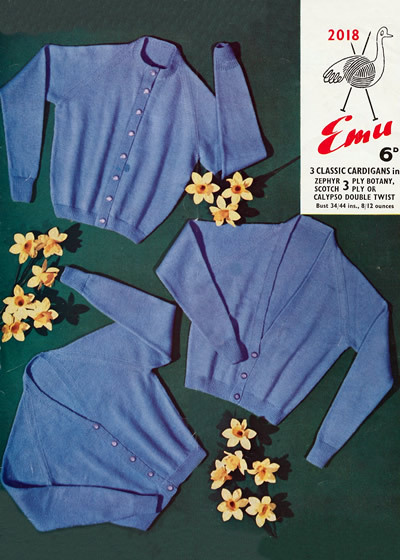 Description: Long line cardigans. 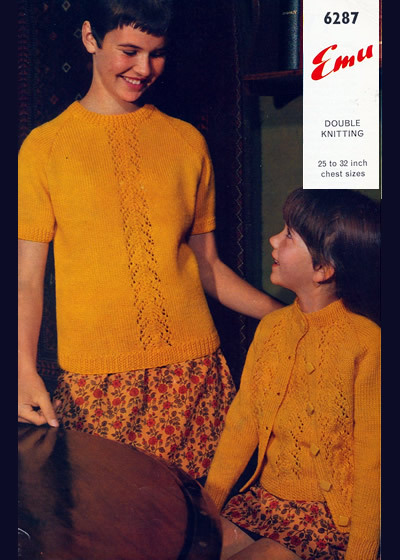 There are 4 sets of instructions included: a plain and a cabled version each given for double knitting or 4 ply. 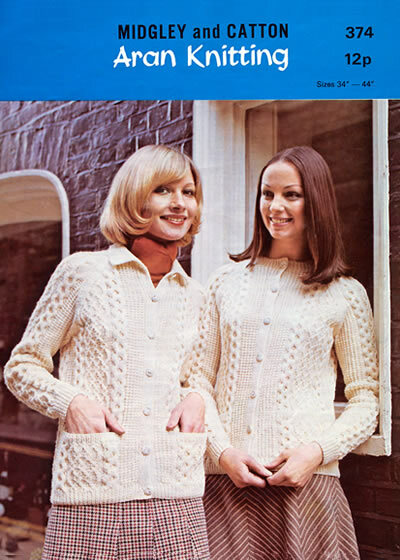 The pattern has the usual vertical crease which affects the cover photo but not the instructions. 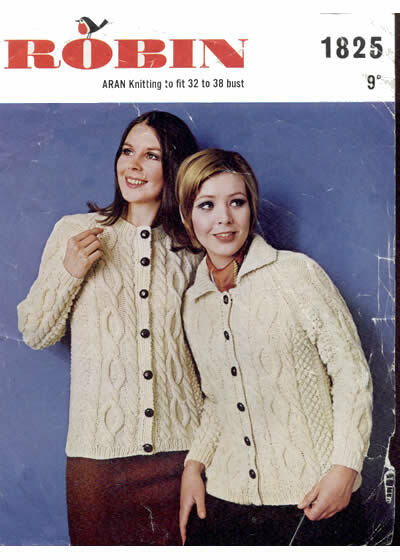 Description: Classic Aran style jackets in a lighter weight Aran which Sunbeam call "Aran Double Knitting" and seems to be a worsted weight yarn. 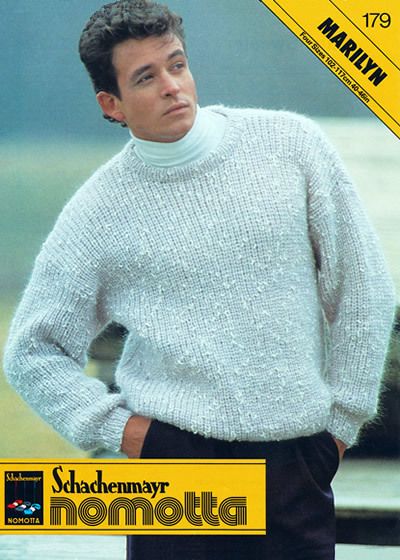 Description: Perfectly plain roll neck sweater. 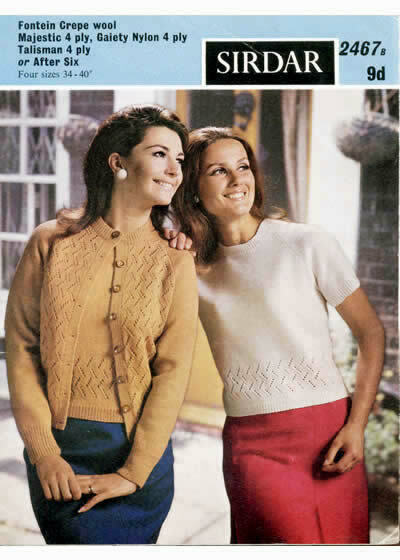 The pattern has a vertical crease which affects the photo (not shown) but which does not affect the instructions. 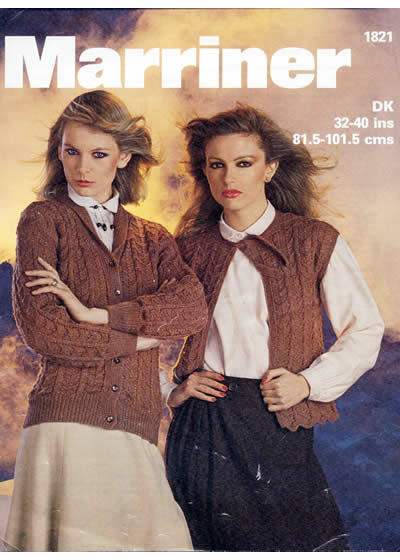 Description: Ribbed cardigan calling for Motoravia DK which was always pretty standard however the needle size called for is larger than usual with a larger tension. 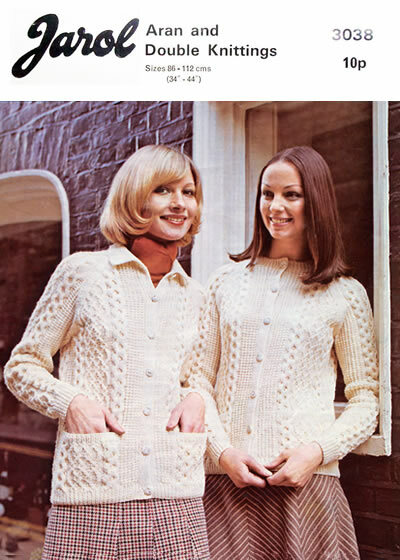 The pattern has a vertical crease which affects the cover photo but not the instructions. 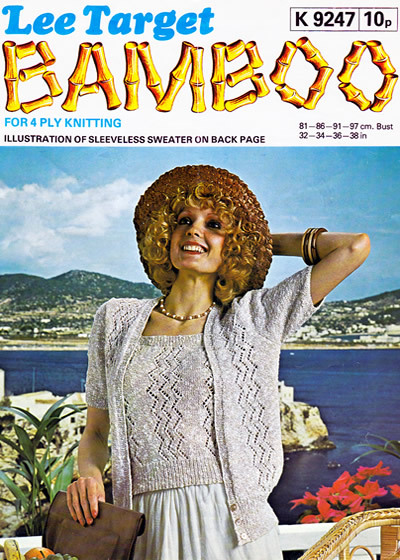 Description: Loosely fitting sun-top using a vertical drop stitch technique to create a lacy effect. 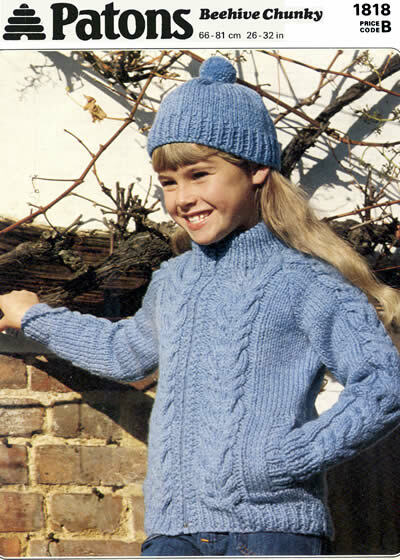 The yarn is equivalent to a DK but is nubbly in texture and this design is knitted on 5mm needles giving a tension more like worsted or Aran. 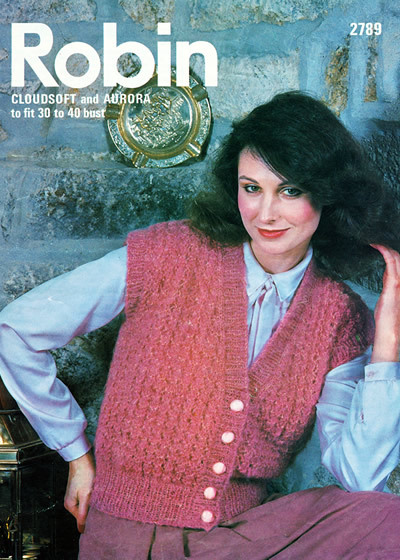 Description: Textured cardigan in a heavier double knit or worsted; the two sizes just use different needles (5½mm and 5mm) to alter the tension, which is more like that expected for an Aran or light chunky weight tension. 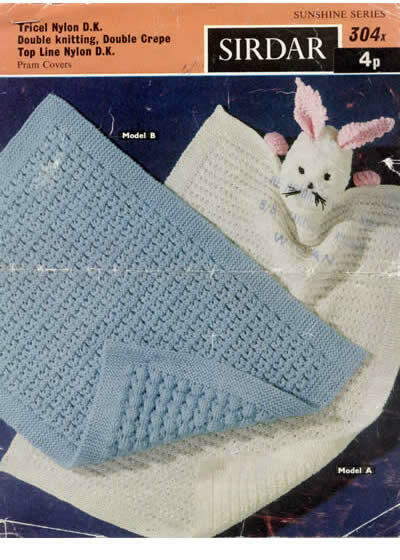 The pattern has a light horizontal crease on the photo, which does not affect the instructions. 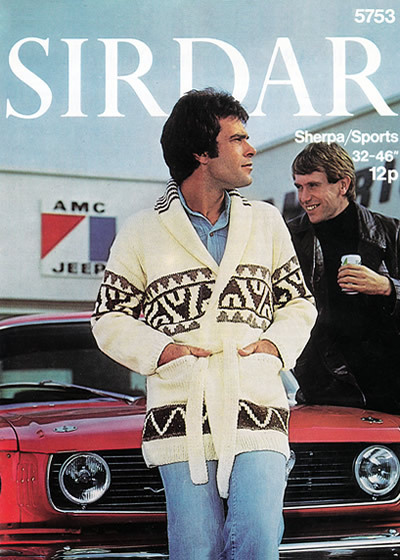 Description: Iconic "Starsky and Hutch" cardigan. 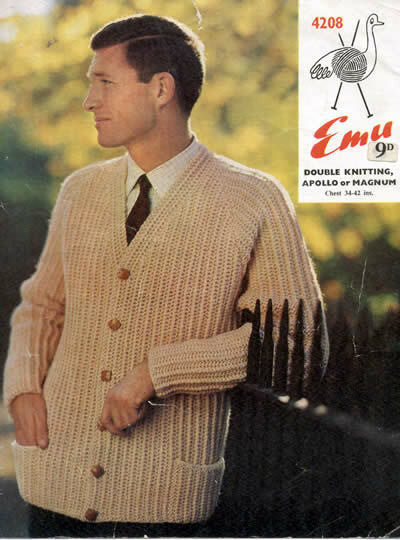 Man's design but down to a 32 inch chest so could fit younger folk or women. 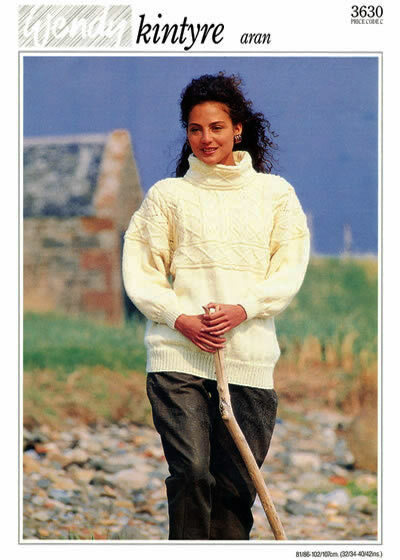 Description: Traditional plain guernsey in sizes for all the family. 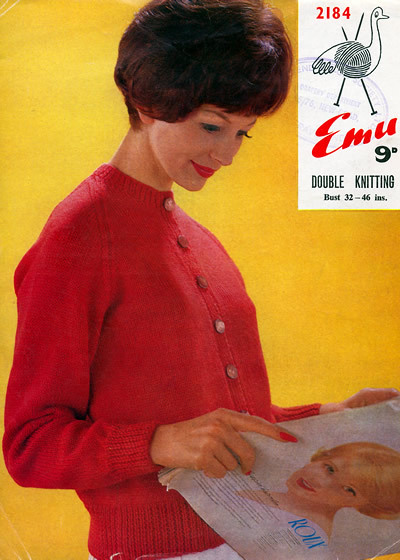 There is some surface creasing and a small tear but this does not affect the instructions. 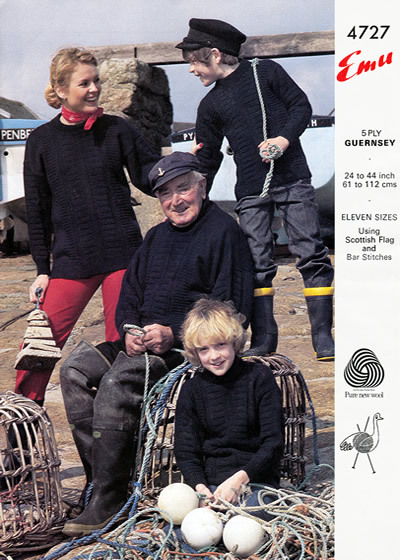 Description: Traditional guernsey in sizes for all the family using traditional Scottish Flag and Bar stitches. 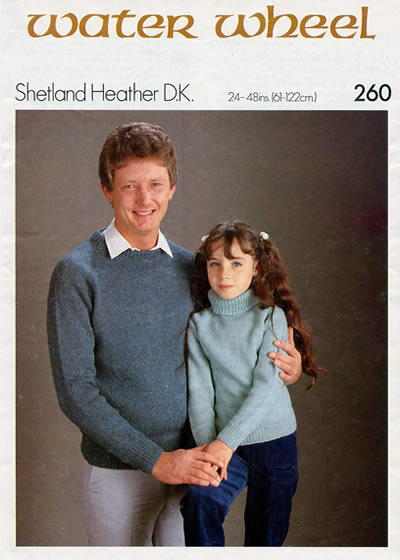 Description: Family sweaters ("Father and Daughter"). 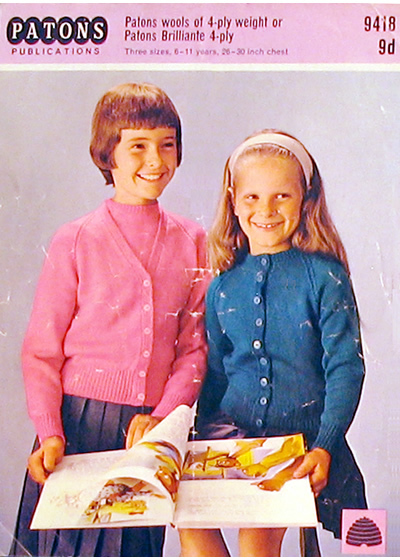 Description: Kids plain school cardigans, with separate sets of instructions for 4ply and double knitting versions. 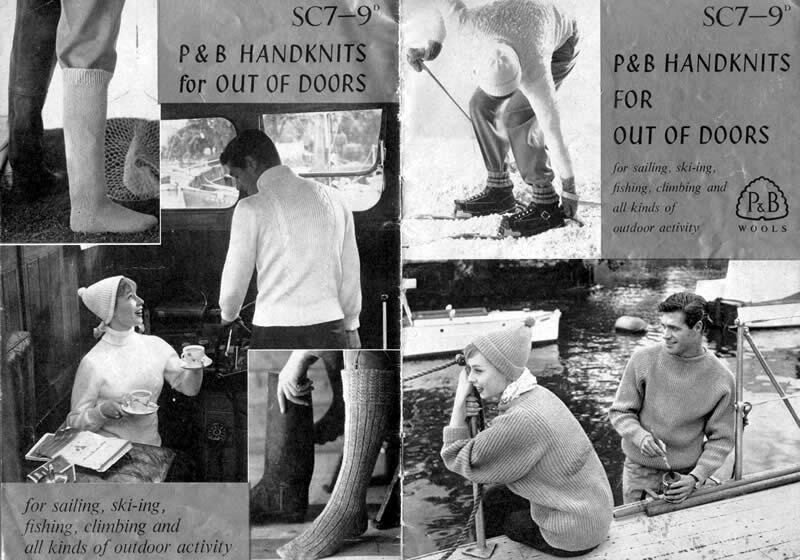 Wool brand: Scotch / Zephyr / Calypso 3ply; Scotch / Zephyr / Super Crepe 4ply; Scotch / Double Crepe / Romany / Bri-Nylon double knitting. 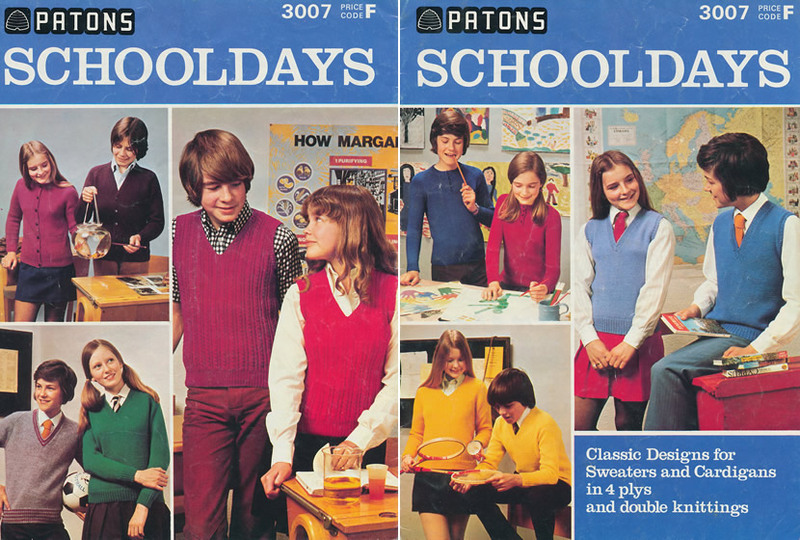 Description: School V-neck sweaters with 3 sets of separate instructions given for 3 ply, 4 ply, and double knitting. 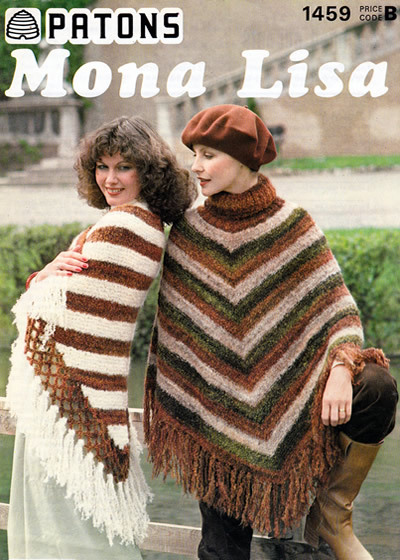 Tension (10x10cm): between 20sts x 24 rows and 22sts x 29 rows depending on yarn. 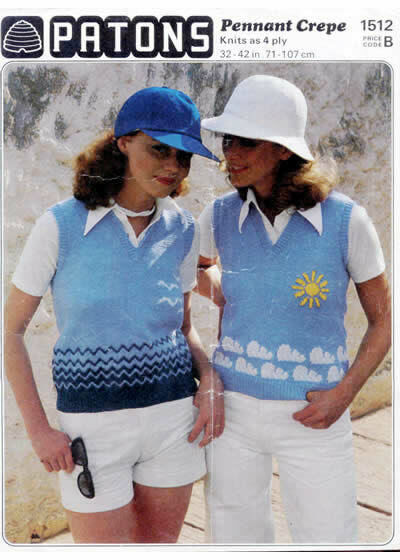 Description: Summer cotton sun-tops - 4 separate patterns of the same design using different wool brands. 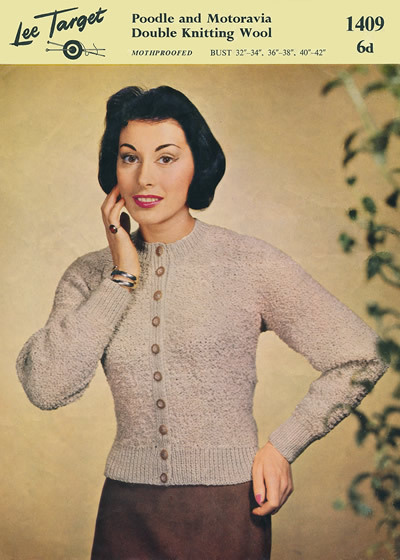 Description: Cable sweater in a brushed chunky yarn. 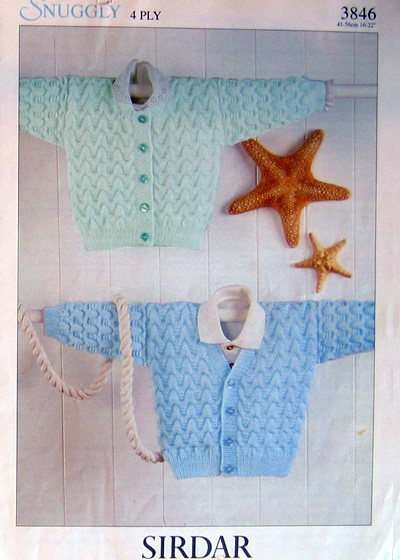 Description: Two DK cardigans with separate patterns supplied for each - one Aran-style, one a textured stitch. 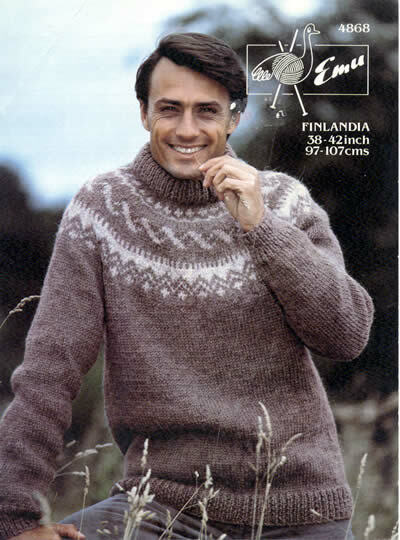 Description: Men's plain pullover or slipover with separate sets of instructions for 3 fine yarn weights (2 ply, 3 ply and 4 ply). 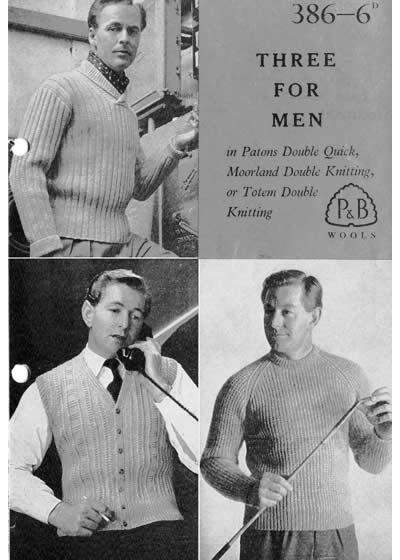 Pattern is sized from 36- 40 inch chest designed for smaller or younger men but presumably also ok for women. 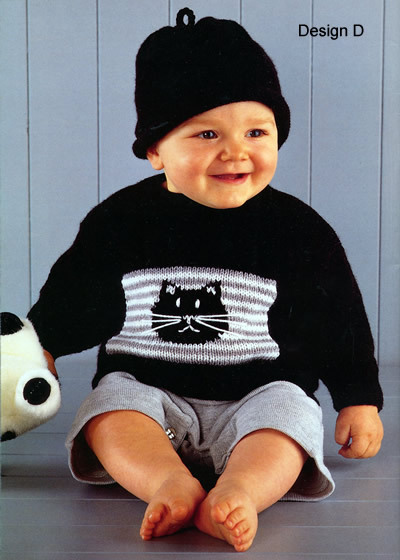 Description: Men's plain pullover or slipover with V or crew neck. 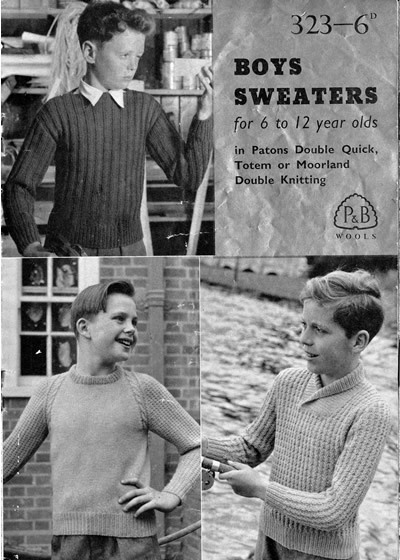 Description: Lighter weight school sweater or slipover in 4 ply. 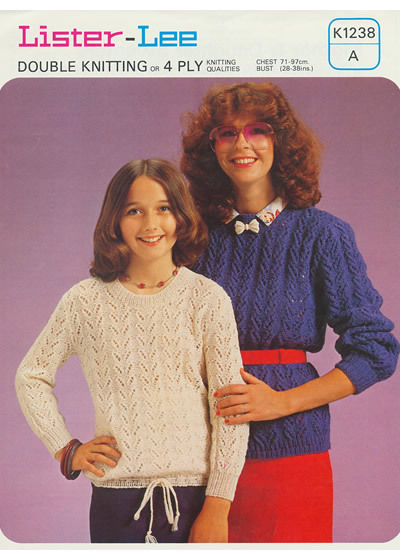 Yarn quantity: 13 (1 oz balls) in white and 9oz in contrast. 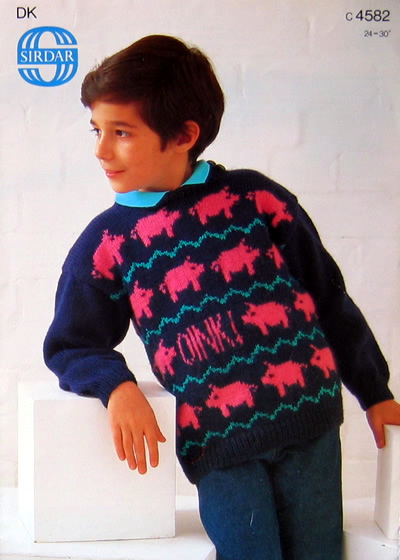 Description: This is a lovely wearable jerkin but sadly only in one size. 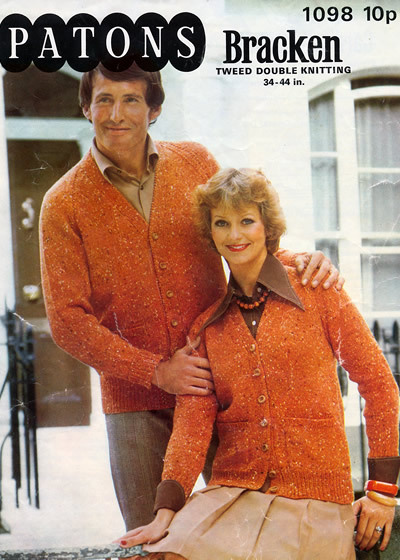 Try to ignore the fact that the model looks like Liberace, (or maybe that's the charm of it...). 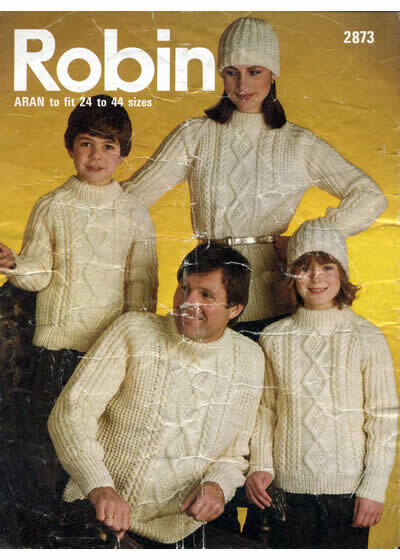 Yarn quantity: 3-8 (4 ply); 4-9 (DK); 5-12 (Aran); 5-12 (chunky) - 50g balls. 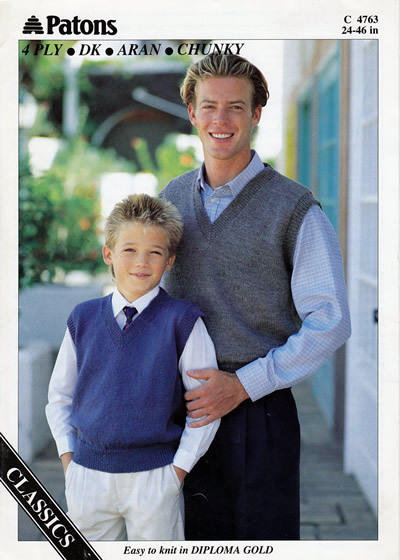 Description: Father and son sweater or slipover - but suitable for all the family. 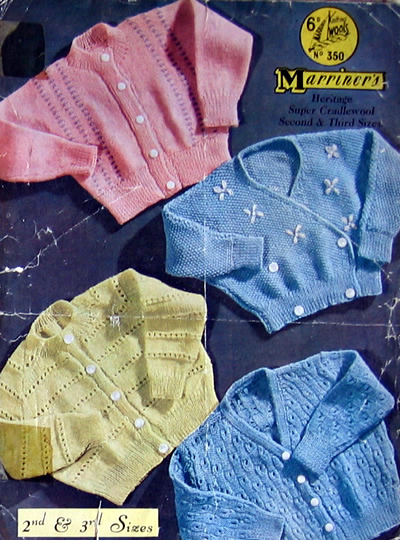 The pattern instructions are given for 4 different yarn weights. 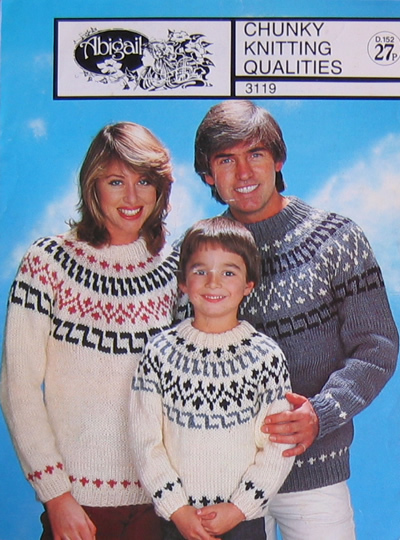 Pattern in good condition, but some pen markings and annotations. 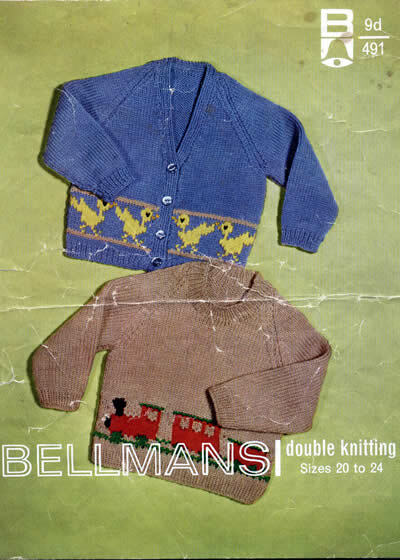 Yarn quantity: Short sleeved jumper: 7-9 (1 oz balls); cardigan: 10-13 balls. 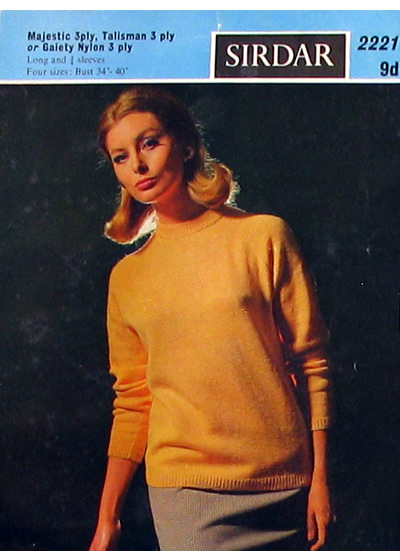 Description: Plain sixties twinset with stitch detail on jumper. 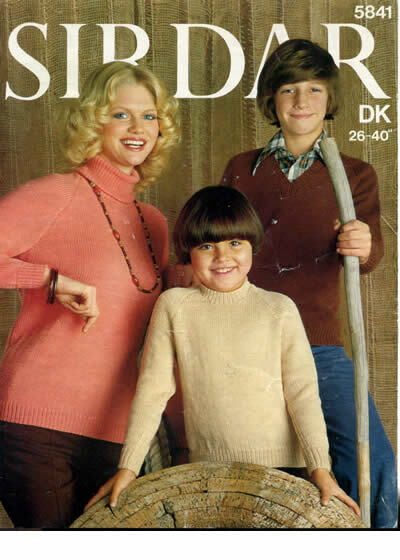 Wool brand: Any Falcon DK. 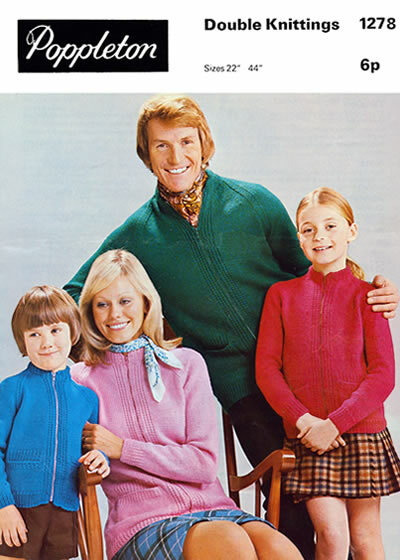 Description: Family sweaters . 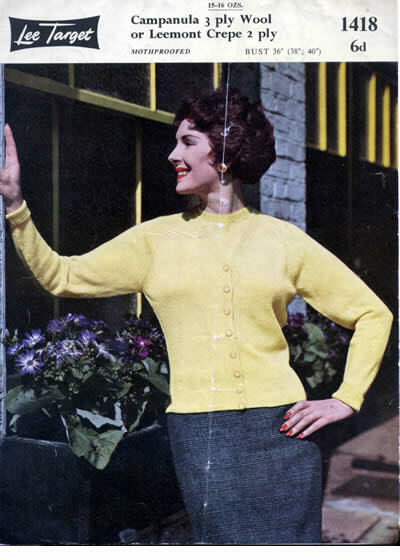 Pattern has surface creasing with vertical crease not shown in photo - instructions not affected. 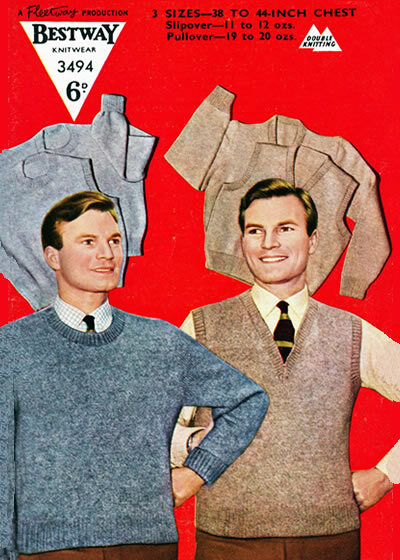 Description: Perfectly plain sweaters for men. 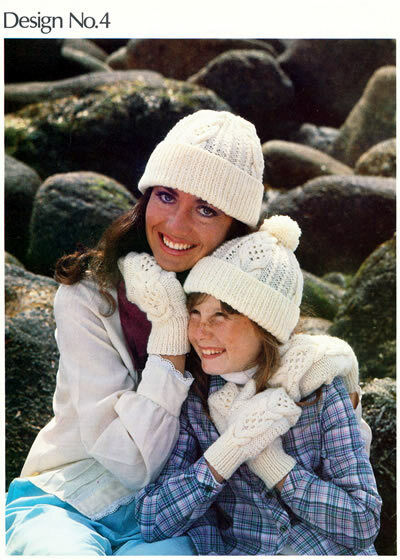 Original knitted in a bouclé yarn but you can substitute any double knitting weight yarn, but check your tension, as this pattern is knitted on finer needles than usual. 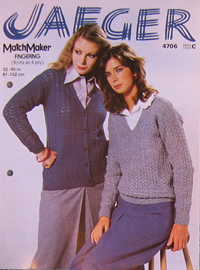 The pattern is in generally good condition but has 2 light vertical creases. 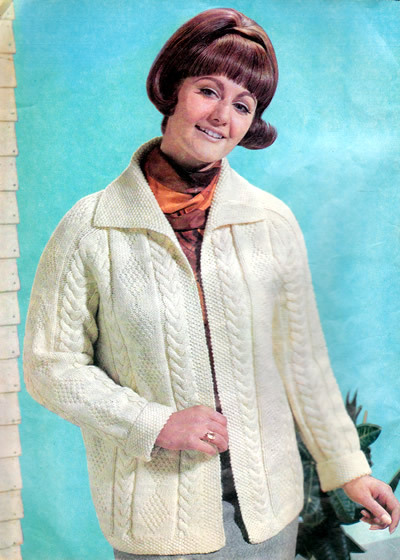 "See how I can use this electric circular saw thingy without even looking..."
Description: Zipped jacket with textured twisted rib stitch in choice of wool weights. 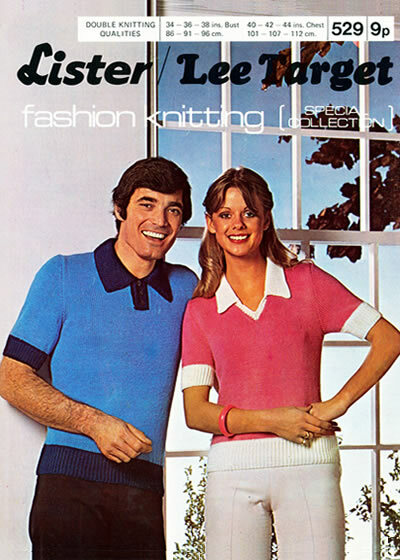 Description: Cheerful plain-knit colour-block T-shirt style tops for him and her. 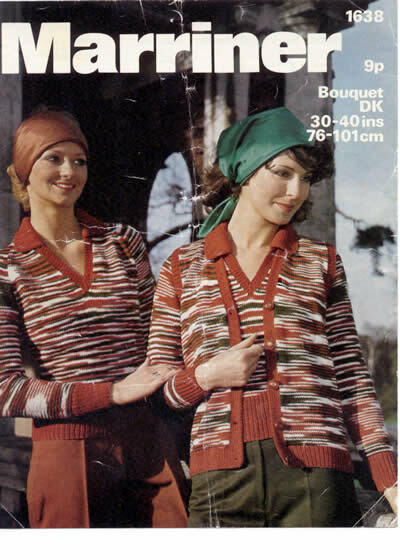 Style shown on the woman was very popular for a period in the 1970s and often worn over a shirt, (ask me how I know...). 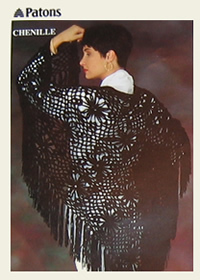 Description: Feather and fan or old shale type pattern in a cotton blend yarn for summer. 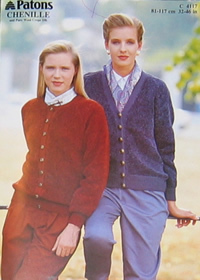 Description: Classic plain cardigans for a high or V neck plus an option for a deeper V-neck. 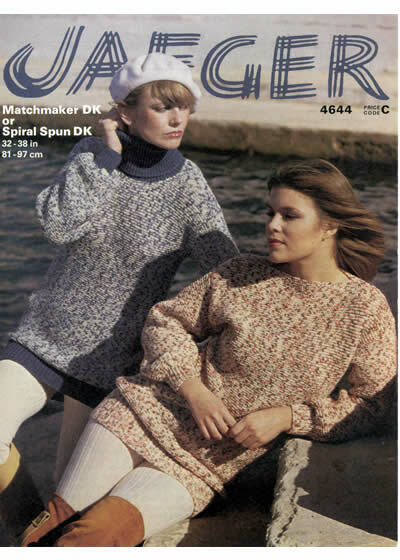 Description: Different design options for 2 sweaters - the only thing they have in common seems to be that they are knitted sideways. 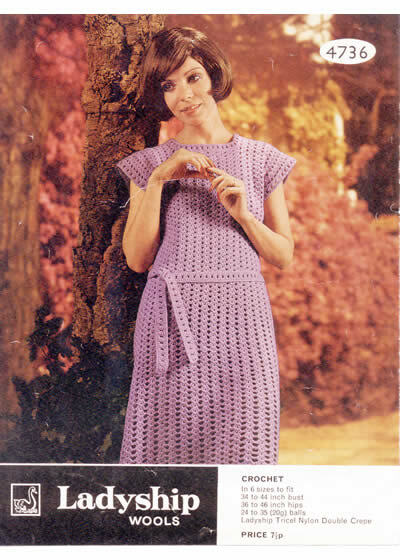 Description: This is a loosely knitted summer dress. 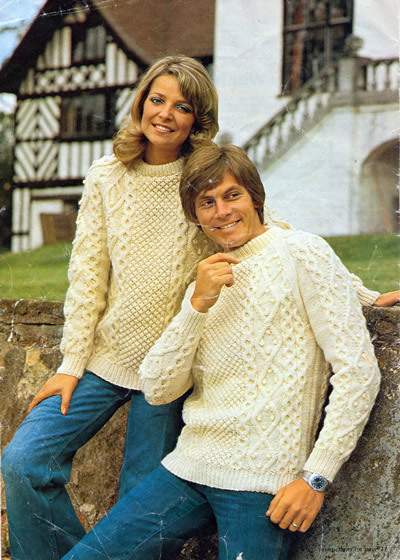 The original yarns were cotton slubs - this pattern is knitted on 8mm needles to achieve the relaxed tension. 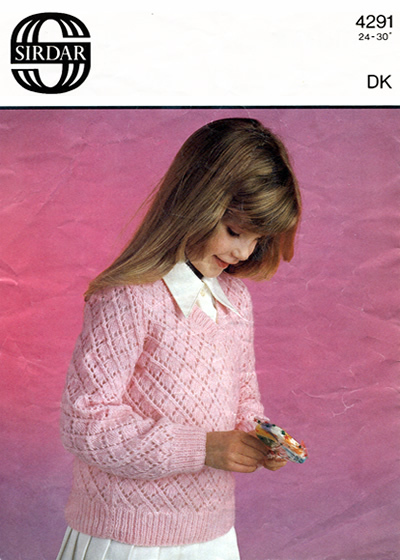 Description: Sweet little girl's DK sweater. 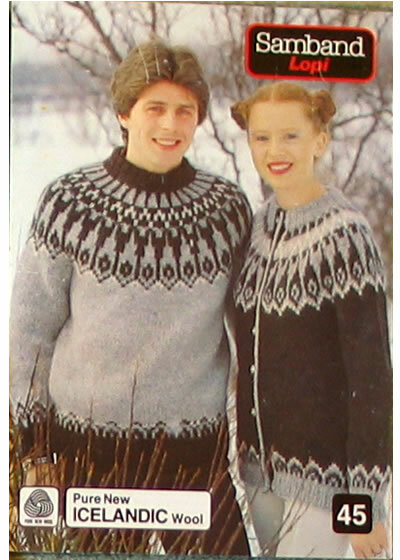 Instructions are fine with some surface creasing on front photo. 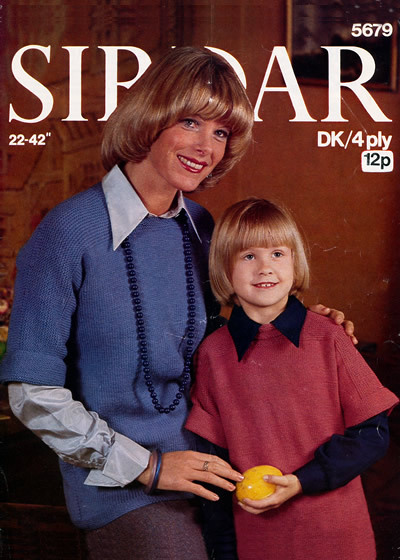 The leaflet is in good condition. 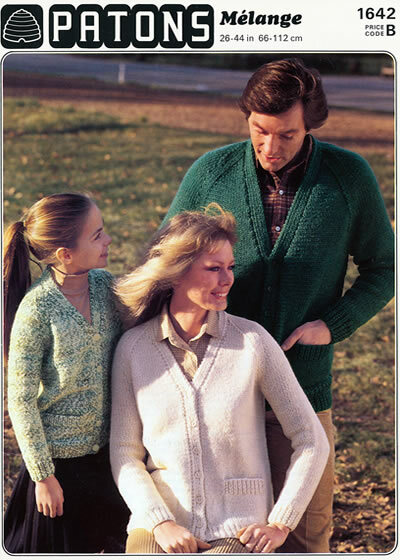 Description: Lighter weight classic family sweaters in a wide range of sizes. 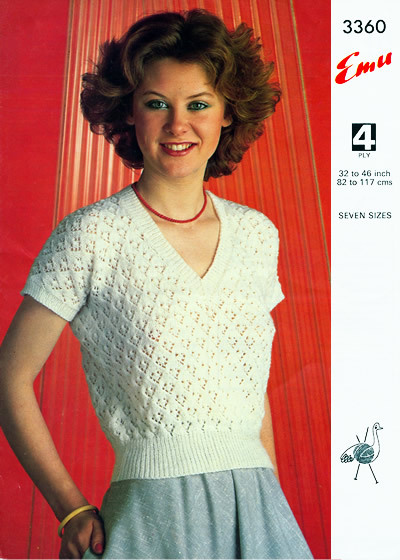 Yarn quantity: 8+2 - 10+3 (50g balls in 2 colours) - less 3 balls for sleeveless version. 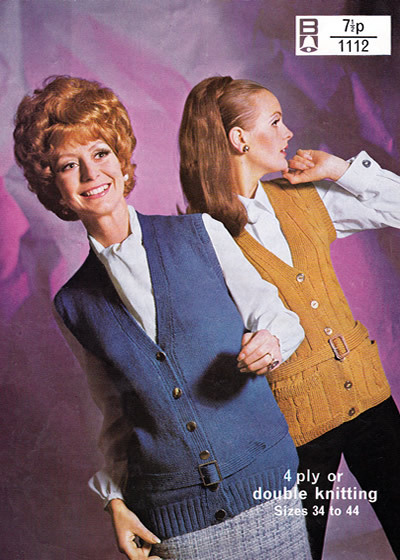 Description: Tweed cardigan with sleeveless option. 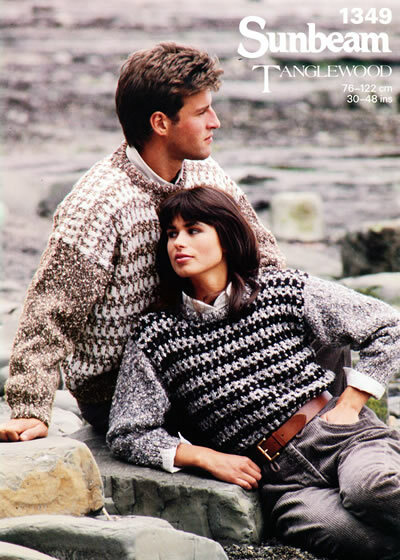 Description: Patterned Aran-weight sweaters with the best of eighties styling. 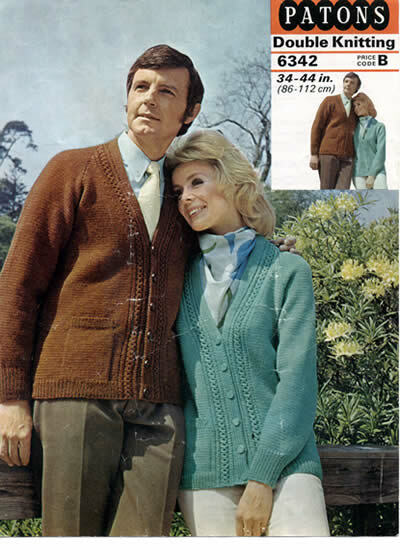 Description: Plain V-neck cardigan or sweater for Him and Her. 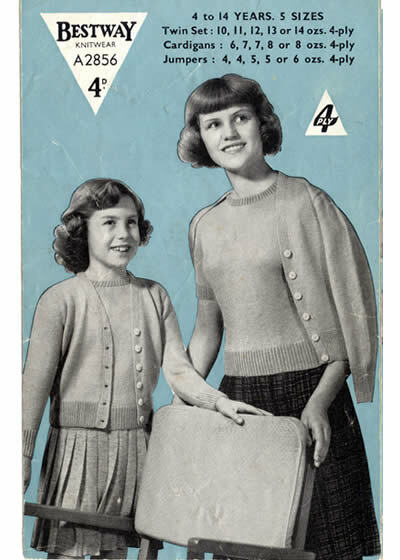 And the choice does not end there - with separate instructions for both sweater and cardigan in double knitting or 4 ply weight yarn. 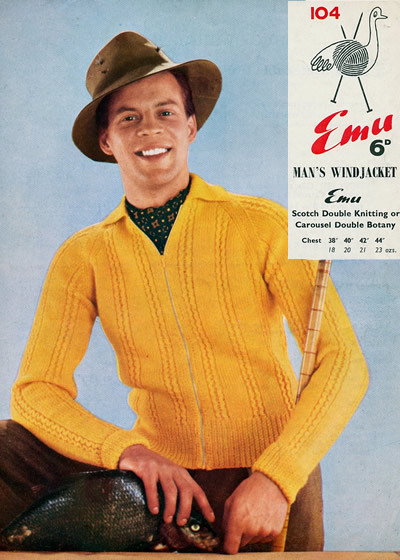 Description: Traditional man's cable cricket (or tennis?) 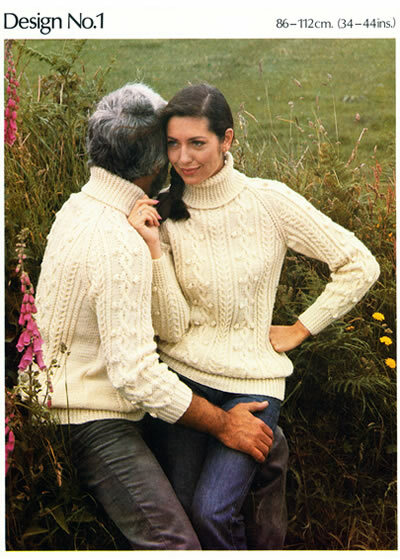 sweater. 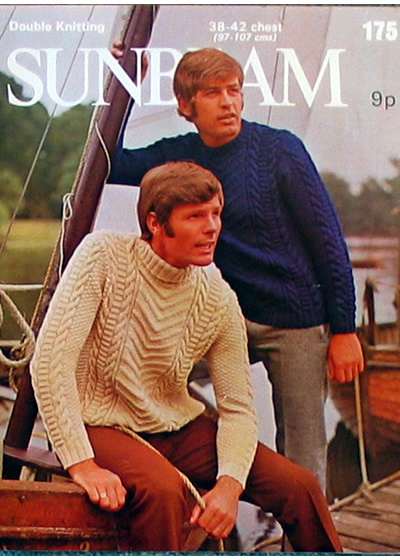 Description: Depicted as an Aran weight sweater for sailing but can't decide if it might not be a cricket sweater. 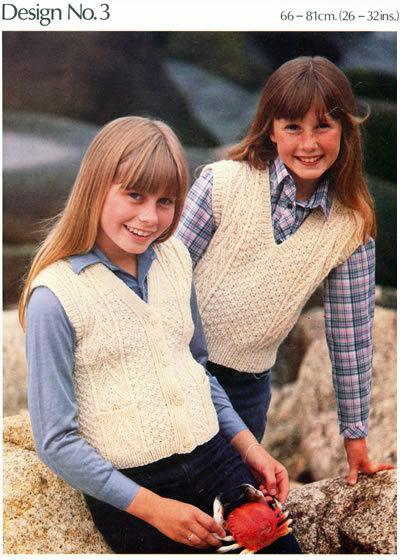 Yarn quantity: Tunic: 2+2+2; Cardigan: 2+3+3 (both 100g balls Aran in 3 colours). 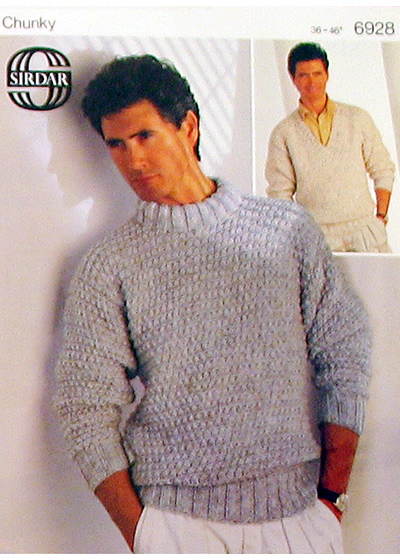 Sweater: 7-10 (50g balls 4 ply). 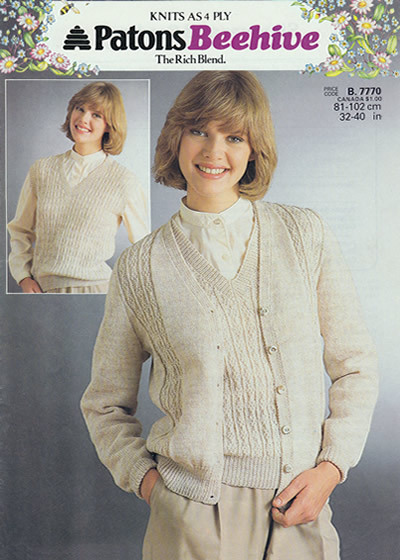 Description: This pattern includes a lighter weight easy-fit 4ply raglan sweater which can be worn in combination with an Aran cardigan jacket. 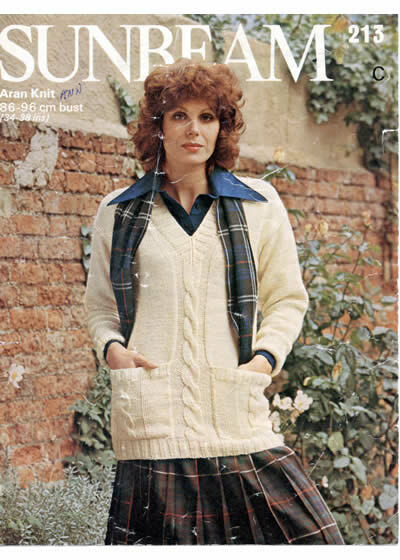 There is also a wide/boat necked tunic option in Aran weight, which, like the jacket, gives instructions for the wide striped pattern. 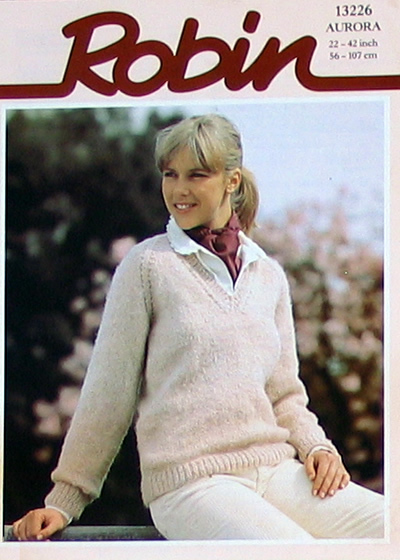 Description: Guernsey style sweater in Aran weight yarn rather than 5 ply. 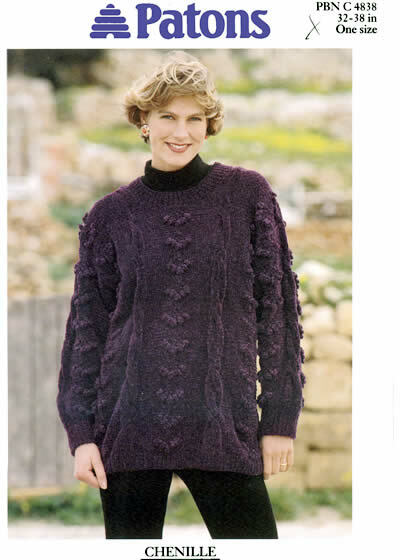 Description: Chunky textured sweater featuring one of my favourite stitches (blackberry or trinity stitch). 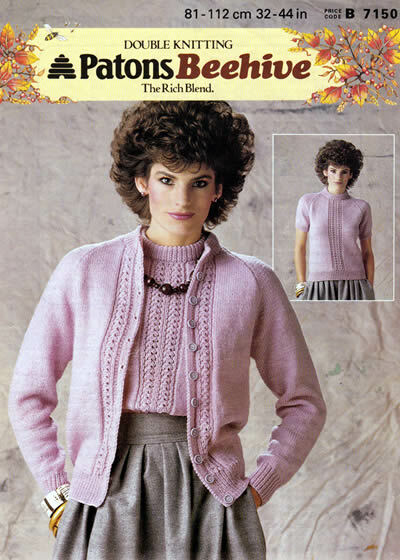 Note that teh tension implies this is a lighter weight chunky yarn - almost Aran weight. 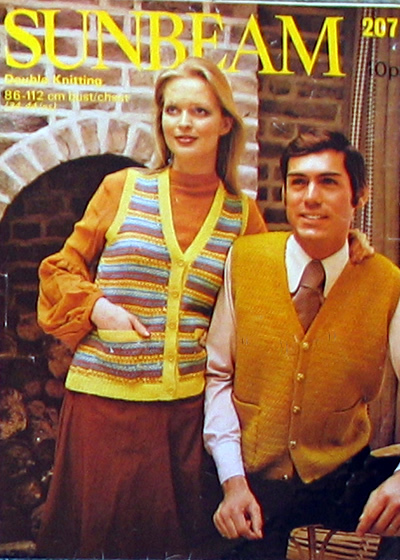 Description: Women's Aran-style waistcoat in lighter weight yarn, with pockets. 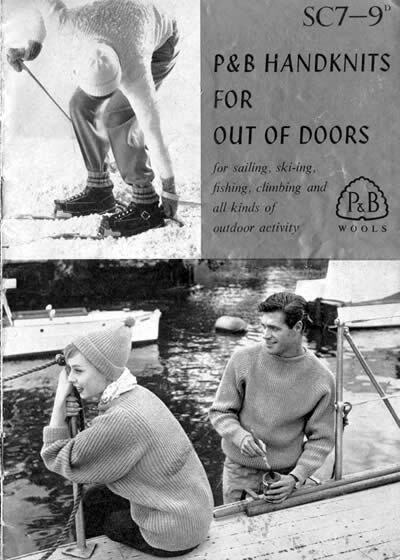 Light creasing which does not obscure instructions. 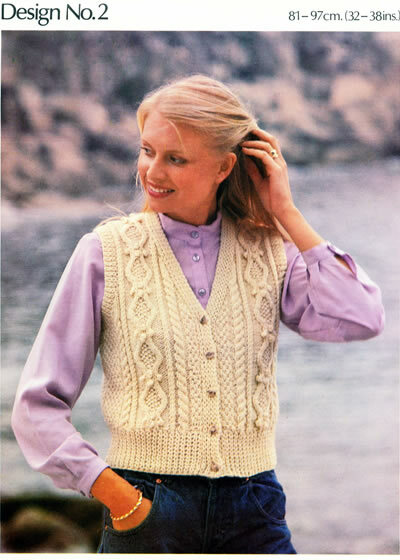 Description: Women's Aran cabled waistcoat with pockets. 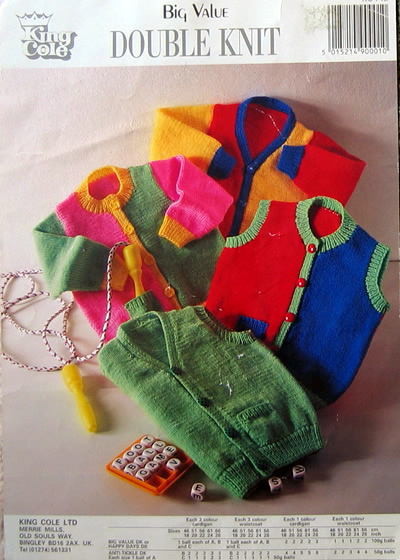 Sizes: 22 - 32 inch chest (6 sizes). 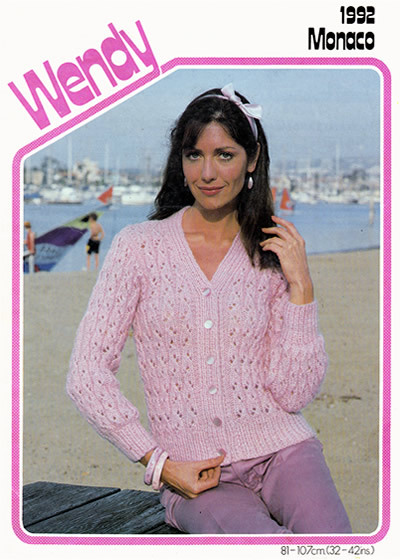 Needle size: 4mm and 6mm. 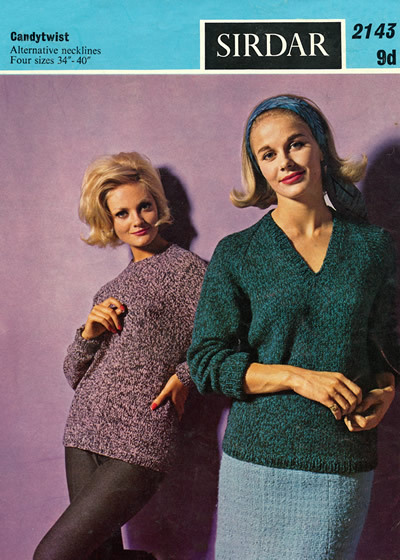 Description: Plain sweaters with high necks. 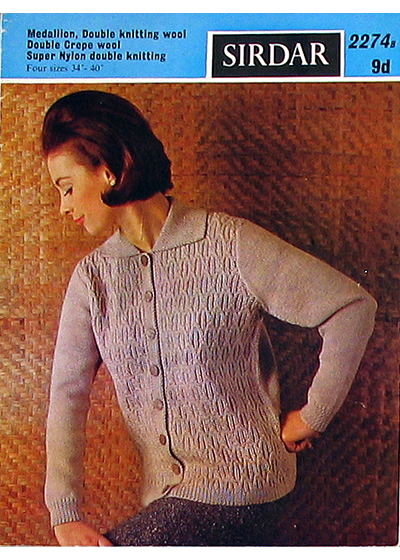 The pattern is worn with a strong vertical crease (not shown), but this does not affect the instructions. 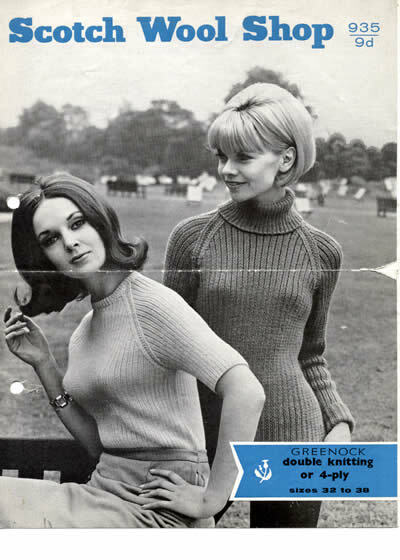 I am not wholly sure what weight "tripleknit" was - all the yarn companies at the time produced "triple knitting" wools for a while. 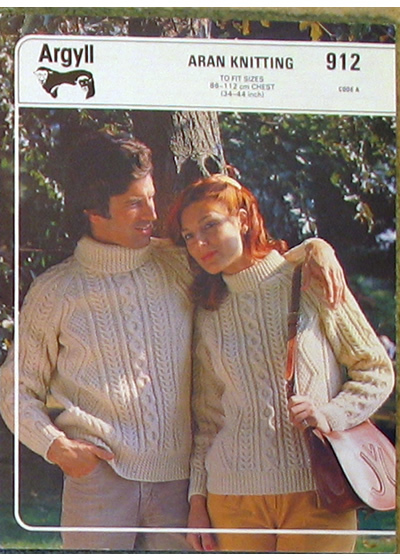 From the tension and needle size I assume it's like an aran or heavy worsted. 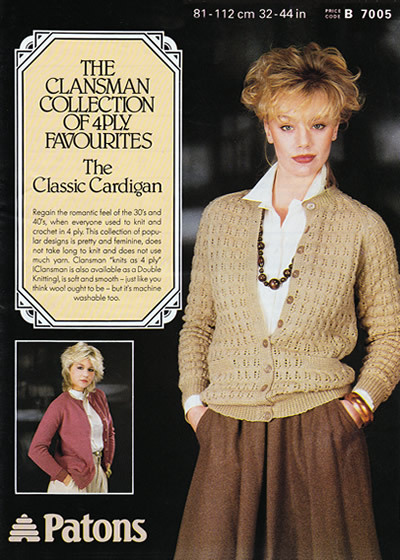 Description: Aran cardigan jacket in with the best of eighties styling. 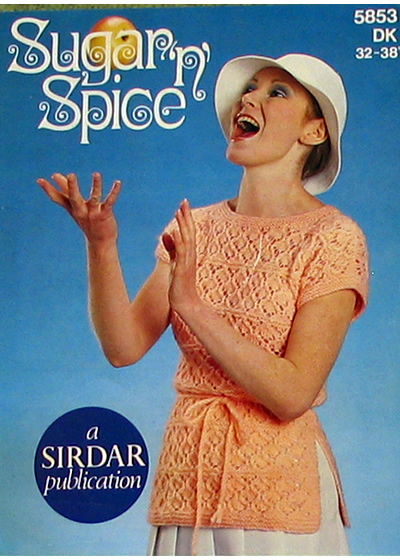 The booklet is in moderate condition. 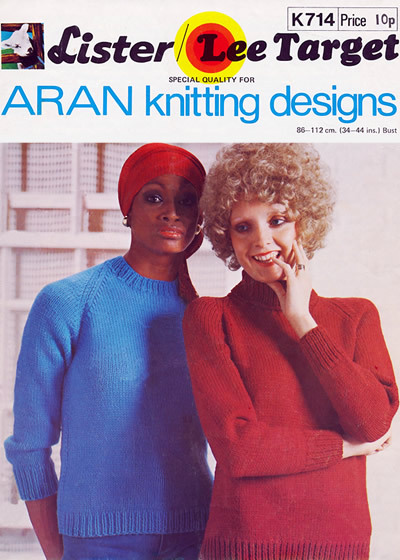 9 designs in Robin Aran yarns (aran weights). 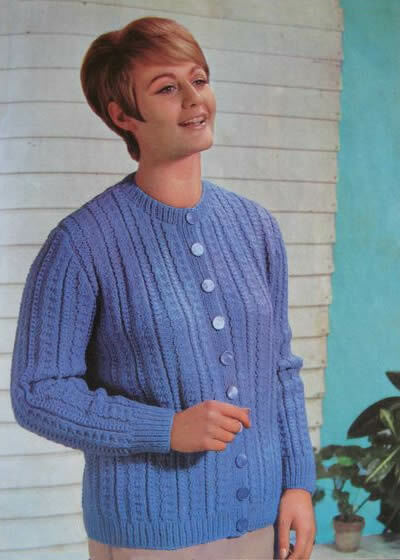 Description: Women's round-necked twin-set with short-sleeved top and long-sleeved cardigan. 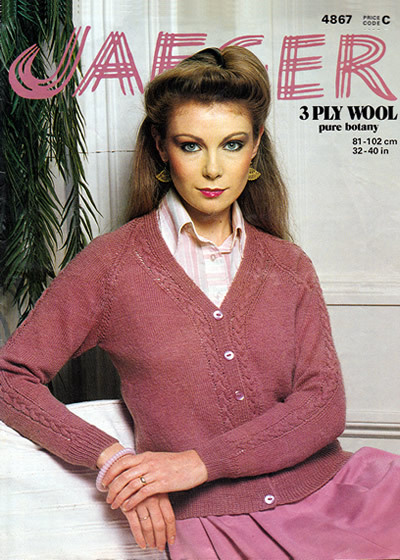 Description: Traditional Aran cardigan with eighties styling. 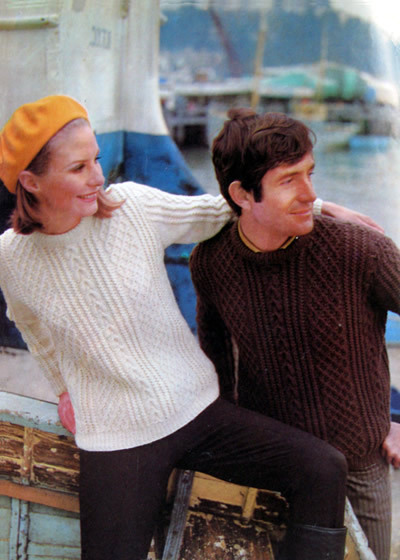 Description: Fisherman's rib crew-neck sweaters for Him and Her in good condition. 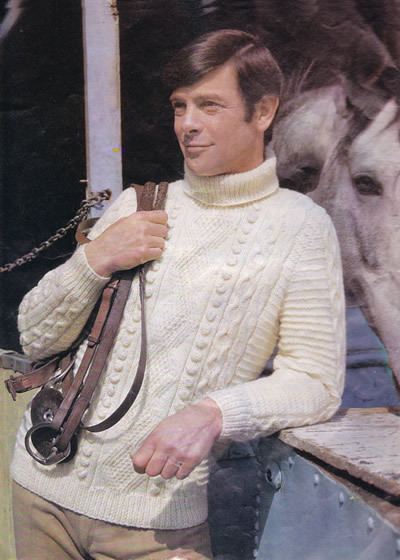 Stated for hand or machine knitting - but you need a ribbing attachment - plus it involves the knit one below technique. 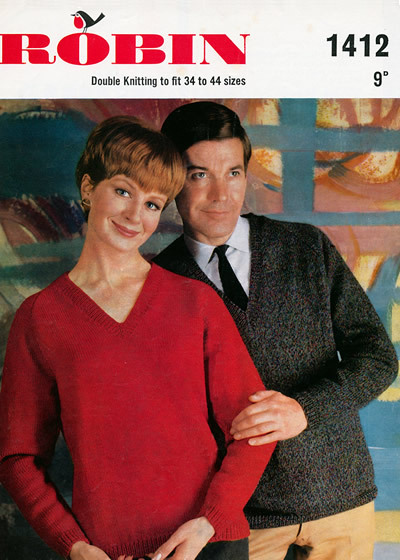 Description: Plain sixties V-neck sweaters for Him and Her. 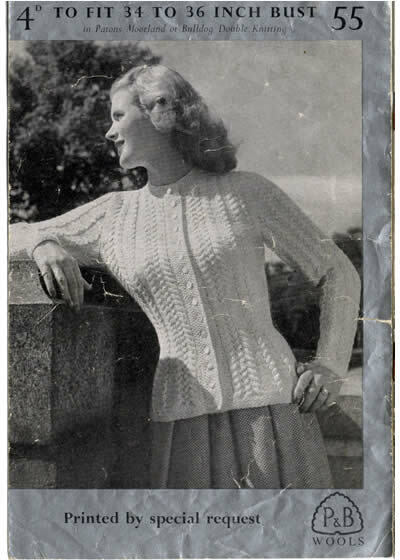 Light crease marks on photo, and would otherwise be in fair condition were it not for the bite out of the top right hand corner! 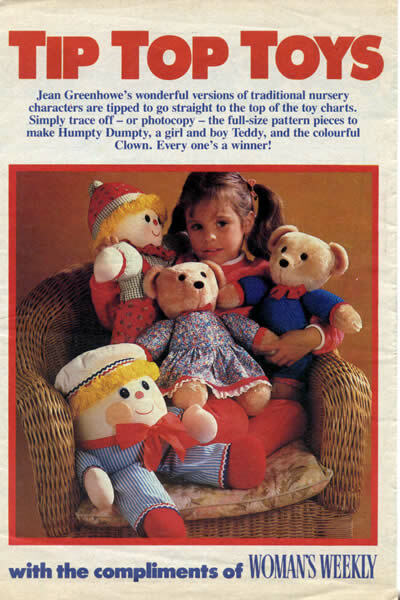 Instructions still perfectly readable. 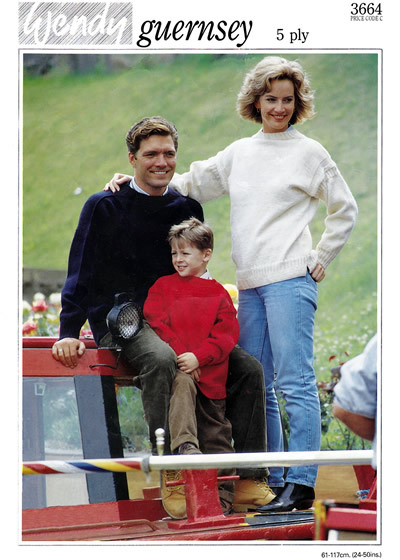 Description: "Country classic" - pattern for chunky family cardigans in good condition. 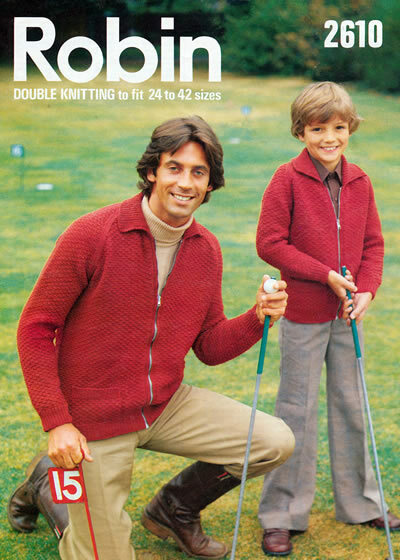 Description: Zipped Father and Son golfing jackets with textured staggered moss stitch. . 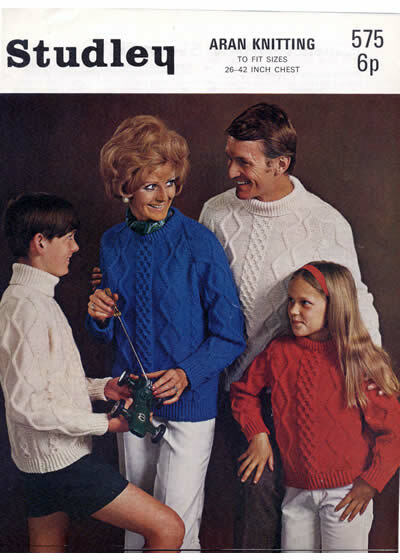 Description: Family sweaters . 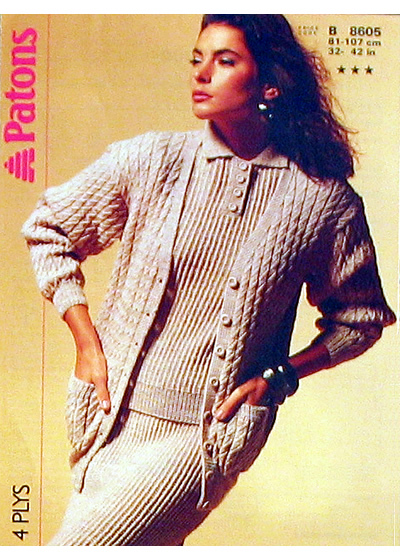 Pattern has heavy horizontal crease not shown in photo - instructions not affected. 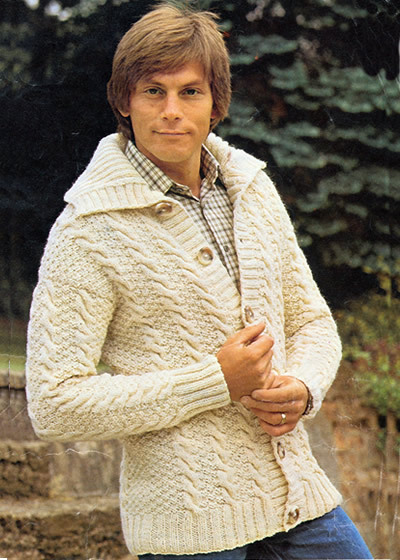 Description: Textured cardigan jacket in a worsted or Aran weight yarn called triple knitting (between a DK and a bulkier yarn). 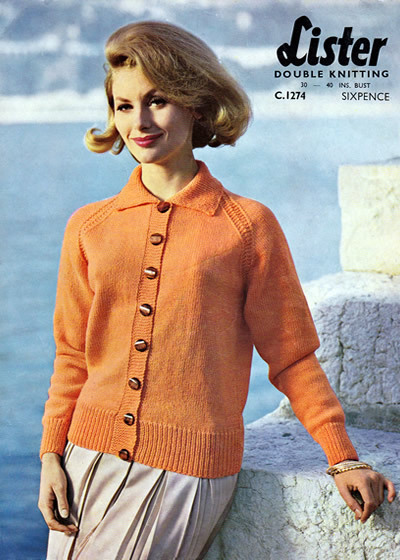 Heavy horizontal crease not shown in photo. 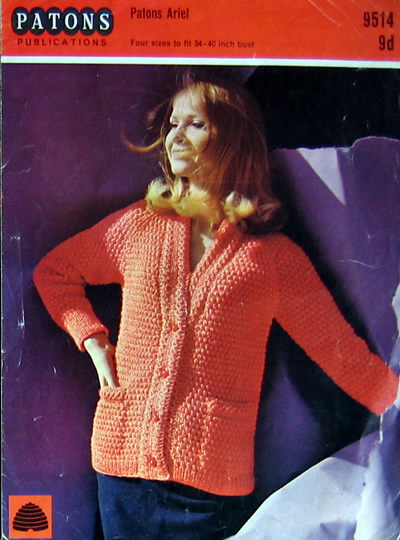 Description: Womens' plain cardigan jacket with cowl collar. 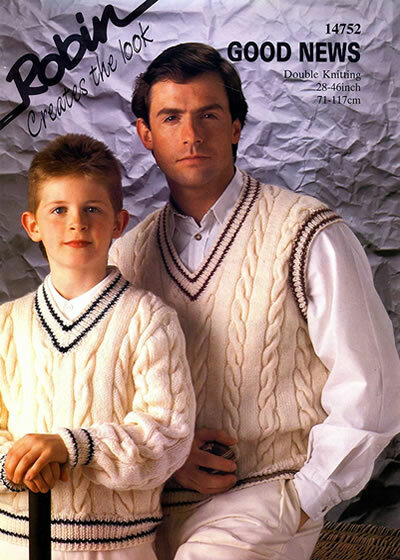 This pattern is has many surface creases and tear, not shown in the photo illustration. 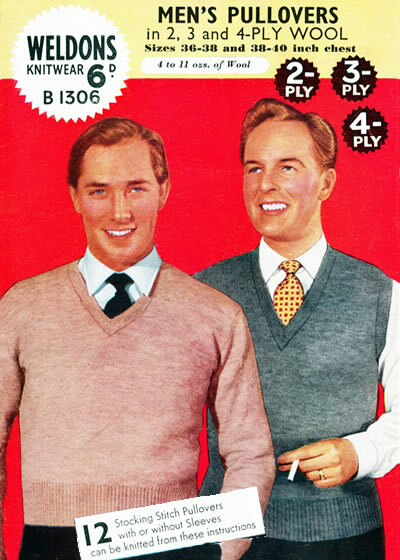 The instructions are not affected. 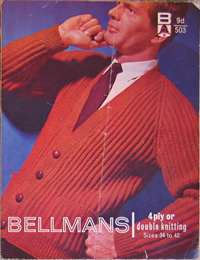 Description: Unusual man's plain cardigan with dolman sleeve, plus a pullover. 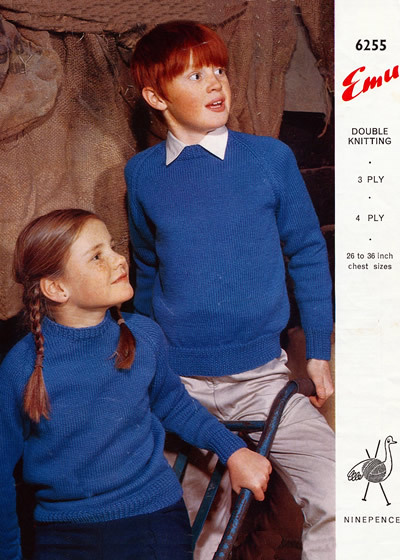 A twinset... however only one size. 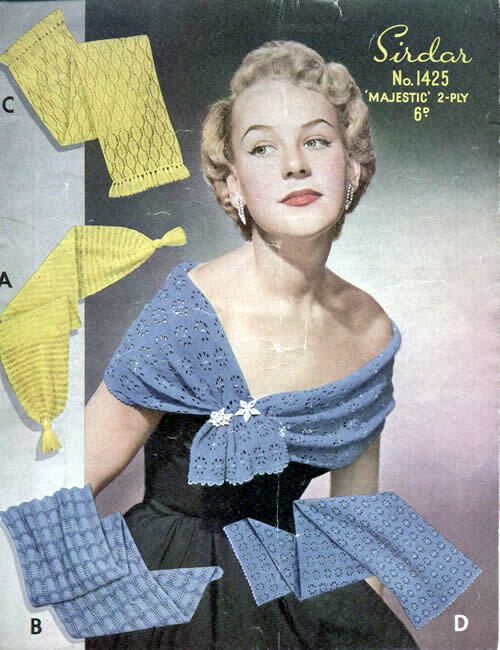 Vertical crease and some spotting that does not affect the instructions. 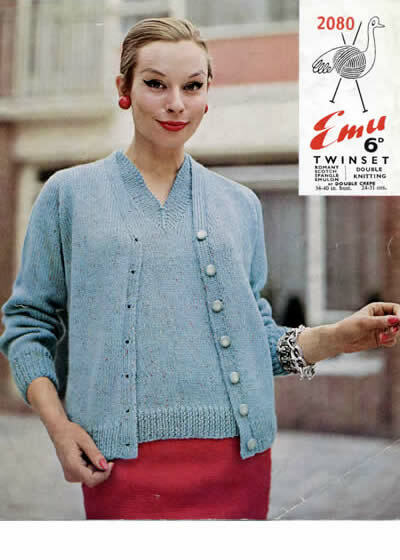 Description: Classic plain fifties or early sixties cardigan. 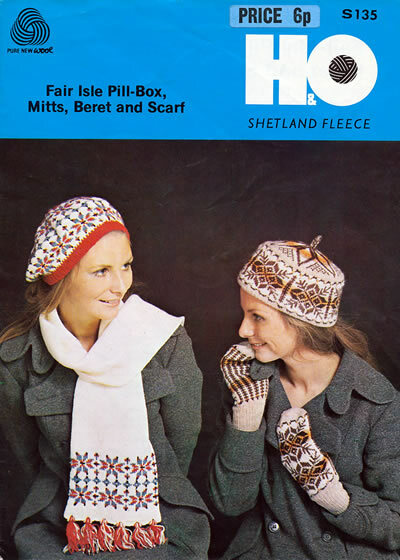 Description: Classic set of beret, pill-box hat, scarf and mittens. 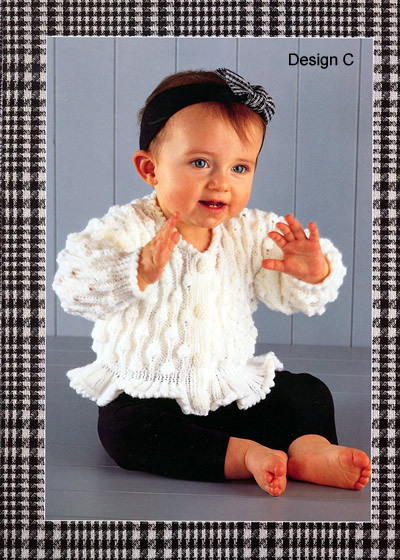 Description: Charmingly simple jacket style in a twisted rib pattern. 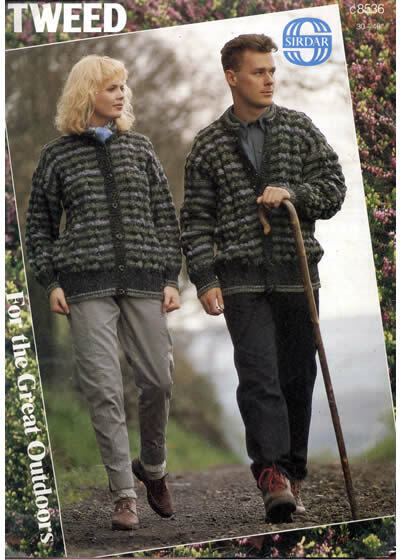 Description: Classic Aran style jackets in a lighter weight yarn. 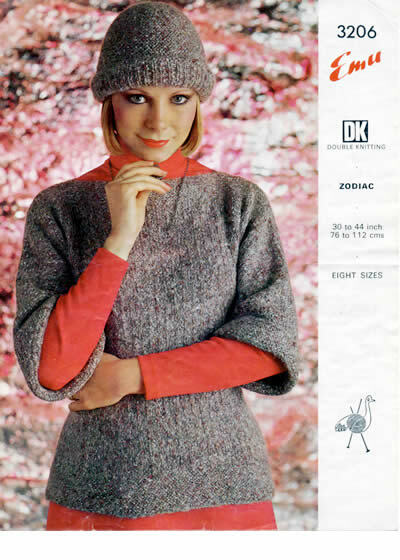 I would note here that I have copied the information exactly from the pattern but the tension is definitely in the DK range and the amount of wool suggested seems a bit high (it could have been a very dense yarn). 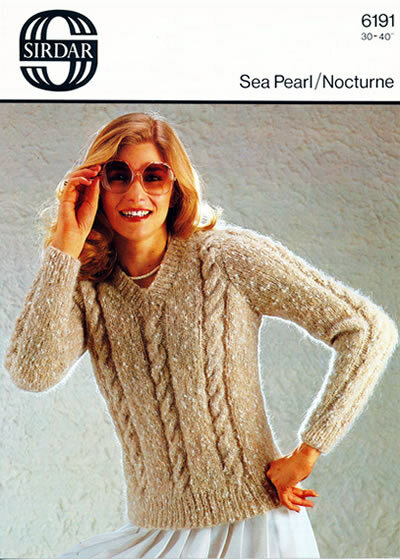 Description: Longline bobble and eyelet sweater in cotton DK yarn. 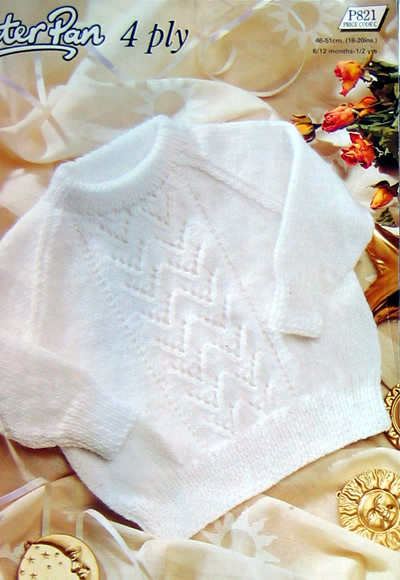 Description: Interesting yet simple design cotton summer sweater. 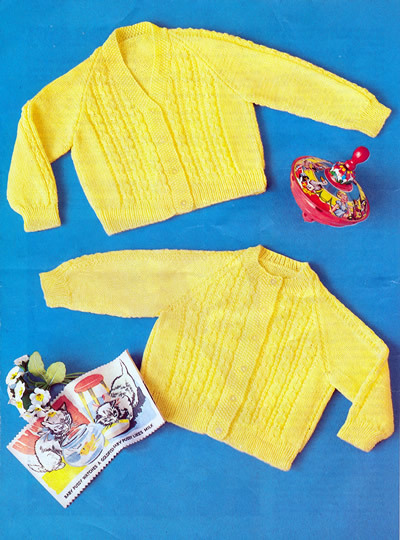 Description: Eighties cotton summer sun-top knitted from side to side in a chunky yarn, which makes it quick to knit. 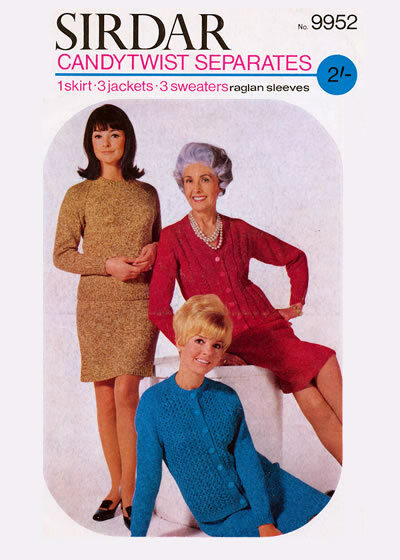 Original is an acrylic fluffy yarn but you can get cotton chunky yarn for example at Black Sheep Wools (always good for a bargain). 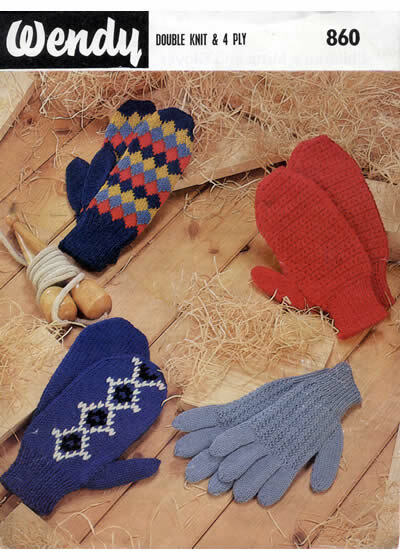 However take care with the wool quantities if substituting - these acrylic yarns can have double the yardage (or more) compared with a pure cotton ball of the same weight. 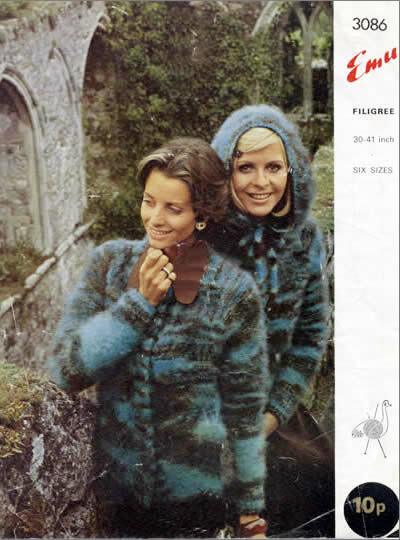 Description: Zipped jackets with rib detail. 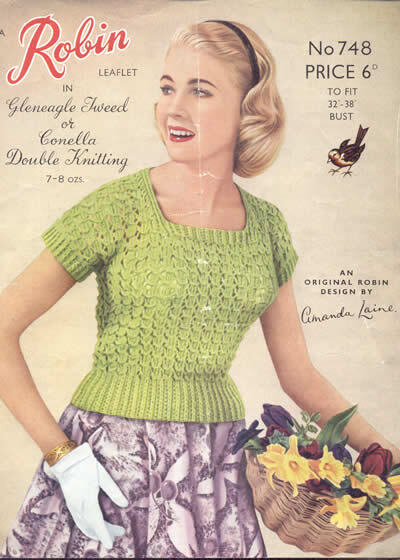 Pattern has surface creasing with horizontal crease not shown in photo - instructions not affected. 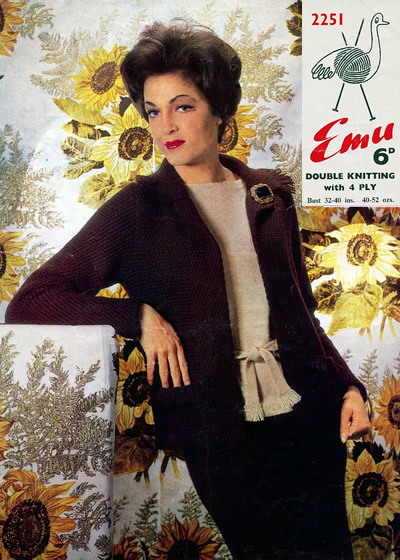 Elegant jacket "with French styling"
Description: Edge-to-edge ribbed jacket with pockets. 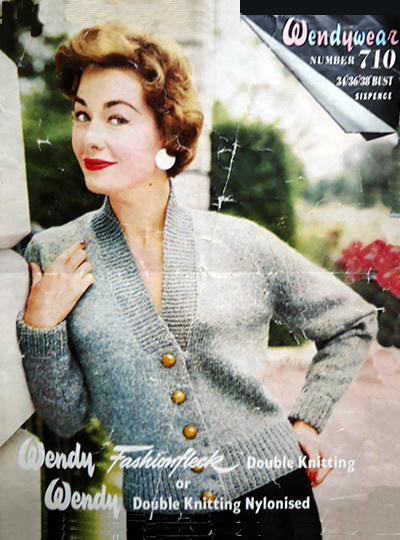 Description: Fifties textured bouclé cardigan. 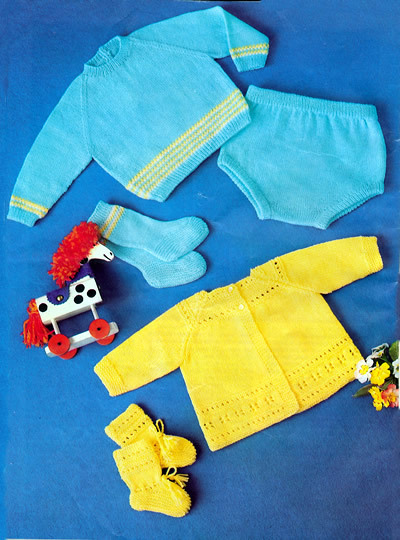 Description: Cute toddler accessory sets. 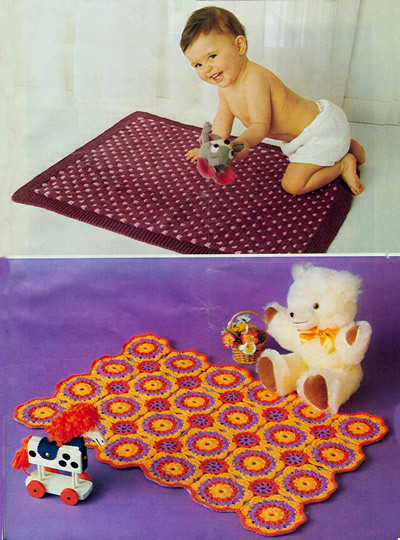 Sizes: to fit 24 - 30 inch chest (4 sizes). 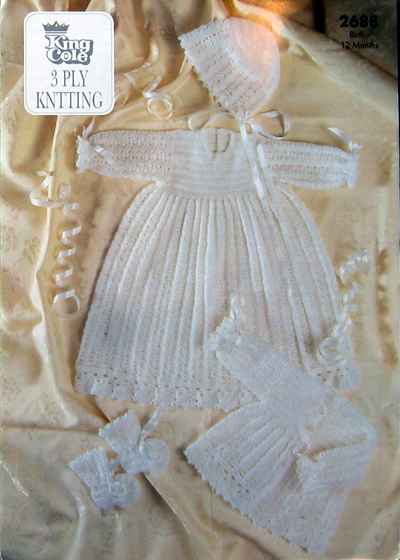 Needle size: 3¼mm and 2¾mm for 4 ply; 3¾mm and 3mm for DK. 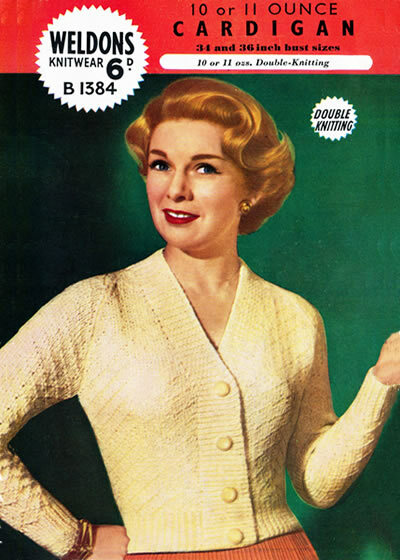 Description: Traditional cabled cardigan in choice of yarn weight. 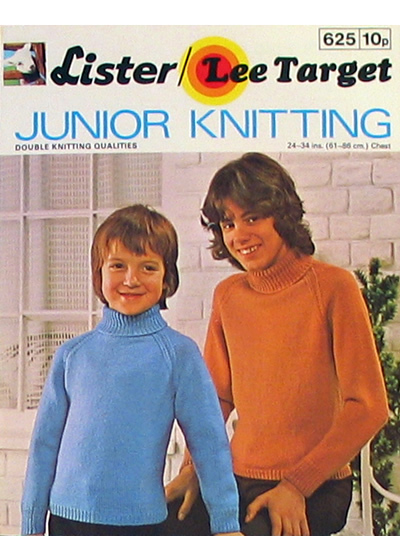 Yarn quantity: 7-11 (1oz balls) plus 2 contrasts if required. 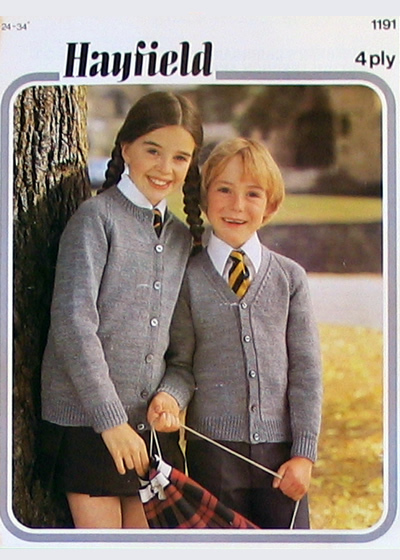 Description: Lighter weight school cardigan and sweater in 4 ply with school colours striped in V neck. 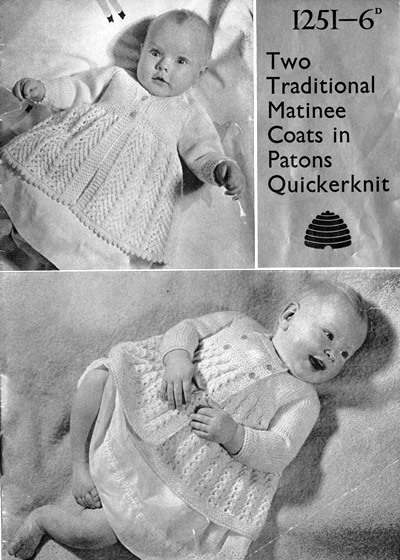 Pattern is lightly creased and worn affecting photo but not instructions. 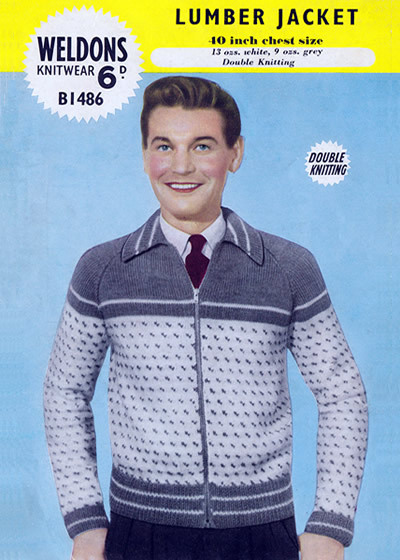 Description: Traditional man's sweater in fisherman's rib type stitch - but knitted in a novelty yarn. 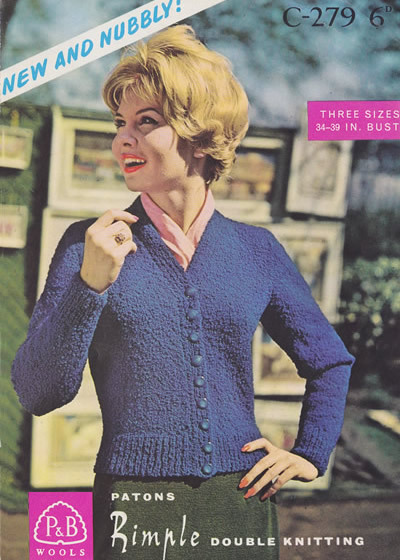 As far as I can tell the yarn is in the double knitting range recommended for normal knitting on 3-3½mm needles; 50g is about 85 metres and composition is 44% viscose, 33% acrylic, 23% mohair. 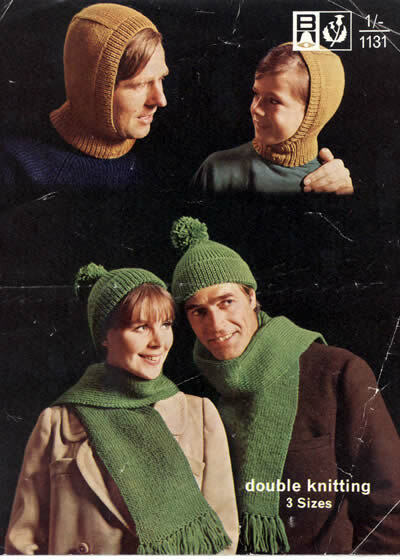 [You can probably still buy it on eBay in Germany!]. 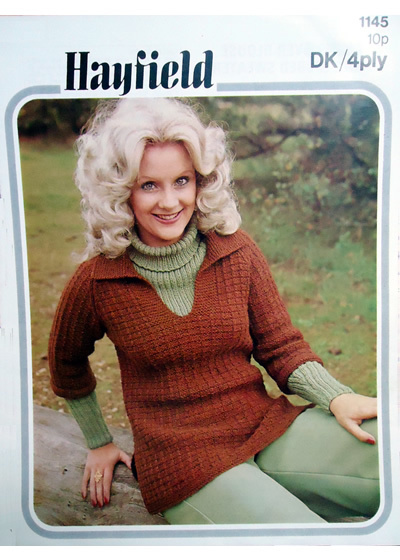 Description: Plaid patterned slipover. 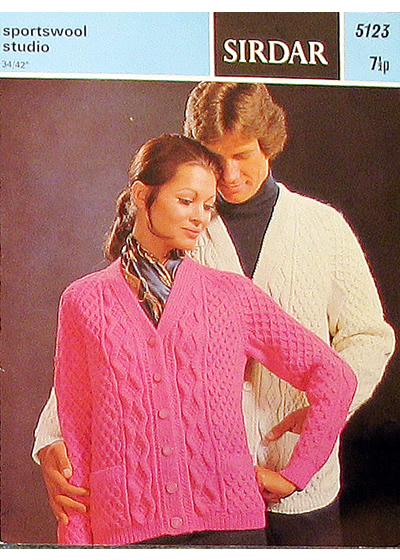 The pattern is in good condition. 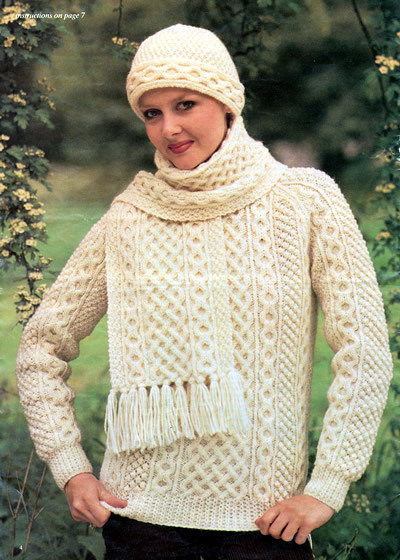 The contrast is a cream bouclé DK yarn which could clearly be replaced with a smooth yarn if necessary. 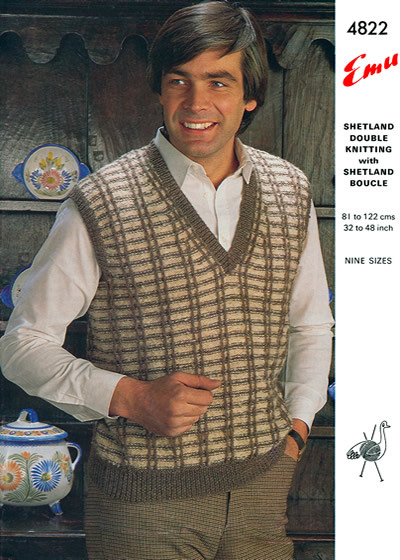 Description: Fair-isle patterned slipovers or waistcoats. 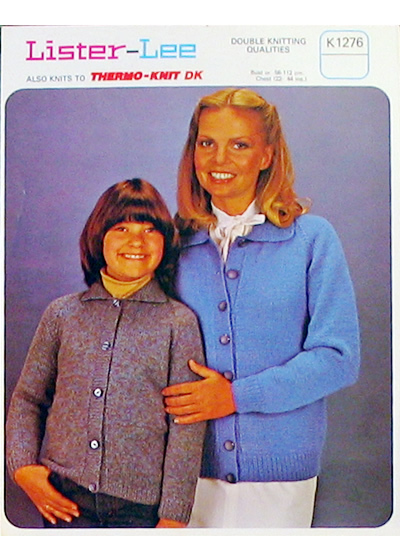 The pattern has the usual horizontal crease (not shown in photo) which does not affect the instructions. 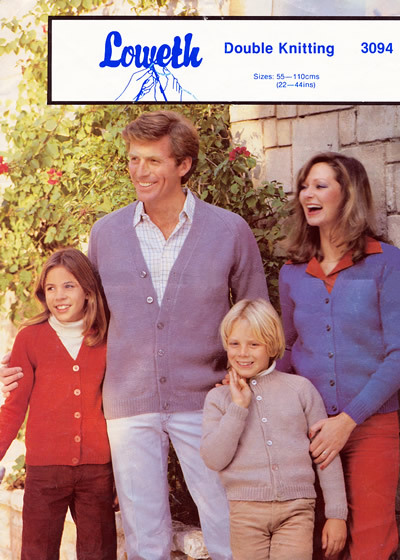 Description: Family plain V-neck cardigans. 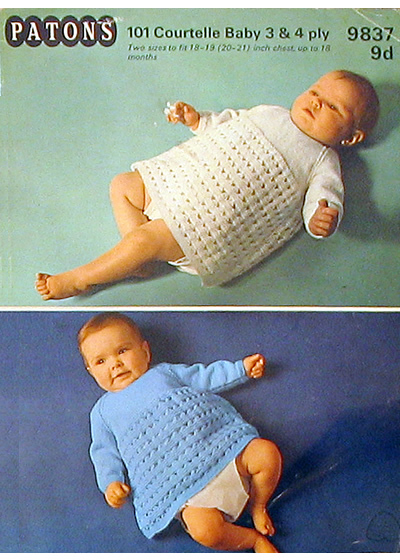 The pattern has a horizontal crease (not shown in the photos) which does not affect the instructions. 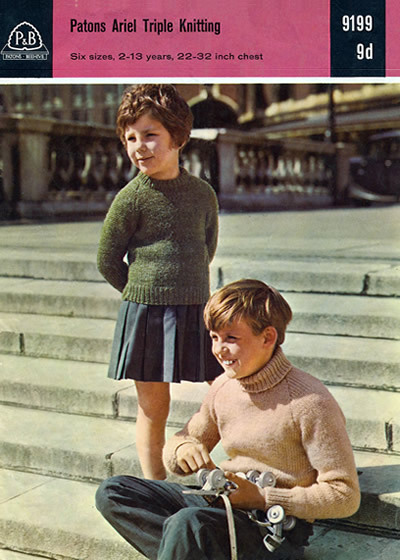 Description: Girl's knitted dress - very early 1970s in style with its "Victorian" crocheted collar and cuffs. 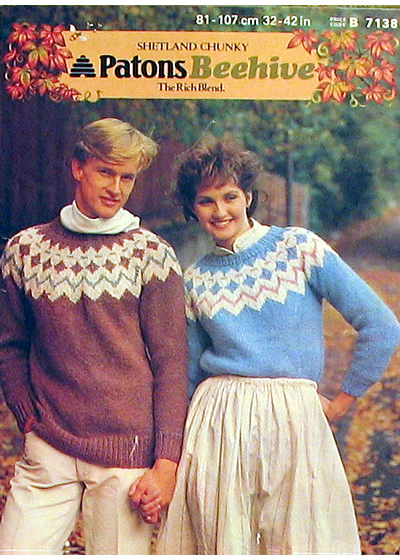 The pattern is in good condition. 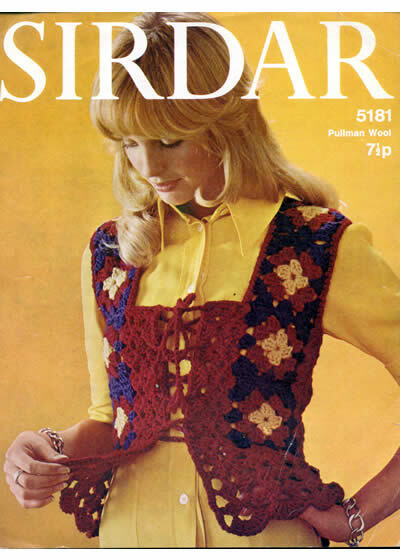 Tension: 22sts x 30 rows to 4inches; crochet motif is 3½ inch square. 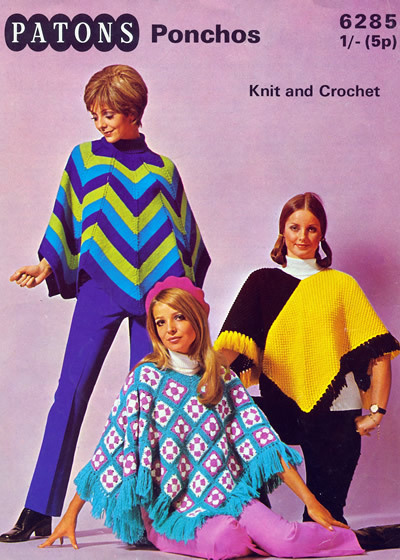 Description: "Absolutely Fabulous" classic 1970's poncho designs from the cusp of the new decade. 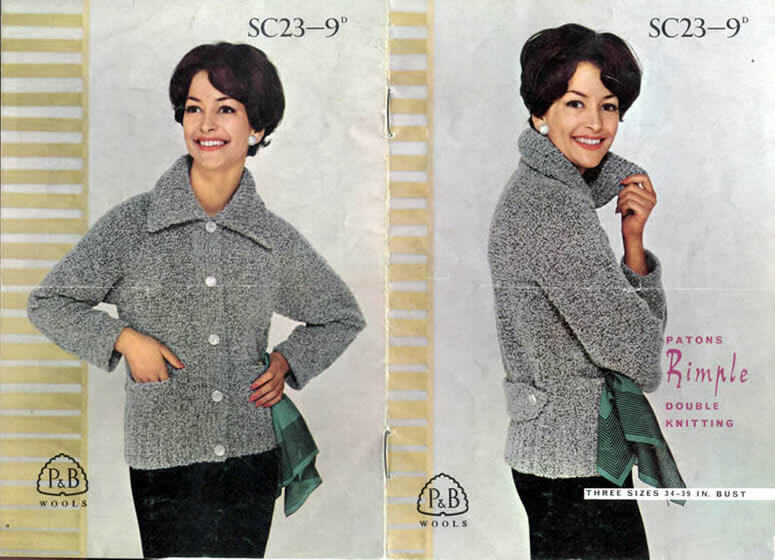 The pattern itself is in pretty good shape with little creasing or wear but sadly there is a single 1½ inch tear at the top of the pattern which would only spoil it for a collector. 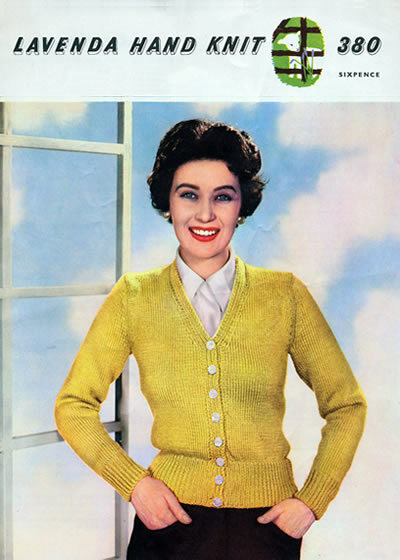 Description: Easy-knit chunky raglan cardigans with V-neck, and pockets. 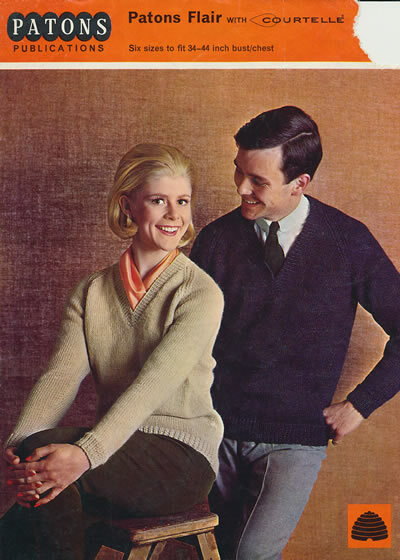 Description: Plain sixties crew-neck sweaters for Him and Her. 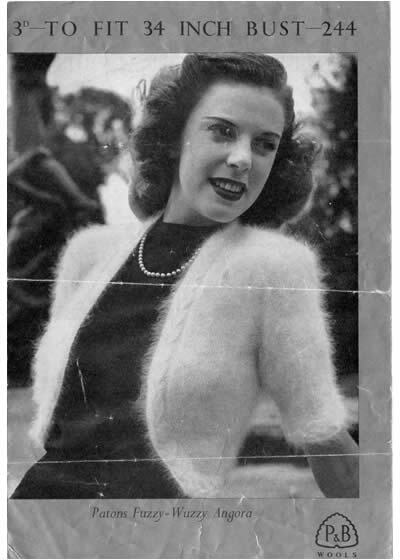 Light crease marks on photo, otherwise in fair condition. 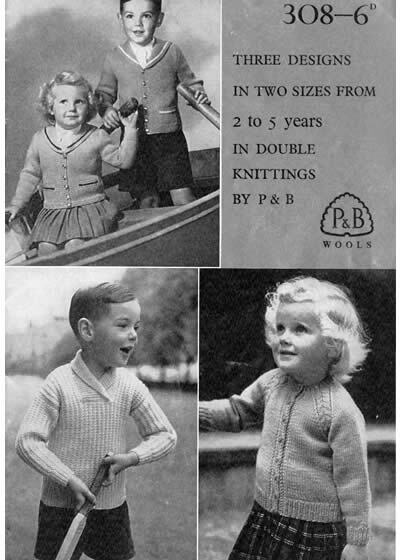 Wool brand: Birch 4 ply. 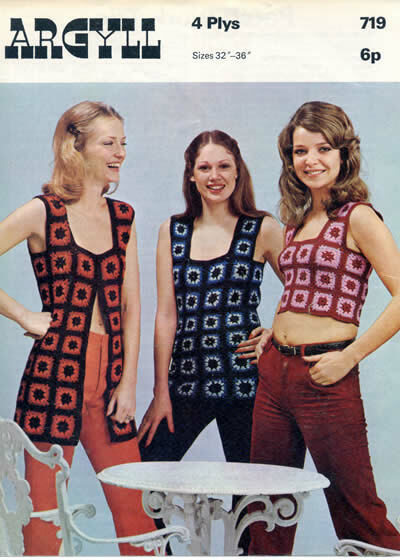 Sizes: to fit 25 - 36 inch chest (3 sizes). 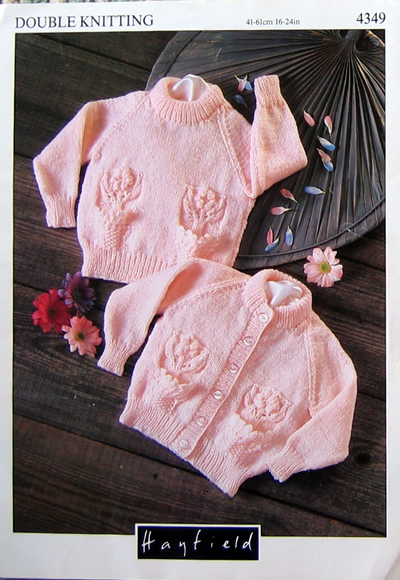 Needle size: 3¼mm and 2¼mm . 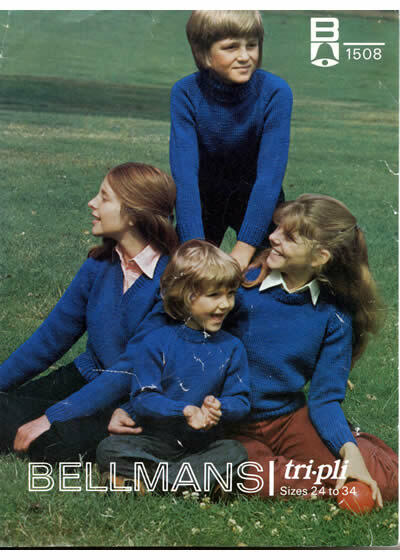 Description: 4 styles of school jumpers The pattern has seen a lot of wear with sellotape on the spine and some tears at the edges, (not shown in the picture), but the instructions are sound. 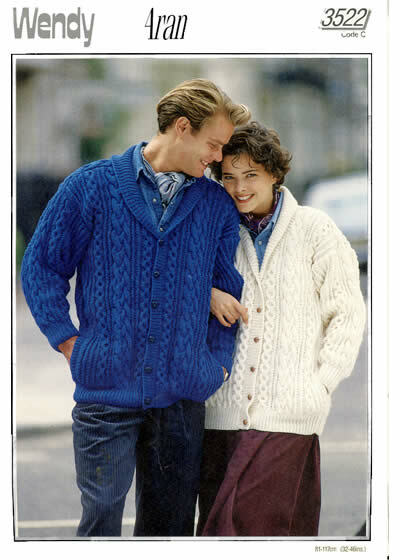 Description: Classic cable style cardigan in men's and women's sizes. 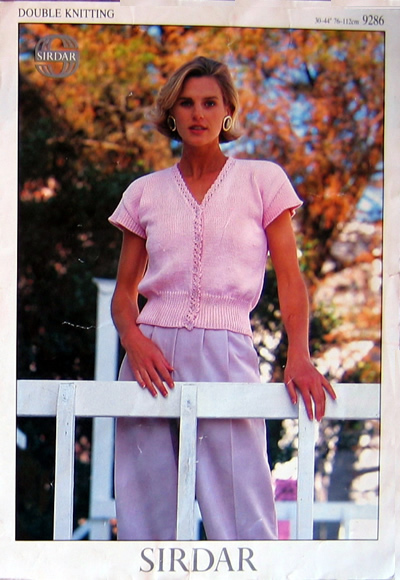 Description: Pretty summer top in fine yarn. 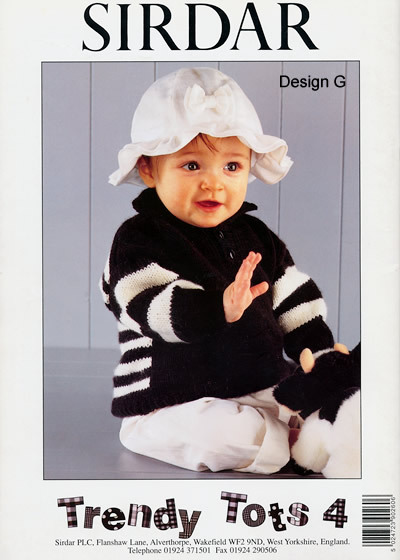 Description: Chunky mohair cardigan with striking diagonal pattern - plus matching hat. 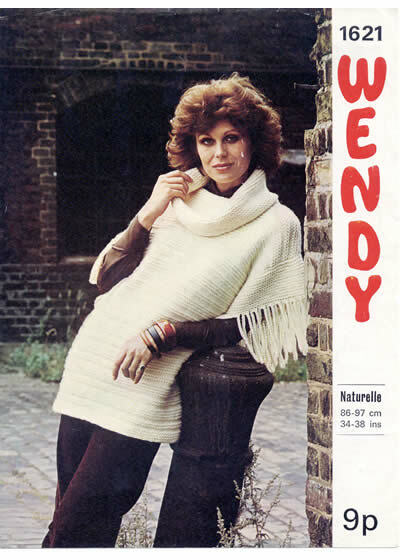 Description: Chunky oversweater with cowl neck; being of the right era and so very striking, I believe this is modelled by the lovely Joanna Lumley. 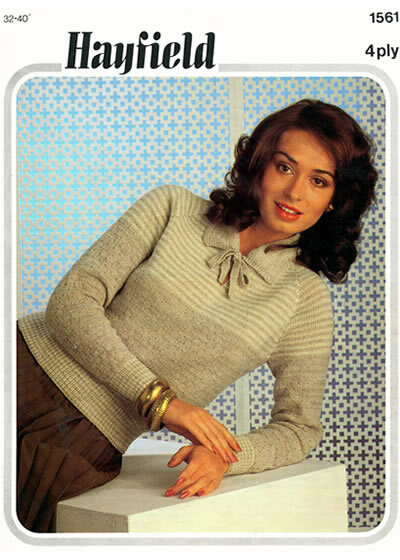 Description: Women's twin-set with short-sleeved top and V-necked cardigan, in wider range of sizes up to 46 inches. 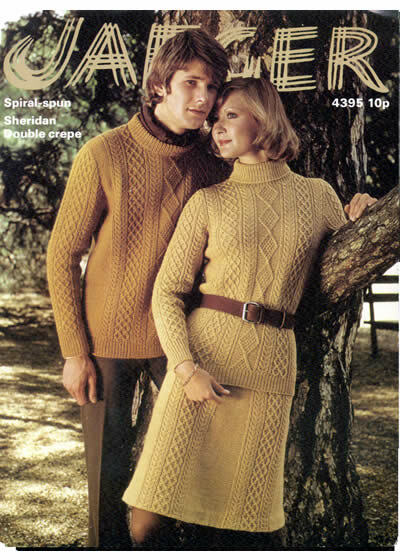 Yarn quantity: 6-7 (1oz balls) for short sleeves and 8-9 for long sleeves. 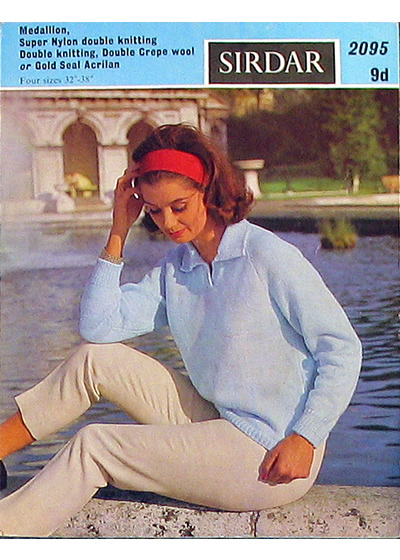 Description: Pretty top from the fifties, with long sleeve option as well as short sleeves illustrated. 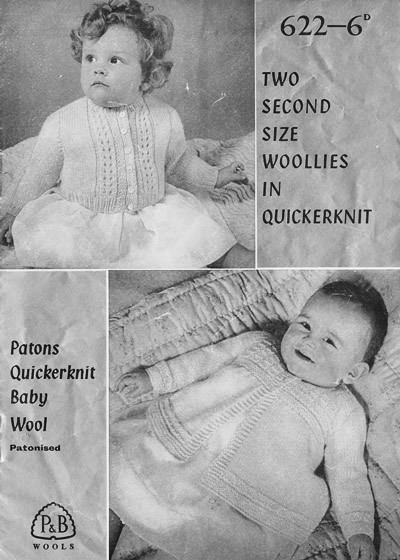 Wool weight: Heavy double knit or Aran, American "worsted"
Description: Sixties separates suits in a double knitting type yarn. 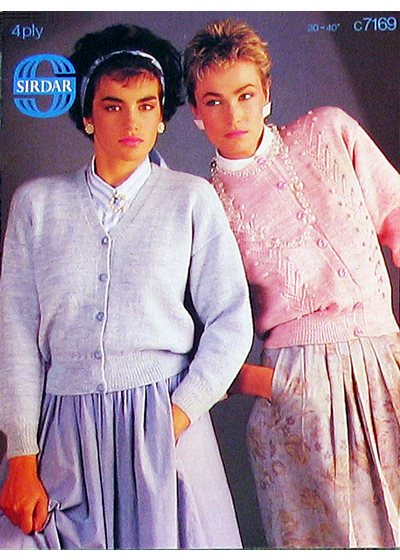 Includes straight skirt with options for a sleeveless top, a plain sweater, a cable sweater, and 3 styles of cardigan. 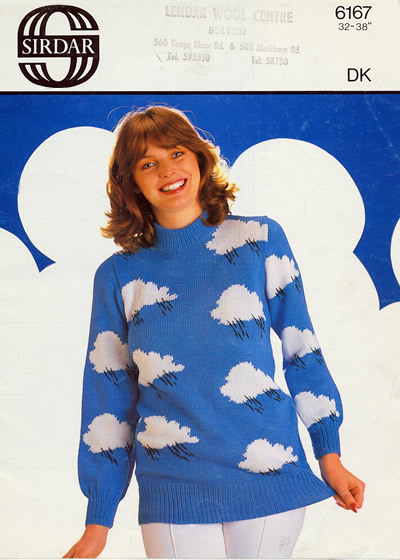 Yarn quantity: 8-12 (50g balls) plus 2-3 contrast for clouds; rain embroidered with small quantities of black 4 ply. 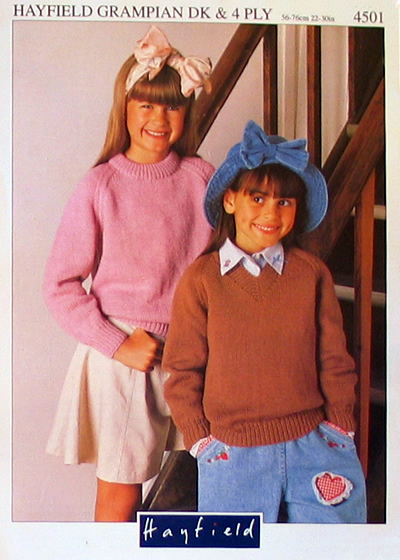 Description: Picture sweater in stocking stitch with chart. 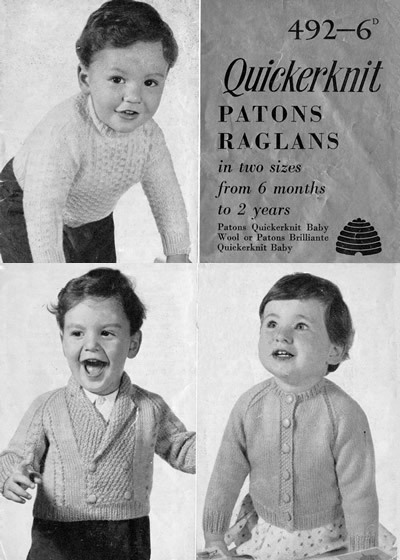 Description: 3 charming retro designs for toddlers (6 months - 2 years, it says) in quick-knit yarn weight. 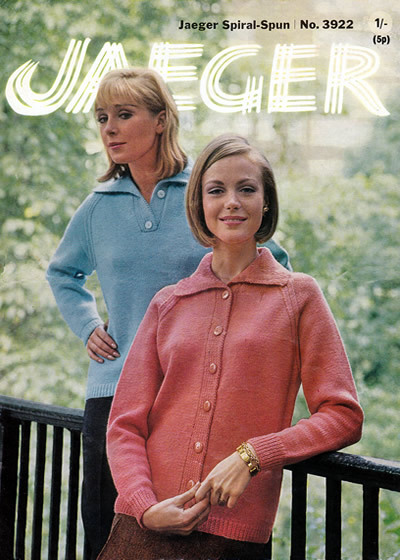 Plain raglan "button-through" cardigan; double breasted raglan reefer; and simple textured-stitch jumper with buttoned back neck opening. 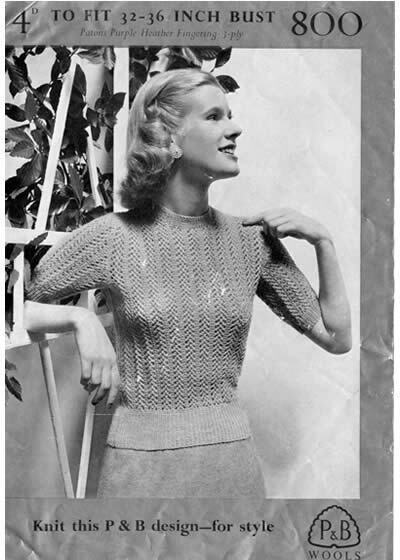 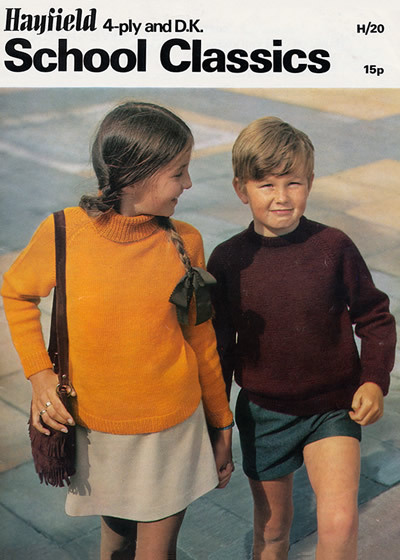 Description: Guernsey style sweater in double knitting rather than 5 ply, plus an elongated variation as a dress. 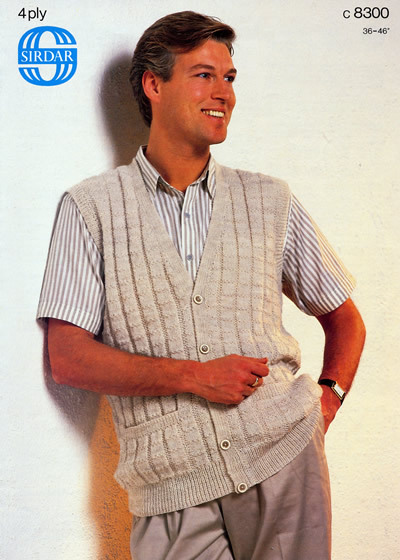 Description: Man's sleeveless slipover or waistcoat with button front closure and pockets. 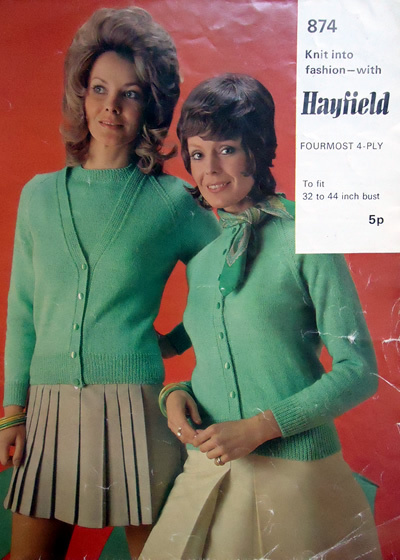 Yarn quantity: Short sleeved jumper: 6-9 (50g balls); cardigan: 7-12 balls. 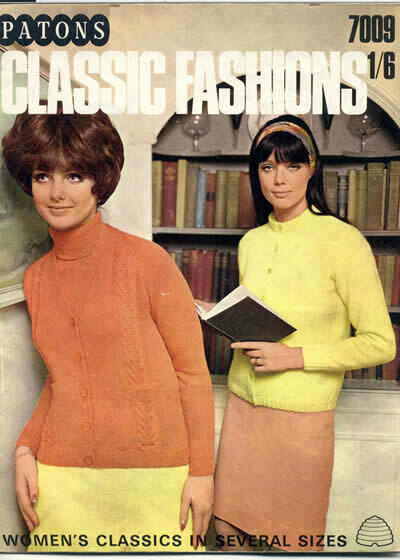 Description: Plain seventies twinset. 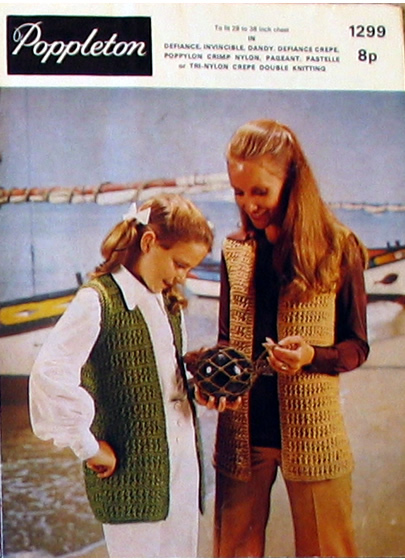 The pattern has an some creasing to the photo (not shown) which does not affect the instructions. 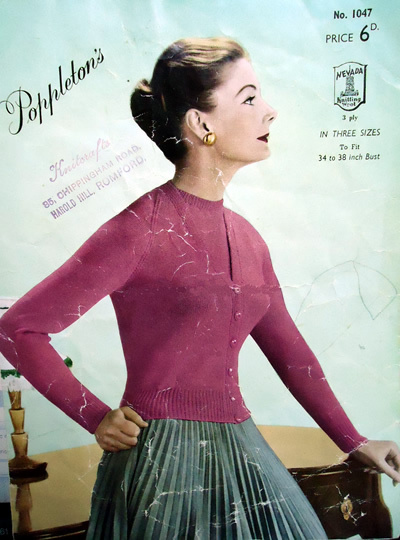 Description: Perfectly plain woman's sweater. 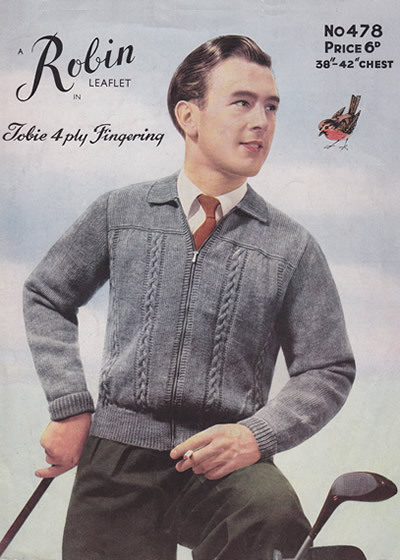 Vertical crease (not shown in photo) disfiguring the cover but not affecting the instructions. 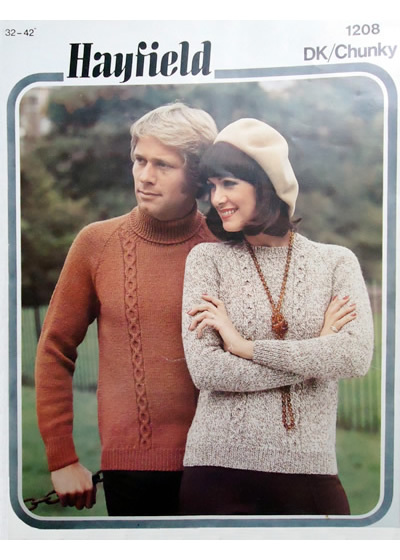 Description: Plain sweaters for Him and Her with V or round necklines. 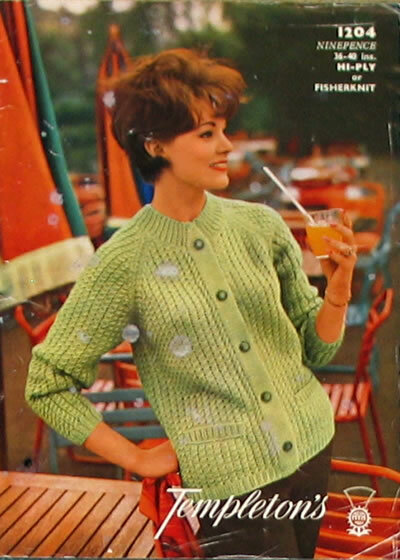 Light crease marks on corner, otherwise in good condition. 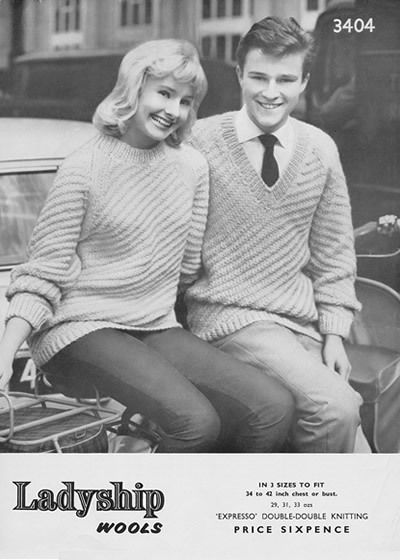 Description: Plain sixties V-neck sweaters for Him and Her. 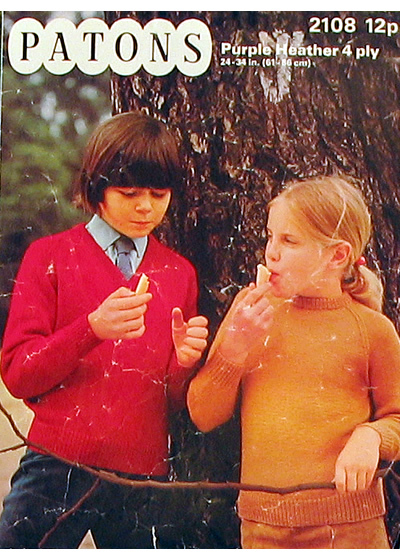 Light crease marks on photo, otherwise in fair condition. 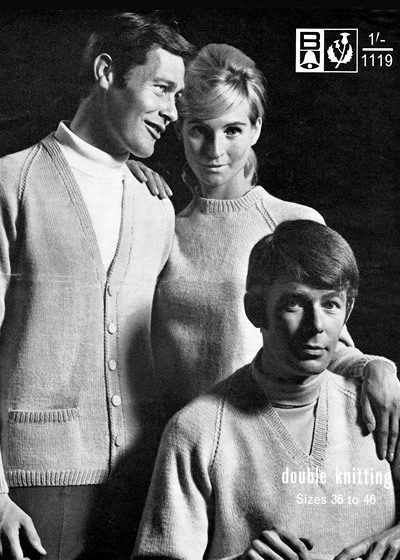 Wool brand: Balmoral, Beehive, Trident. 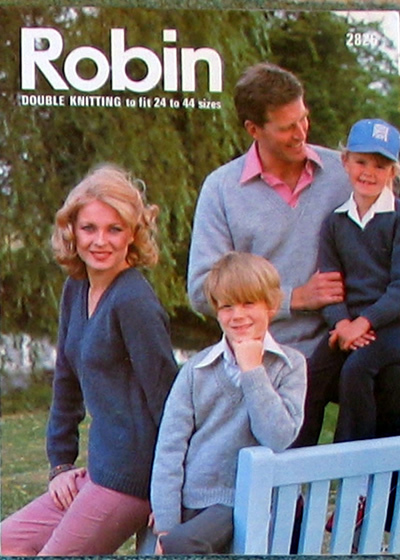 Description: More family sized plain sweaters in double knitting with a variety of neckline options. 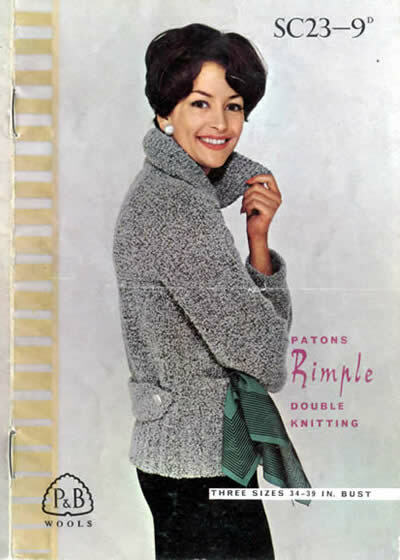 Use any double knit, but original design for Patons Balmoral Tweed and Mohair - which looks and sounds a nice soft marl combination. 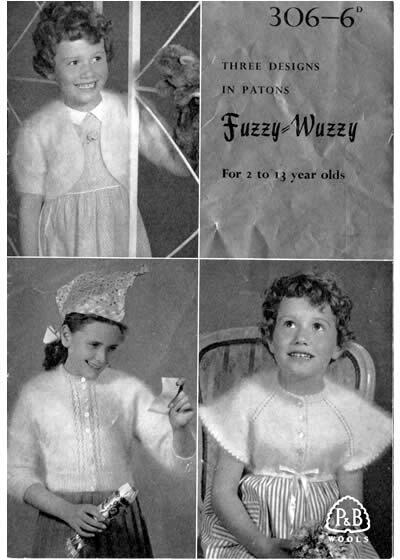 Light crease marks on photo, otherwise in fair condition. 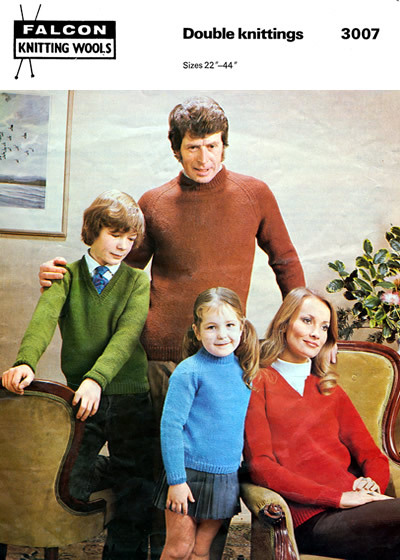 Description: Traditional plain V-neck jumpers in double knitting. 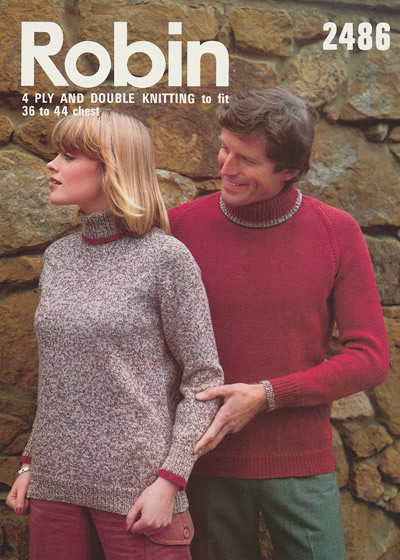 The pattern has a light vertical crease. 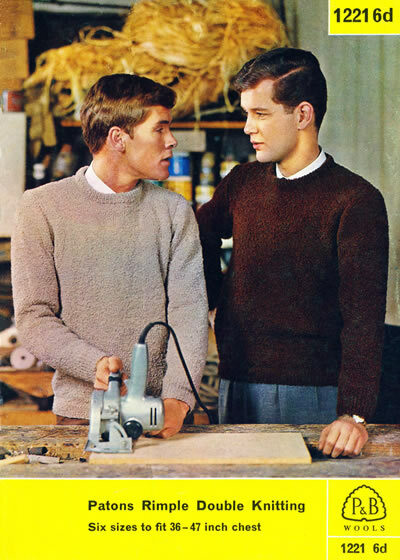 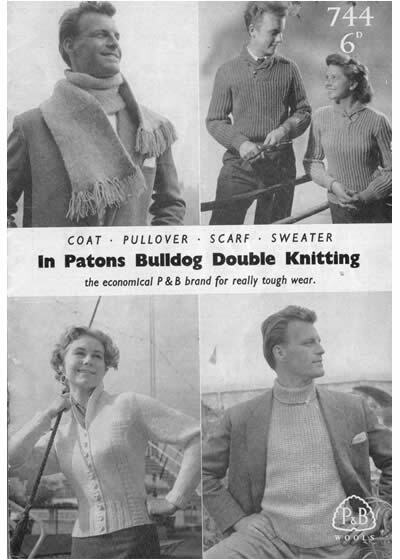 Description: Small booklet of 3 sweaters all in double knitting weight: "Plane Sailing" round-neck ribbed sweater; "Home Builder" round-neck plain bodied sweater with a mock fisherman's rib on the sleeves, and cabled raglan; and "The One that Didn't Get Away" shawl collar with purl stitched patterning. 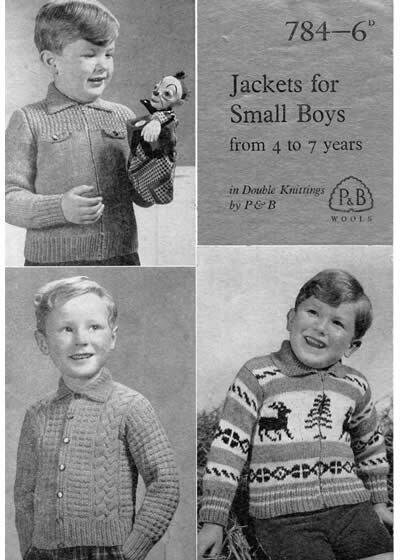 Sized for "6-12 years" (but maybe slightly younger kids these days). 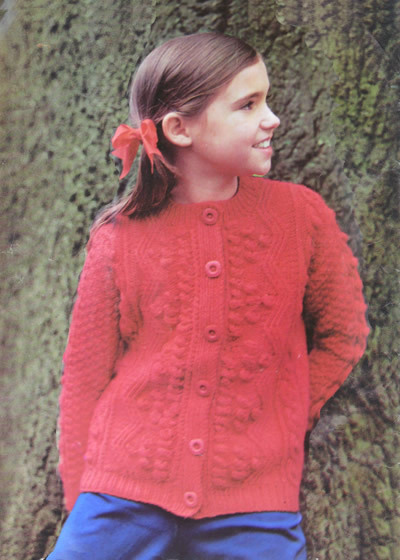 Description: Girl's cardigan with "lacy interest"; size 2-8 years, option of 2 yarn weights. 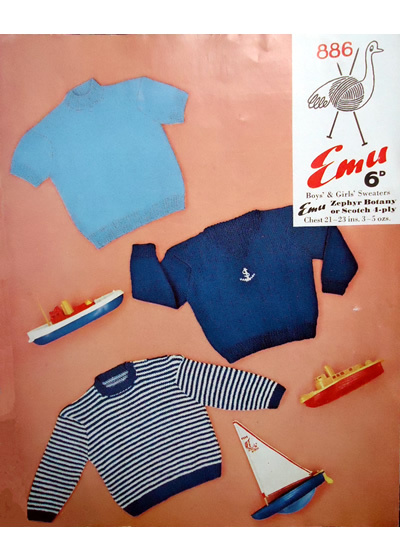 Pattern shows signs of use with a few notes and row markings. 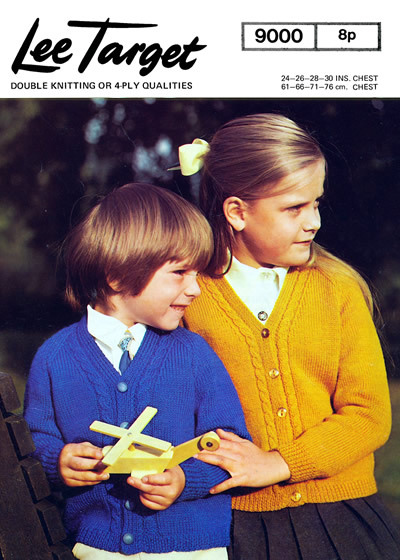 Description: Traditional school cardigan - quick to knit for younger children. 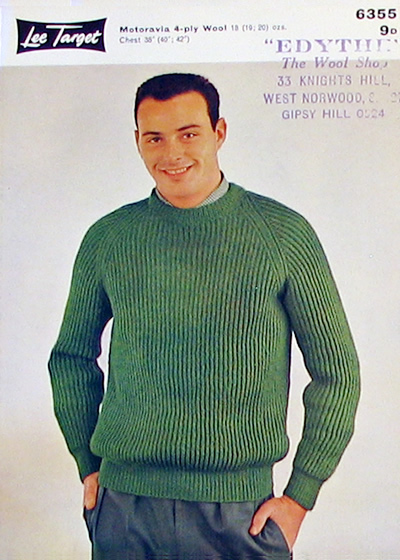 Description: Sloppy Joe sweaters designed to attract young people towards hand-knits in the late 1950s or early 1960s. 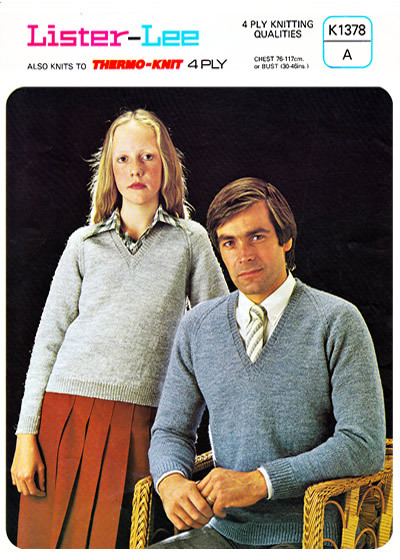 This is a cleaned-up version for the "decent" young people such as those depicted modelling it - the fashion it follows was for very baggy sweaters, longer, with rolled neck and sleeves, and probably no textured patterning. 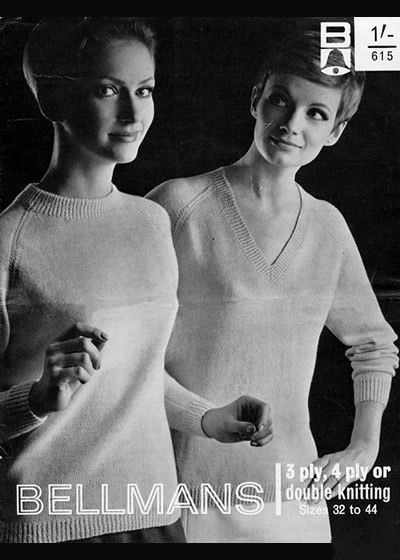 Description: Plain raglan sixties sweaters. 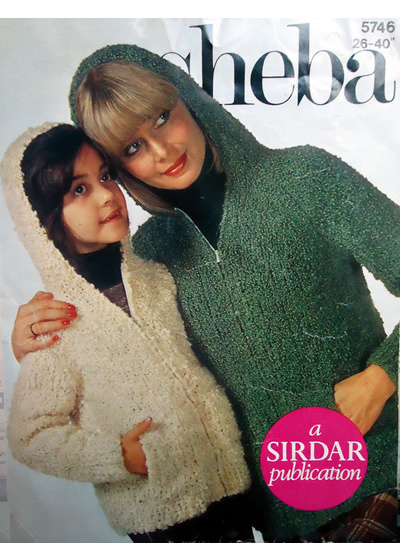 The booklet is in excellent condition and features 21 cute designs in Sirdar Snuggly double knitting. 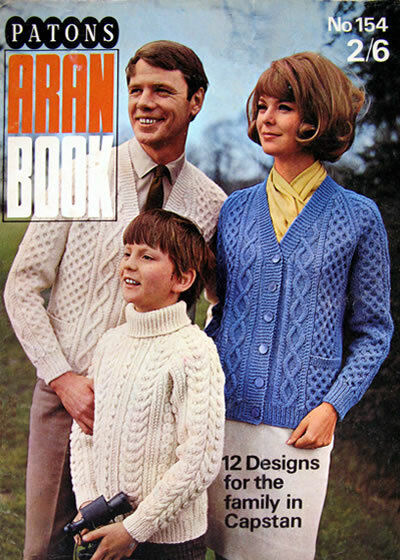 Note that the 21 designs include colour/feature modifications to basic designs illustrated (A-J). 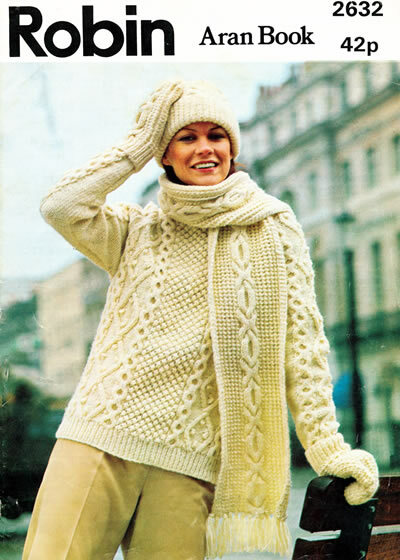 Description: Aran style in chunky yarn weight. 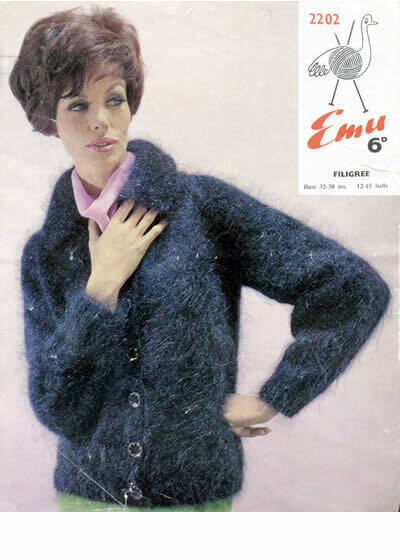 Description: Fluffy mohair type waistcoat in a light weight chunky yarn. 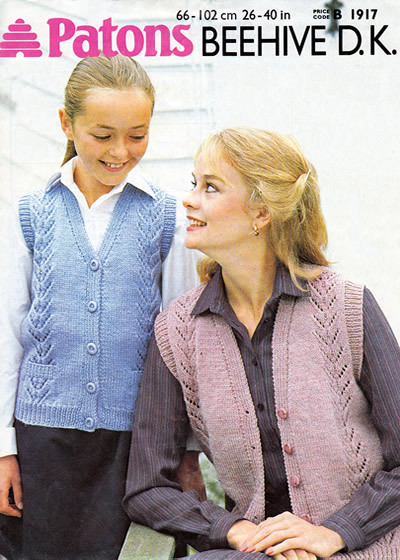 Description: Textured cardigan with staggered eyelet pattern worked over 10 rows. 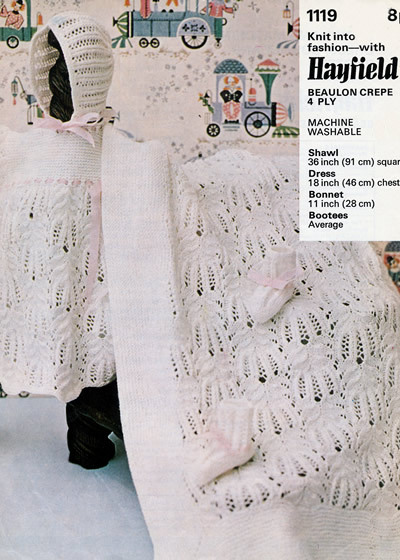 Description: Sweet lacy cropped camisole top with cross-over straps buttoned at back. 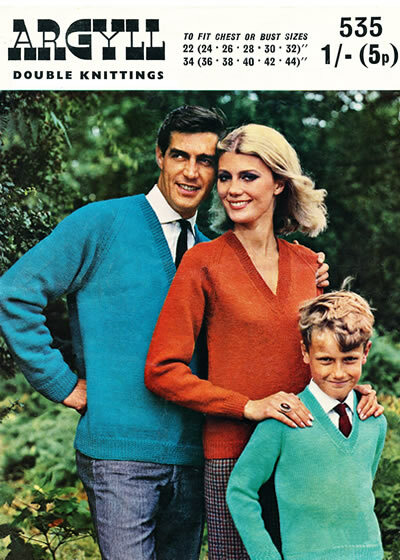 Description: More family sized plain sweaters. 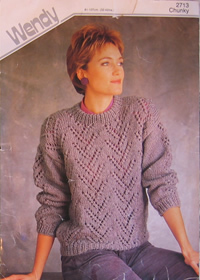 This pattern has a lot of surface creasing to the front and a small tear; pattern instructions are not affected. 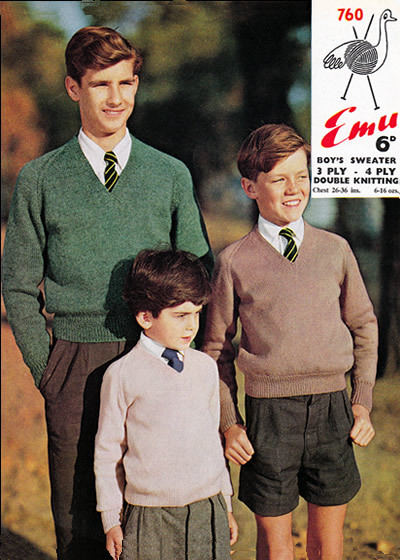 The photo displayed has been improved to remove the crease marks. 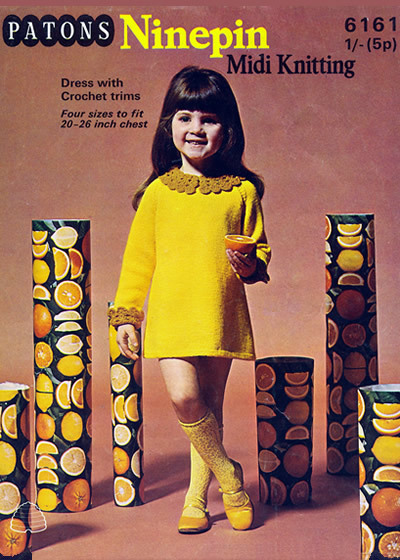 Description: Crochet cotton summer sun-top. 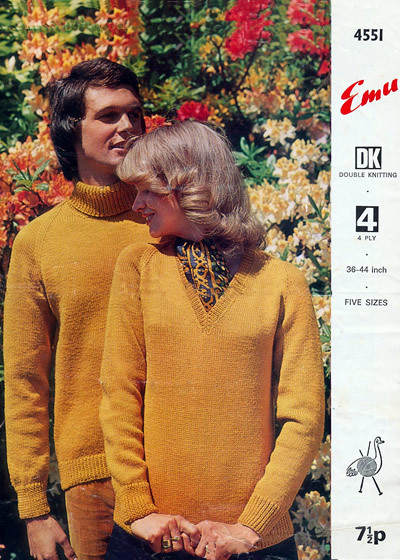 Note that this pattern has a heavy centre-fold crease. 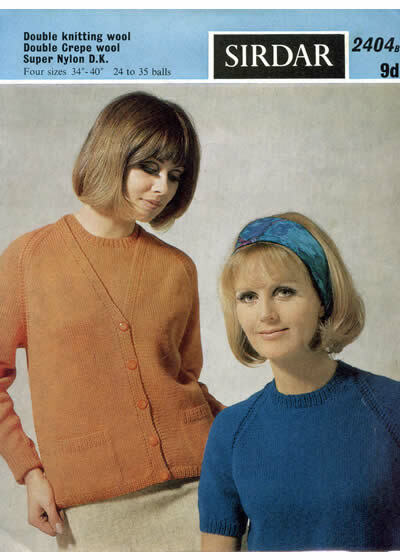 Description: From the 1960s - two styles for summer tops - can't somehow imagine they would be very summery in Fiona though, which I remember as a slightly soft and fluffy shetland type yarn. 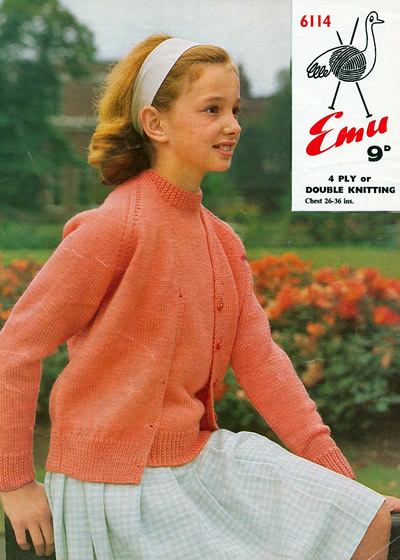 Centre crease in pattern - not too obvious, but can be seen in the picture. 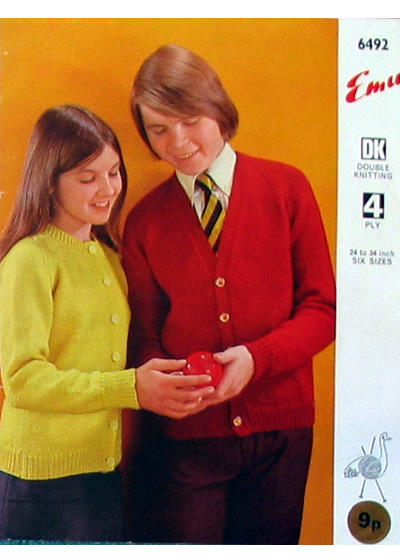 Wool quantity required: 6-7 oz balls for single colour and 4-6 oz of each for the two-colour version. 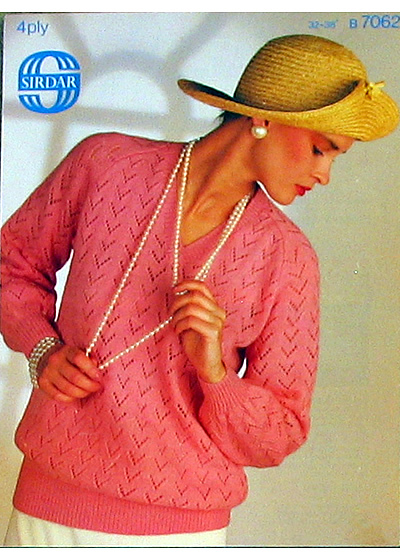 Description: Pleasing and fresh T-shaped sweater made in two pieces with sleeves all in one. 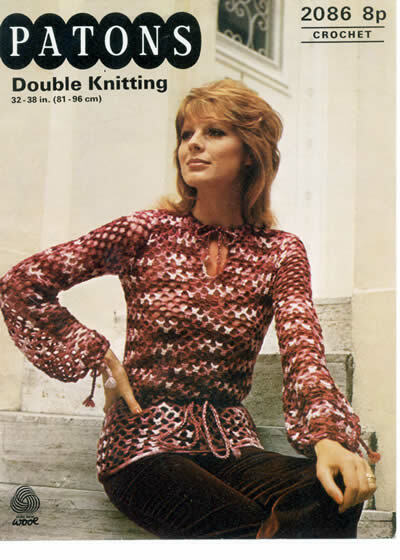 Description: Delightful summer top in pleasing pattern using textured double knitting yarn. 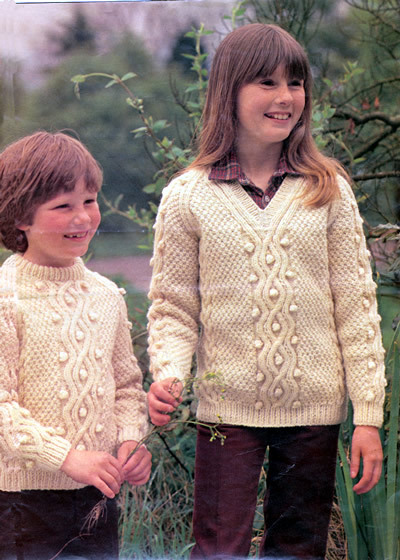 Description: Traditional timeless Aran-design child's sweaters plus mittens to match. 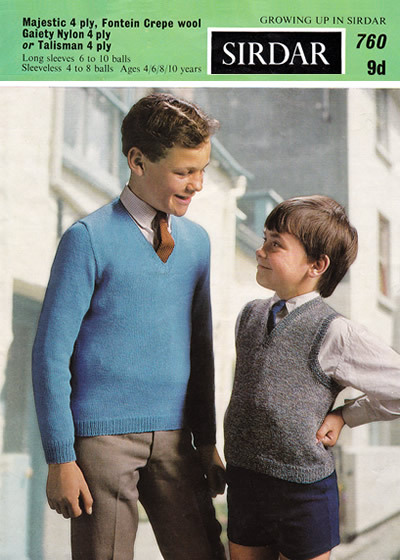 Wool brand: New Look, Gentle Touch, Kingfisher, Coolie, Supersaver. 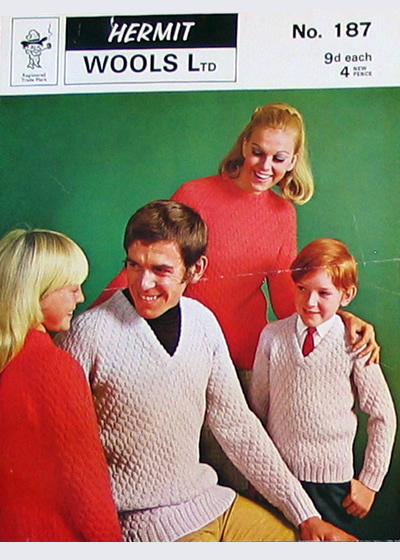 Description: More family sized plain sweaters. 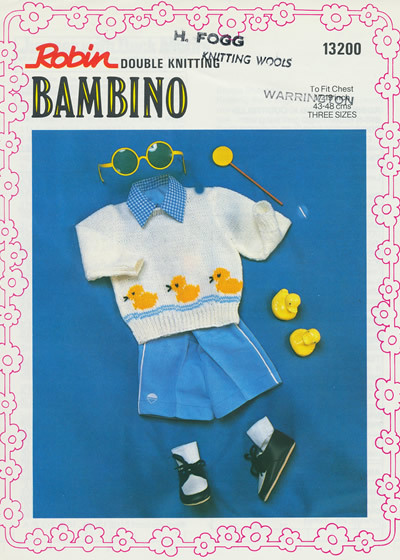 Description: A top for Spring's cross-season wardrobe or an option for cool Summer days. 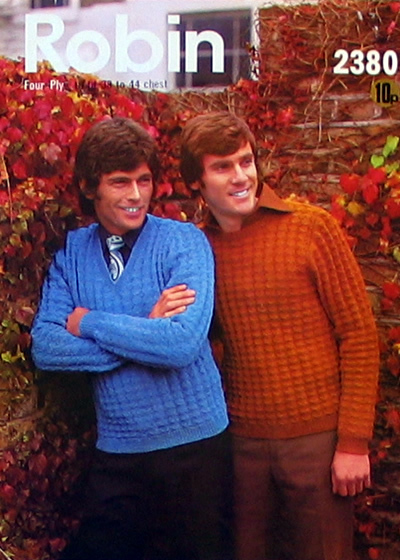 Tension (10x10cm): 22sts x 32 rows over patt. 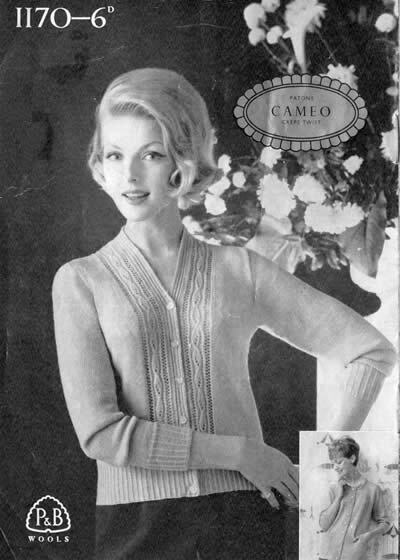 Description: Light openwork double knit sweater; could be knitted in cotton blend for a summery feel. 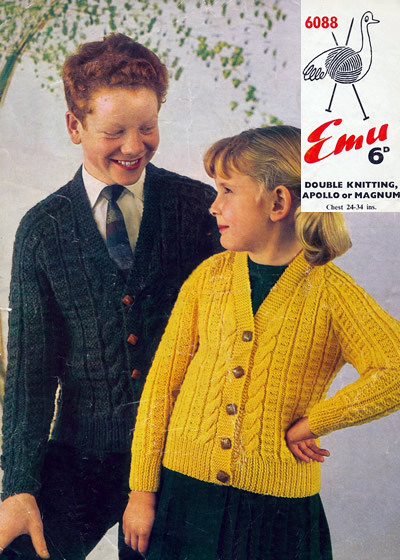 Sized down to 28 inch chest. 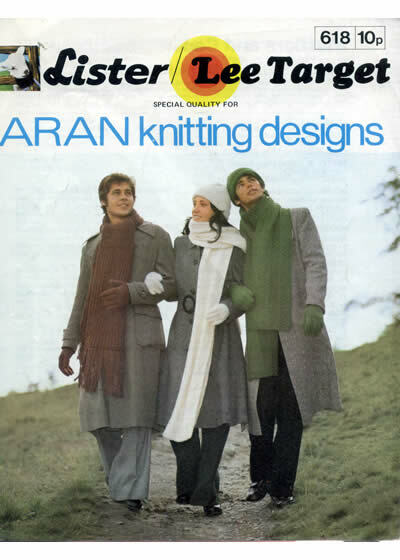 Description: Cardigan, long waistcoat ("sleeveless coat"), and sleeveless cardigan ("waistcoat") - all in a cabled Aran style pattern but in double knitting weight yarn. 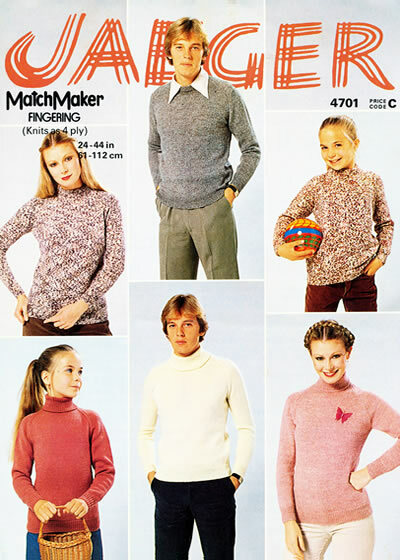 Description: Perfectly plain roll neck and matching skirt with a textured V-neck "jerkin". 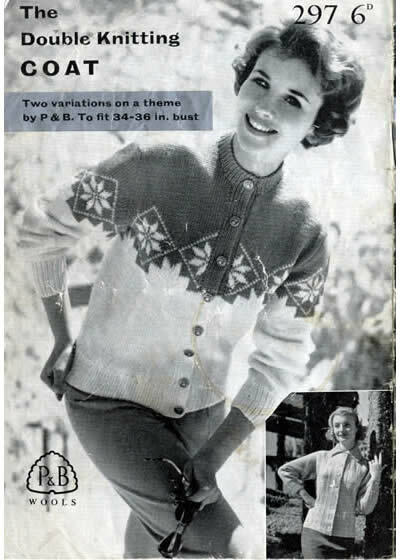 The pattern has a horizontal and a vertical crease and some previous owners marks which do not affect the instructions. 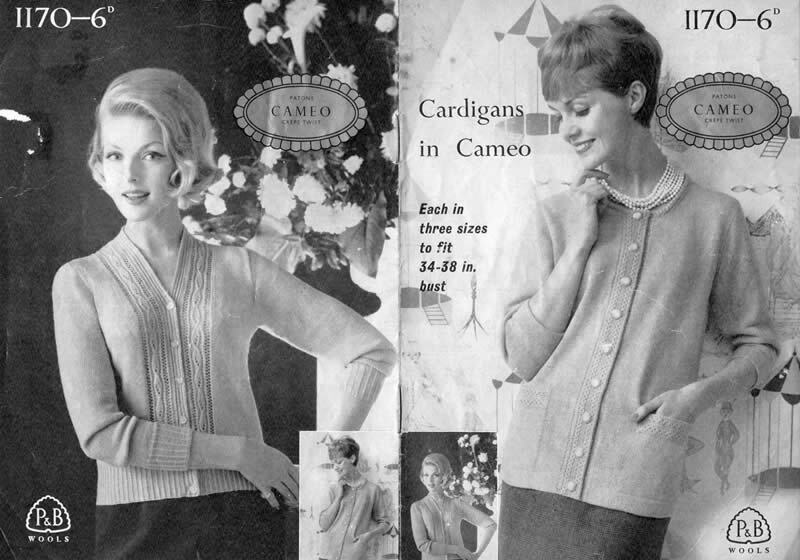 Description: Perfectly plain cardigan and sweaters with a choice of neckline. 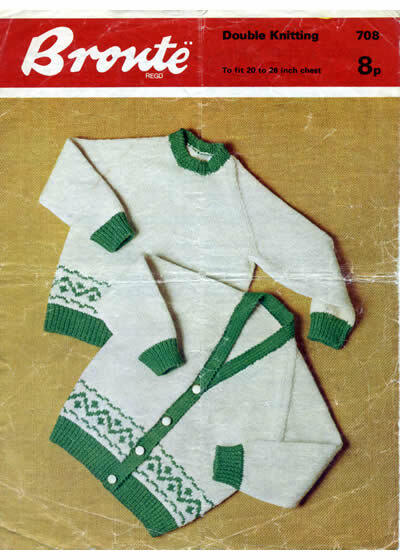 The pattern has a horizontal crease and some previous owners marks which do not affect the instructions. 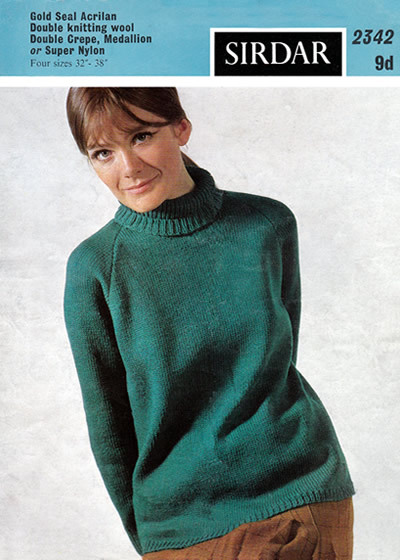 Description: Perfectly plain womens sweaters with choice of neckline. 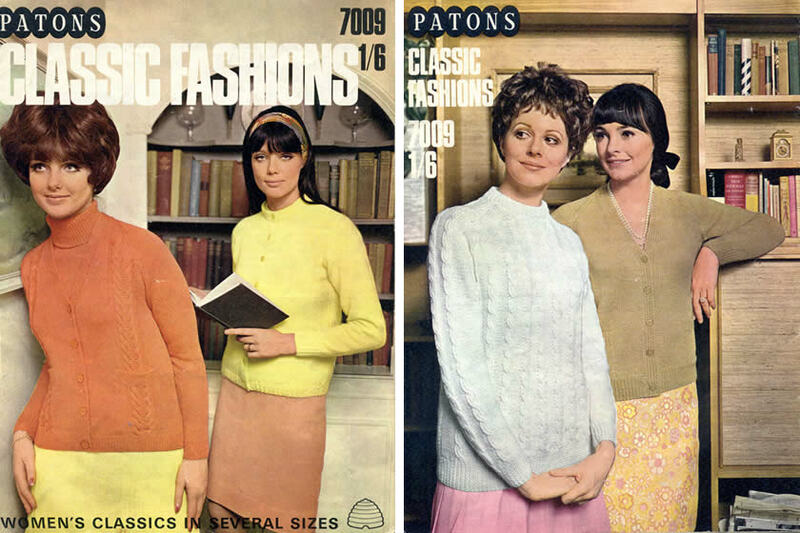 A very popular design for the sixties. 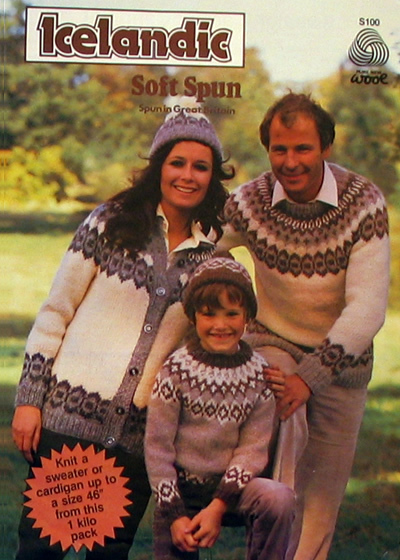 Instructions for 3 ply, 4 ply, or DK. 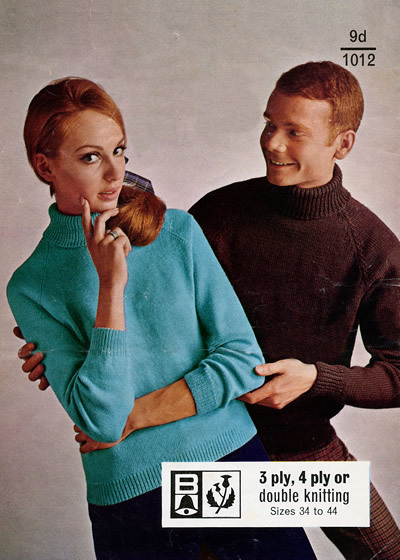 Description: Perfectly plain roll-neck sweaters for Him and Her. 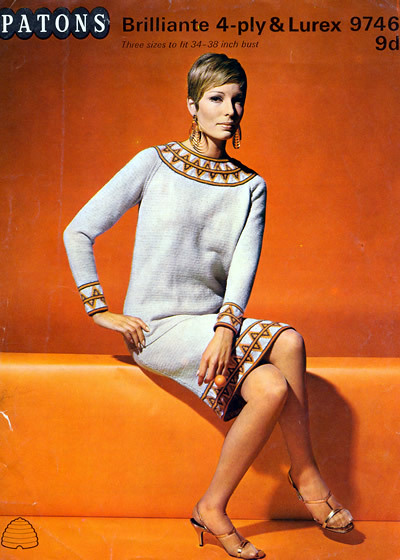 A very popular design for the sixties. 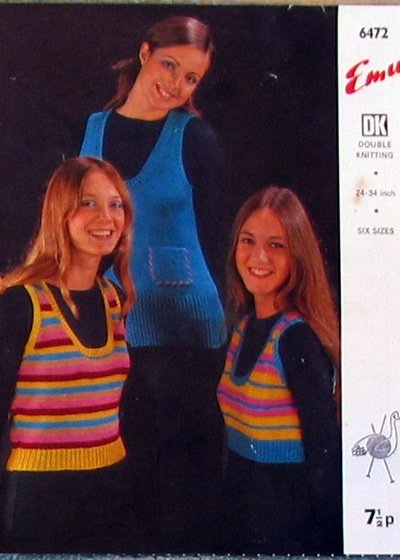 Instructions for 3 ply, 4 ply, or DK. 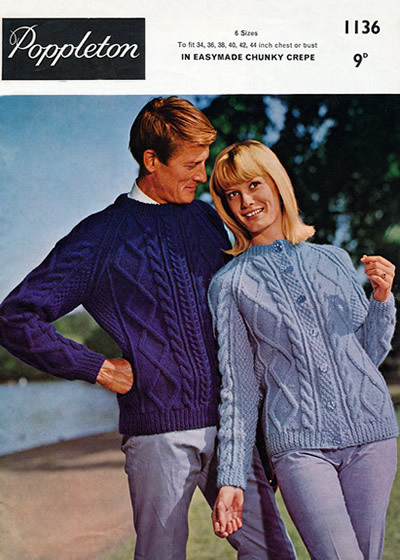 The pattern is in generally good condition with some light creasing and marks. 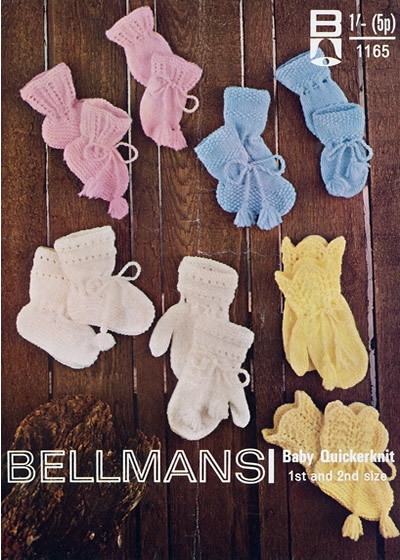 Description: Cute baby mittens, and bootees to knit in quick-knit yarn (light double knitting). 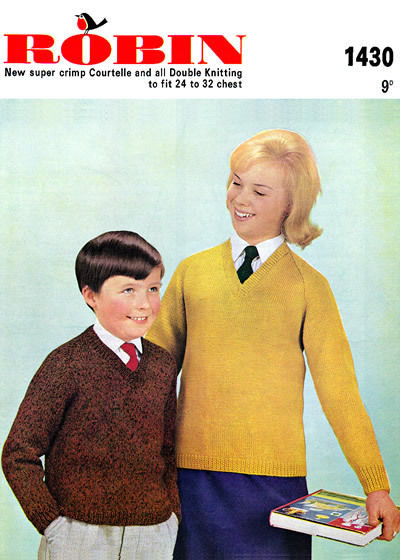 * The instructions are given for 26 - 32 inch chest (4 sizes) except for the last which is for 22 - 28 inch chest. 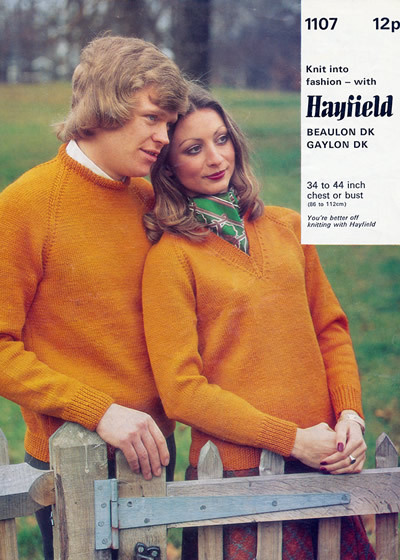 The booklet is in good used condition..
9 basic designs, each with slight variations (neckline etc) in Hayfield yarns.. 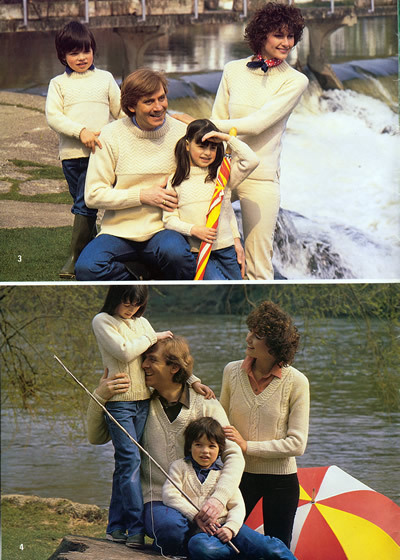 The booklet is in used condition with the cover being fairly worn but the rest of the booklet in fairly good condition. 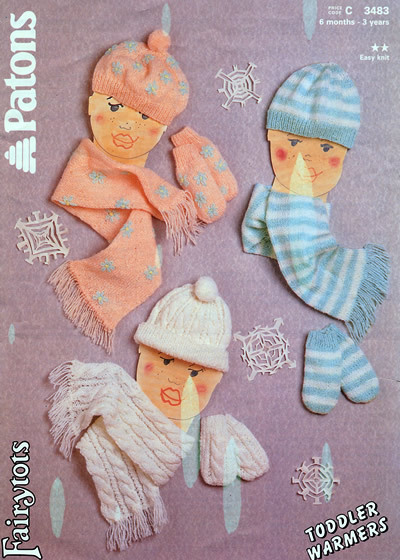 15 cute designs in Patons Fairytale and Baby yarns. 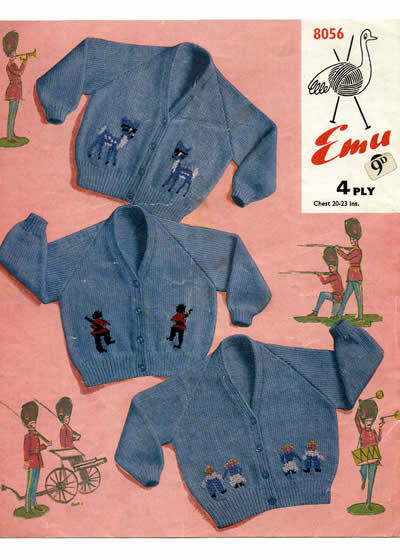 Description: Classic set of cardigans in fine 3 ply yarn. 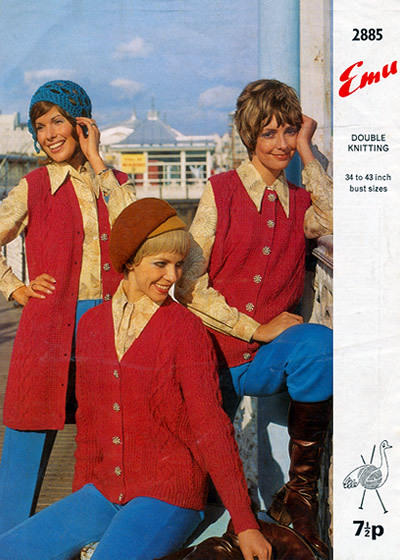 Three necklines: high round neck, classic V, and flattering buttoning at the waist. 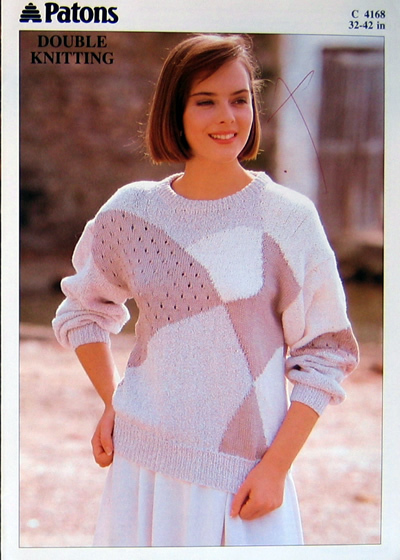 Description: Sideways knit dolman in contrastind yarns. 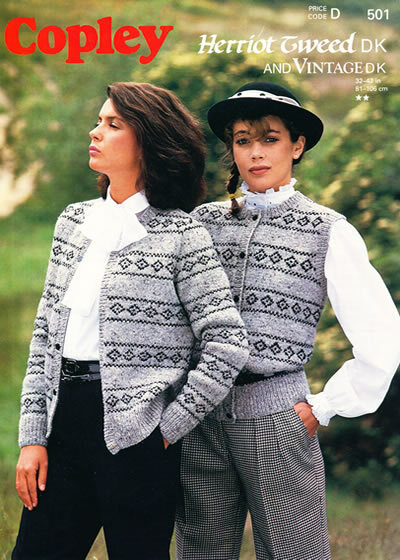 If the design appeals (dolmans seem to be a fashionable style at the moment) this could be a good stash buster with a more tasteful conbination of colours and textures (or even bands of fair isle) in double knitting. 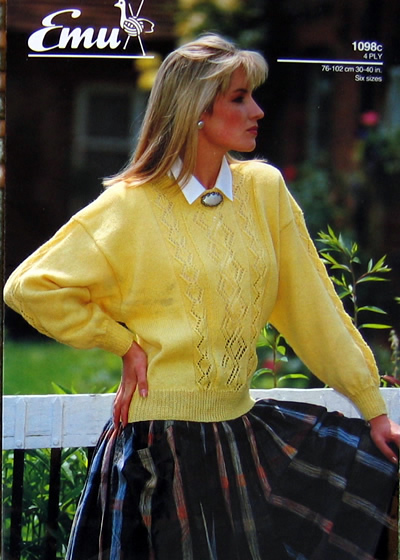 Description: Plain knit sweater in in a chunky tweed with contrast welts and collar. 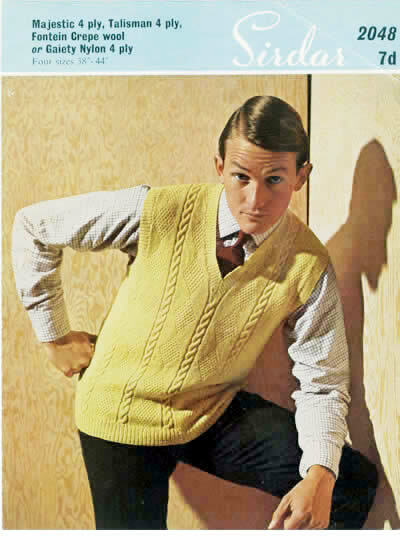 This short sleeved oversweater is very typical of the era. 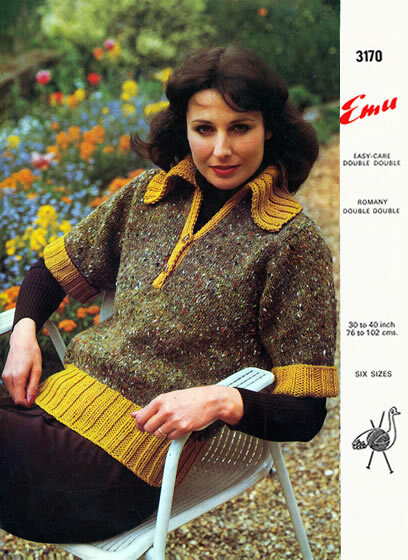 The pattern is in good condition; there are 3 neat biro alterations inside which correct publishing errors (Emu could not decide which colour they were calling the "main shade"). 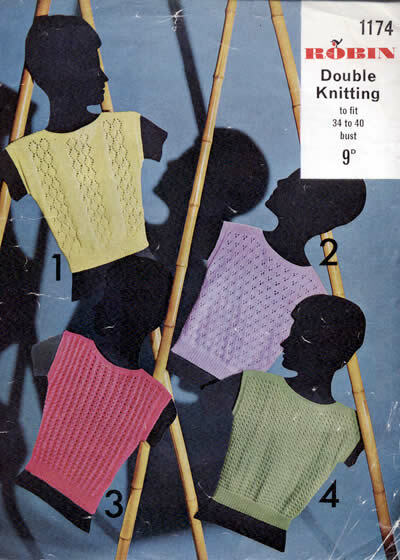 Tension (10x10cm): 22sts x 32rows in st st. 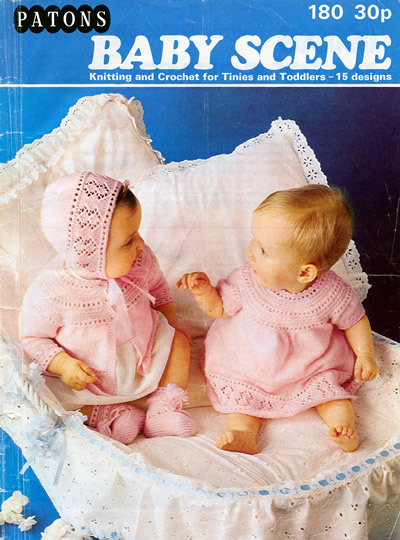 Description: Lacy twin-set in a wide range of girl's / toddler sizes. 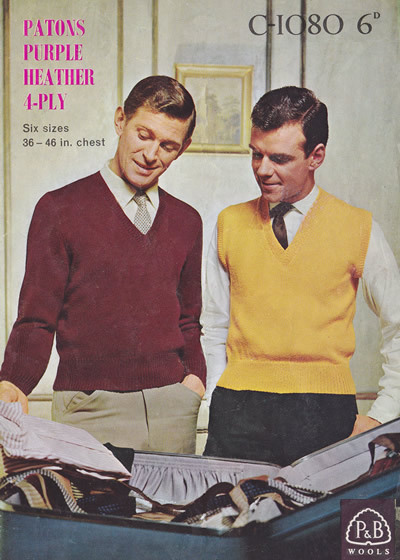 Sizes: to fit 26 - 36 inch chest (6 sizes). 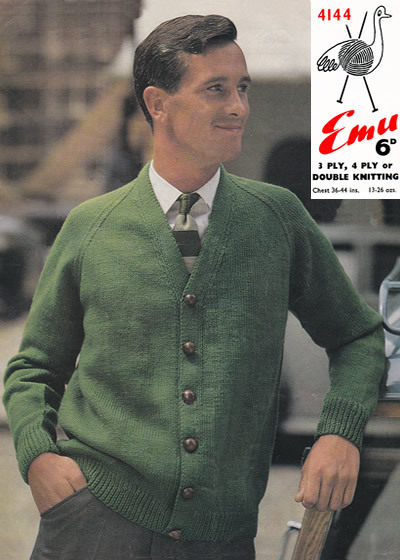 2¾mm, 3¼mm for 4 ply; 2¼mm, 3mm for 3 ply. 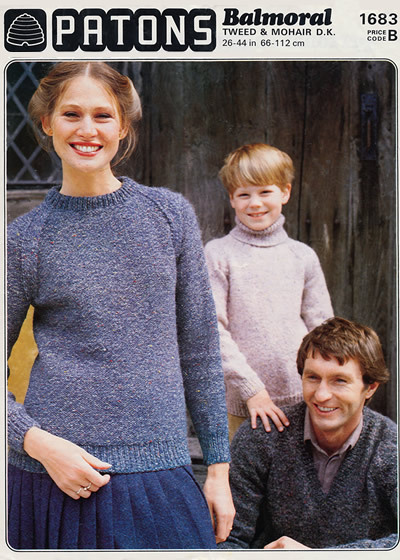 Description: Traditional plain round-neck sweaters in a choice of yarn weight. 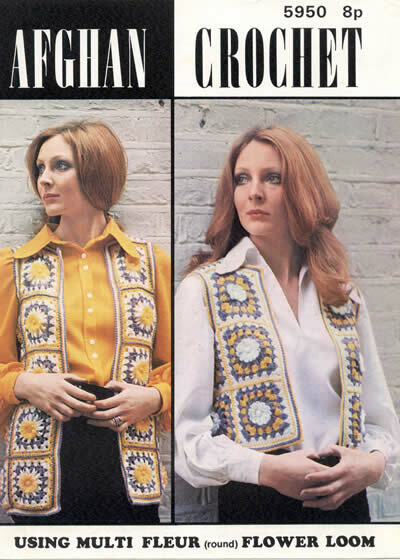 Sizes: to fit 22 - 30 inch chest (9 sizes). 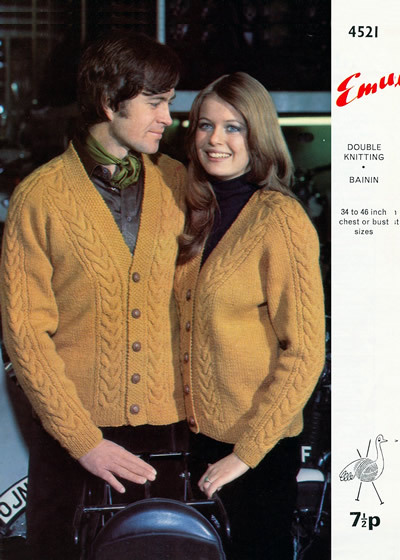 2¾mm and 3¼mm for 4ply. 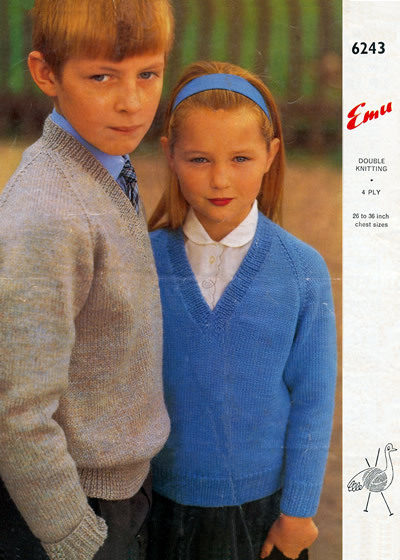 Description: Traditional school type sweaters in a choice of yarn weight. 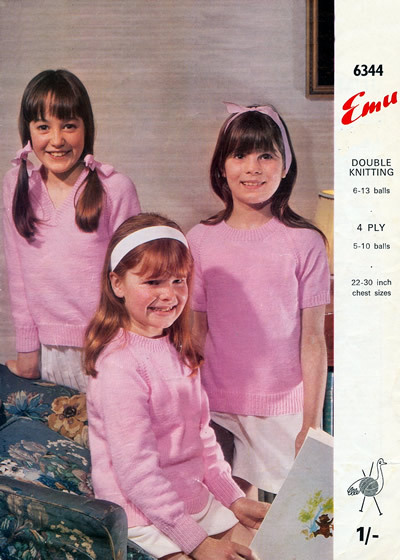 Despite being modelled in sugary pink they would obviously be suitable for school wear for a boy or girl. 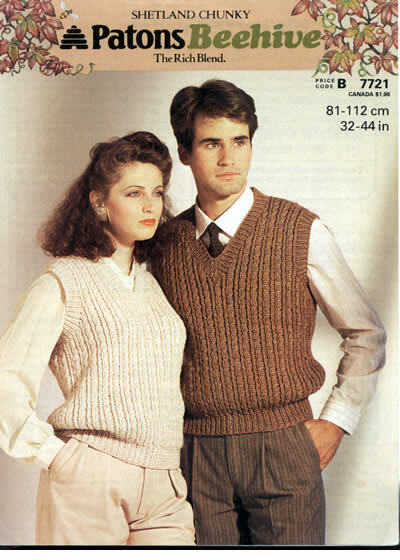 Sizes: to fit 24 - 34 inch chest (6 sizes). 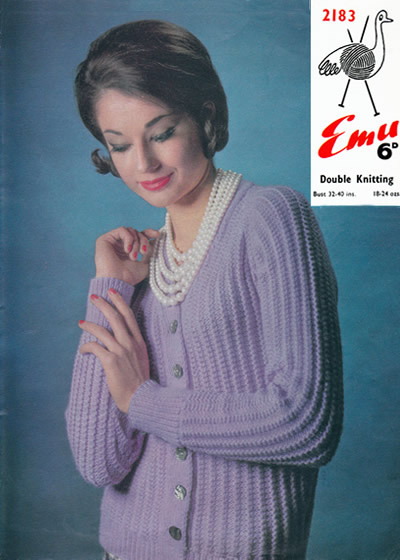 5mm and 6½mm for Chunky. 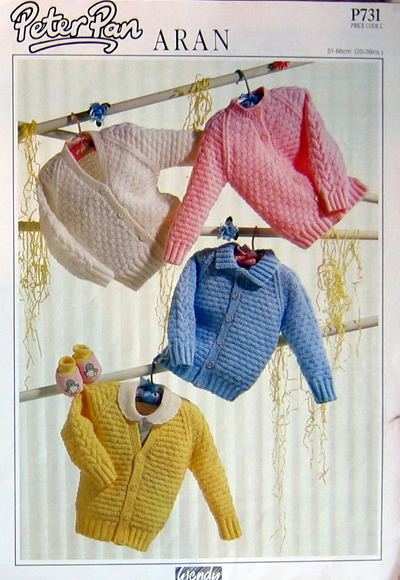 Description: Traditional cabled cardigans in a choice of yarn weight. 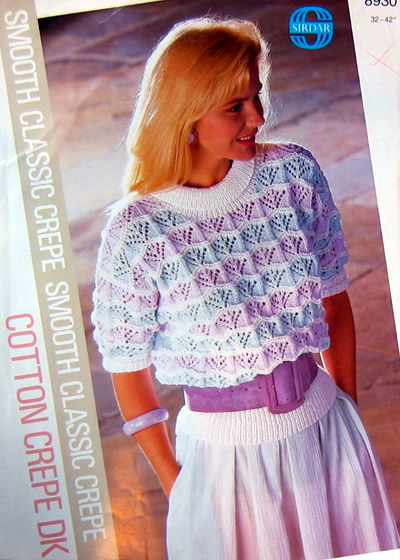 The pattern is worn with creasing and marks but this does not affect the instructions. 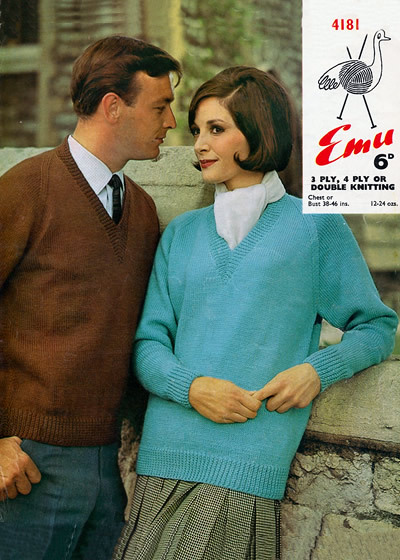 2¾ and 3¼mm for 4 ply. 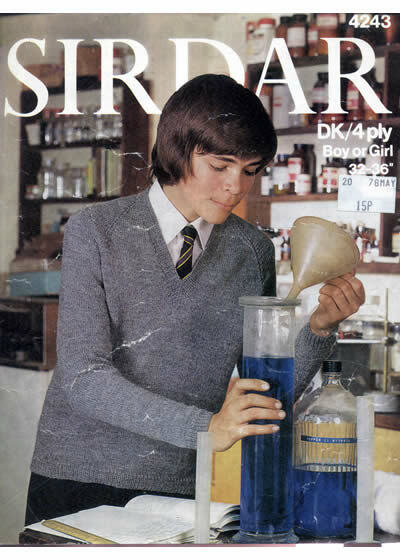 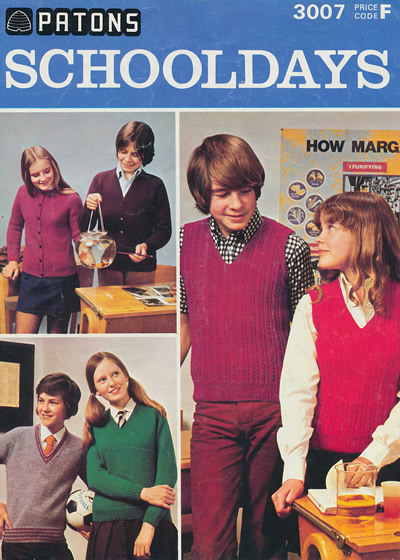 Description: Traditional school jumper in choice of yarn weight. 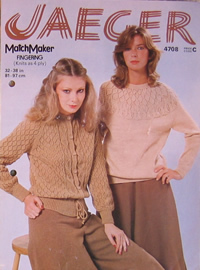 The pattern has some light creasing and marks but this does not affect the instructions. 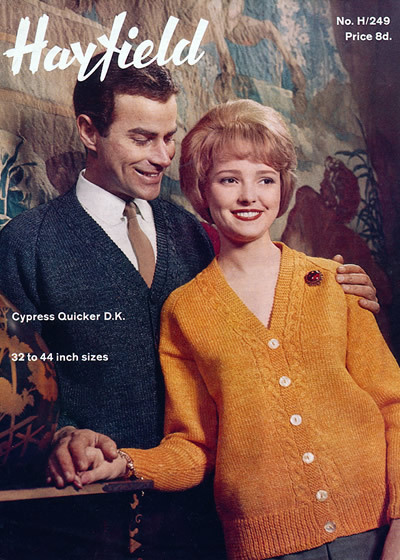 Cardigan: 8-13 ozs 4 ply; 13-18 ozs DK. 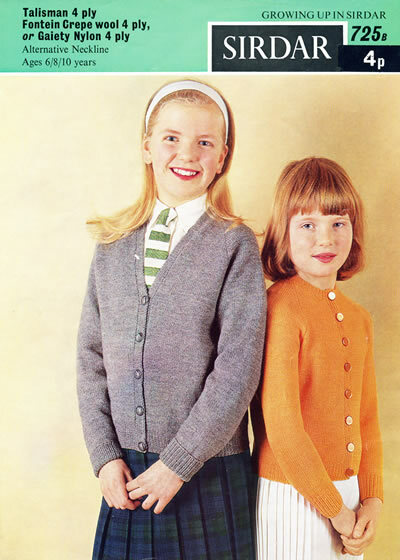 Description: Girl's plain short sleeved round-neck jumper with V-neck cardigan. 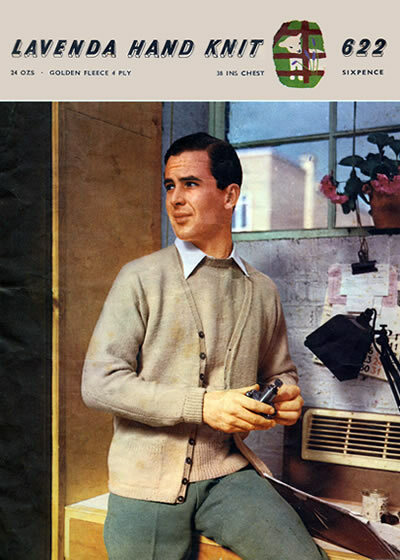 Wool brand: Scotch, Carella, Bri Nylon, Crepe, Aran Bainin. 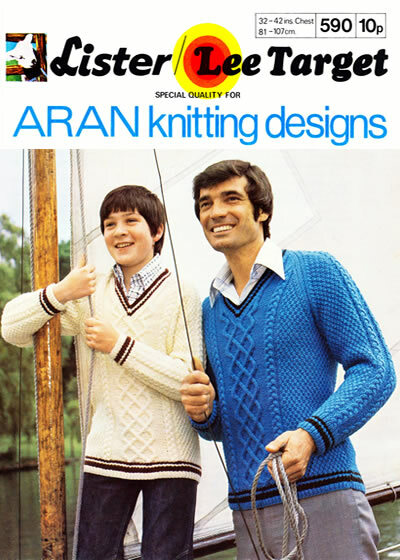 13-19 (50g balls) Aran Bainin. 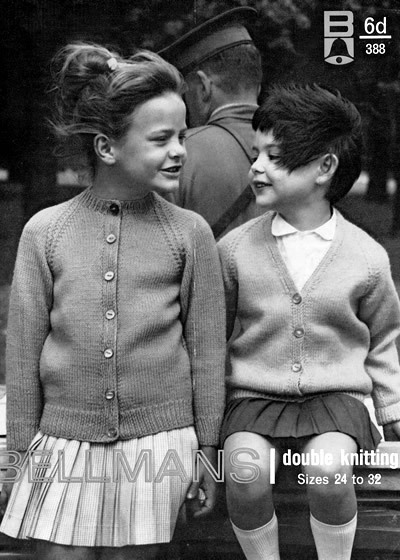 Wool weight: Double knitting or Aran. 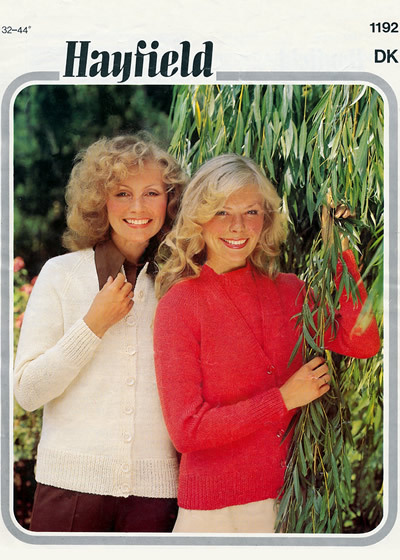 Description: Classic cable style cardigan - instructions given for both Aran and double knitting weight yarn. 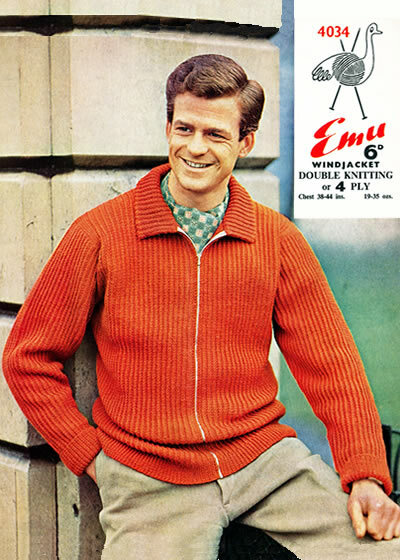 Wool brand: Scotch, Double/Super Crepe, Romany, Zephyr, Bri-nylon, Calypso. 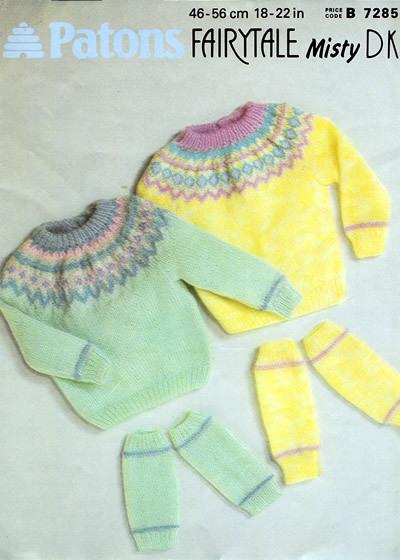 4 ply: 14-18 oz; 3 ply: 12-16 oz. 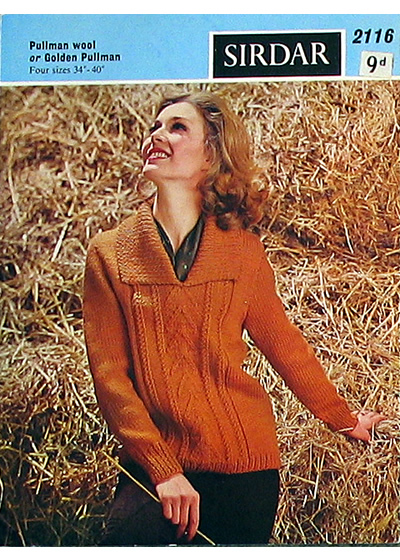 34sts x 44rows in 3 ply over stocking stitch. 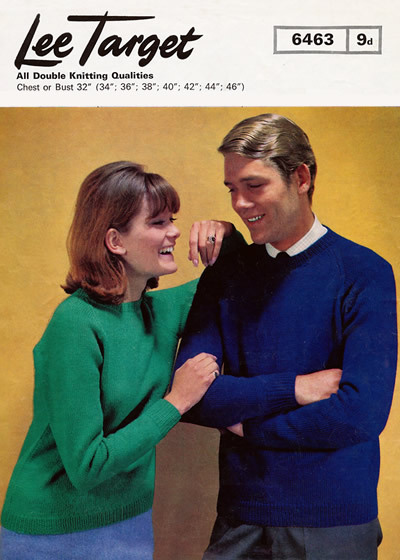 Description: Perfectly plain V-neck sweaters for Him and Her. 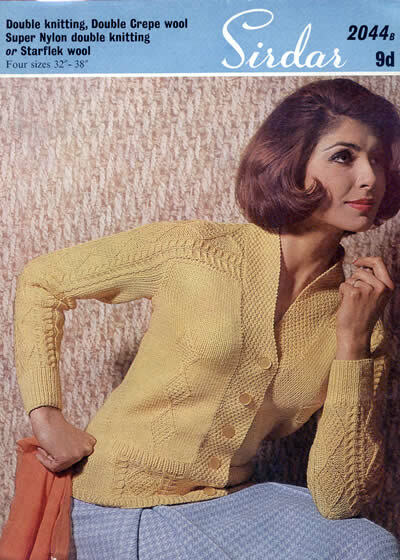 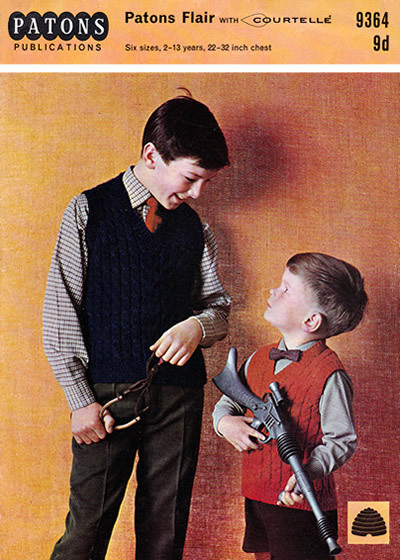 A very popular design for the sixties, where hand knitting was not the height of fashion. 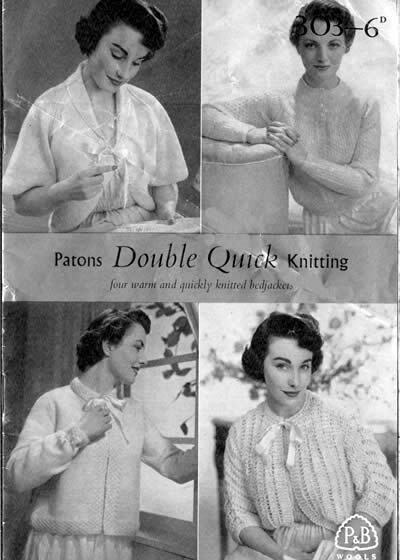 Instructions for 3ply as well as 4 ply or DK. 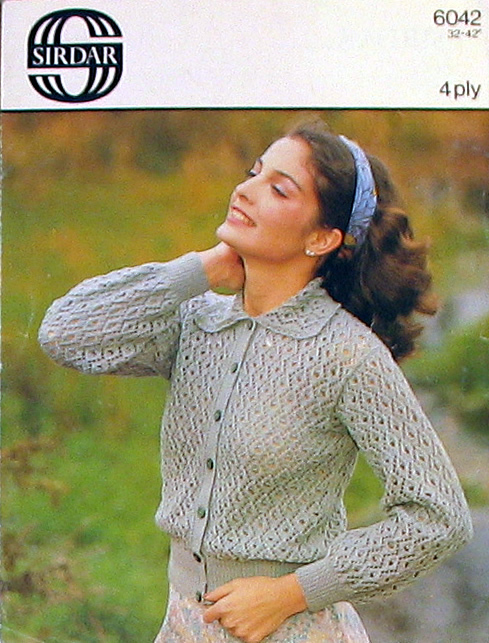 Yarn quantity: Jacket: 24-32 (1 oz balls) DK; Skirt: 16-20 oz DK; Jumper: 11-14 oz 4 ply. 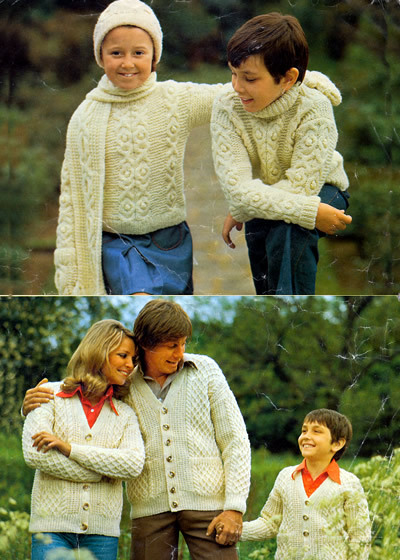 Description: I'm including this as yet again it is a spendid pattern of its time. 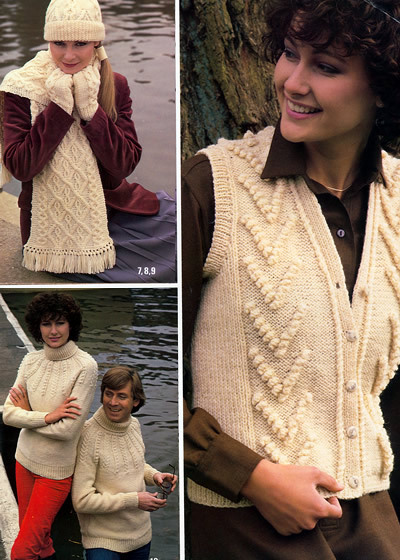 The pattern itself is for a jacket and skirt in double knitting yarn in a textured pattern which forms a combination of alternating bobbles but perhaps more like a moss or seed stitch where every alternate row is purl. 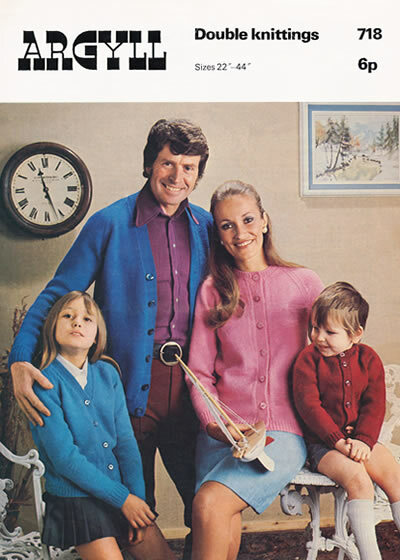 If that weren't enough, there is also a 4 ply long-sleeved sweater with a tie belt to wear with the costume (as shown in the photo). 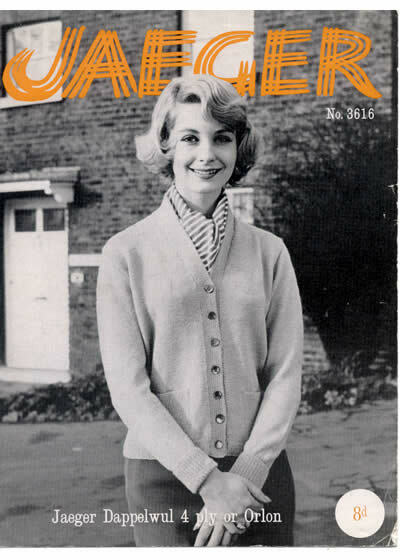 However it is in very poor condition with creases and tears; I have cleaned up the photo illustration. 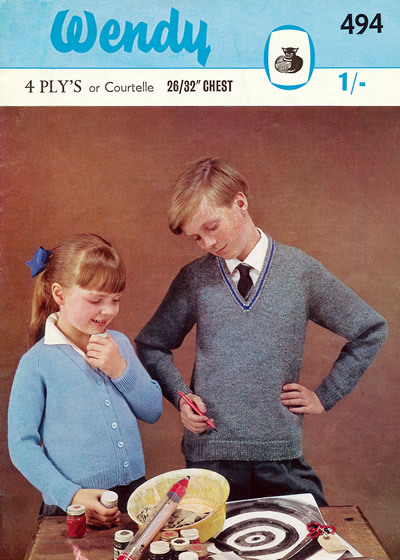 The instructions are clear enough and should you want this pattern I will ensure you have clear instructions supplied. 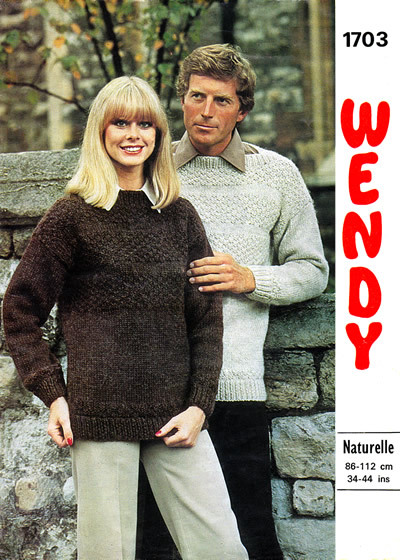 Description: Plain round necked raglan sweater sized from teen size through to large mens size - so probably suitable for men, women and young adults. 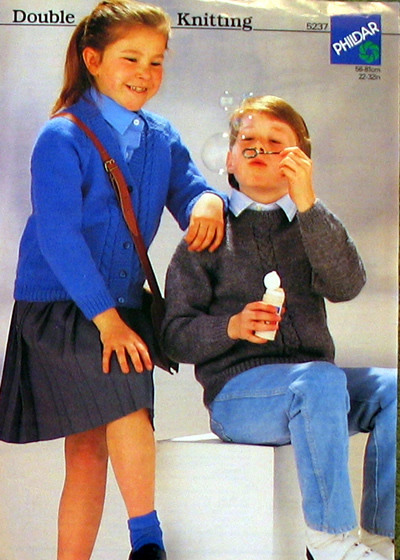 Wool brand: Scotch, Double/Super Crepe, Bri-nylon, Tricel, Bri-nylon. 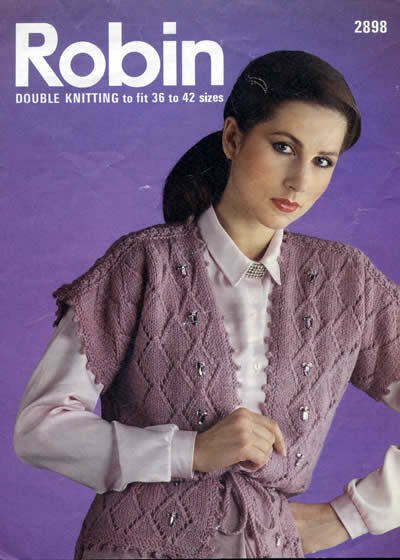 30sts x 38rows in 4 ply over stocking stitch. 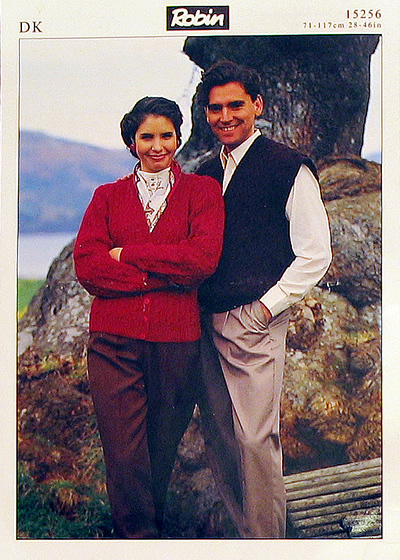 Description: Perfectly plain roll or V-neck sweaters for Him and Her. 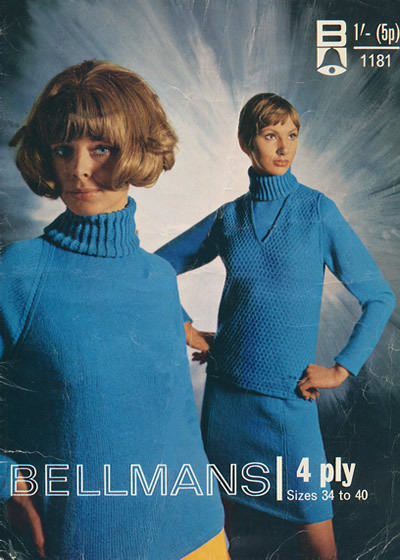 A very popular design for the sixties, where hand knitting was not the height of fashion. 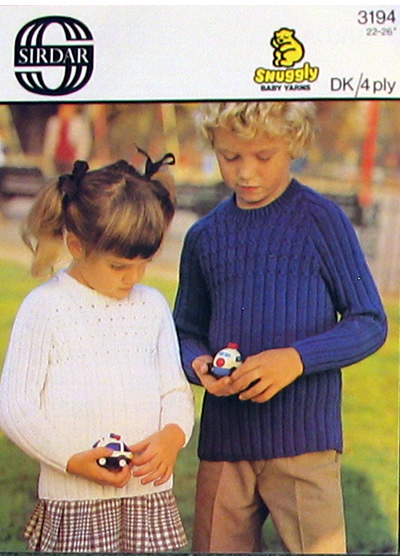 Instructions for 4 ply or DK. 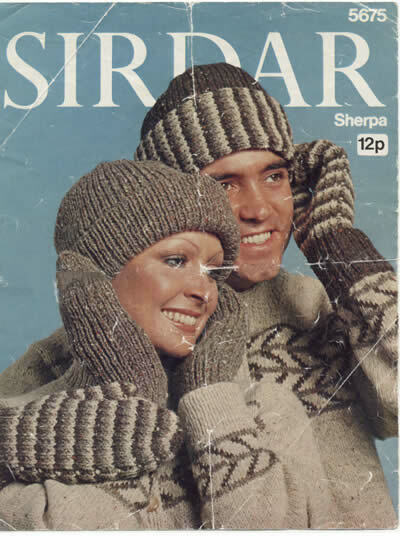 There is a heavy horizontal crease and a tear at the bottom edge plus a few biro marks - none of which obscure the instructions. 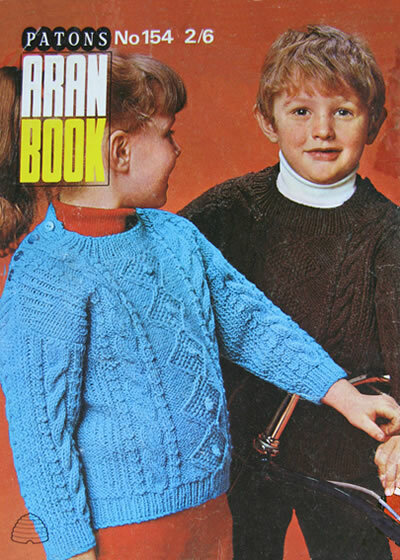 The booklet is in moderately good condition - a little creased on the cover with wear on the spine but instructions unaffected. 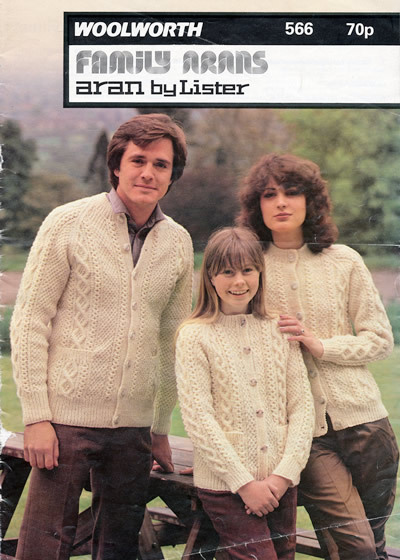 7 designs in Lister Aran. 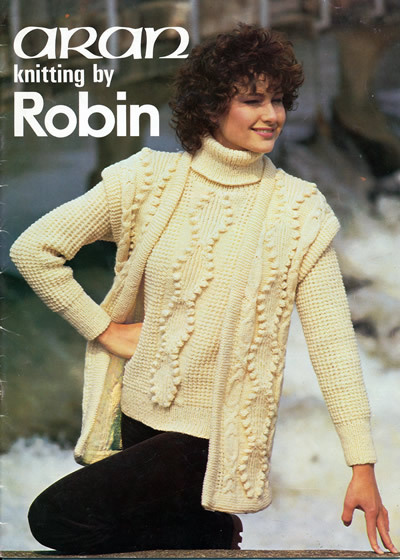 The booklet is in good condition with 15 designs in Robin Aran or Seascape. 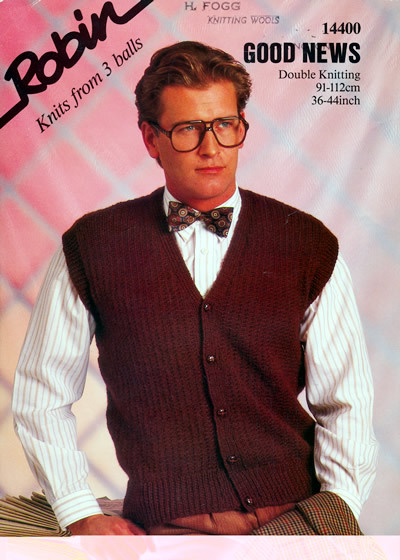 Description: Man's wide broken rib pattern waistcoat. 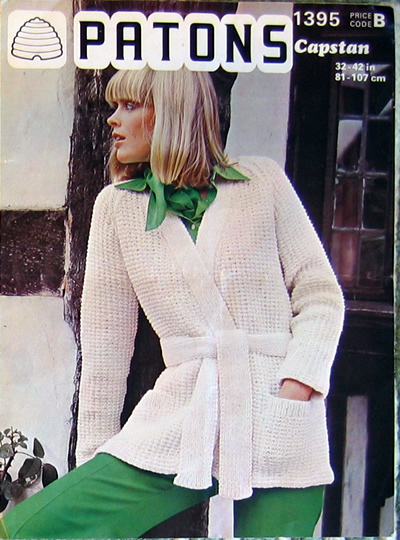 A very pleasing stitch combination with vertical bands of moss and stocking stitch, interrupted by single rows of purl. 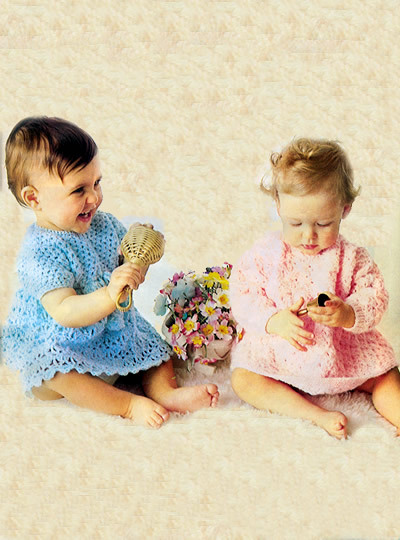 Description: Always charming traditional baby wear with button or tie front. 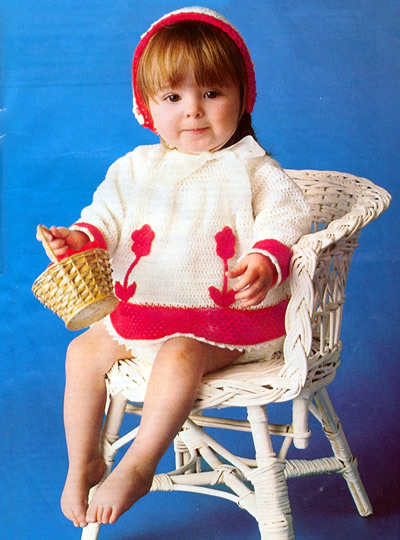 Description: Always charming traditional baby wear with button closure. 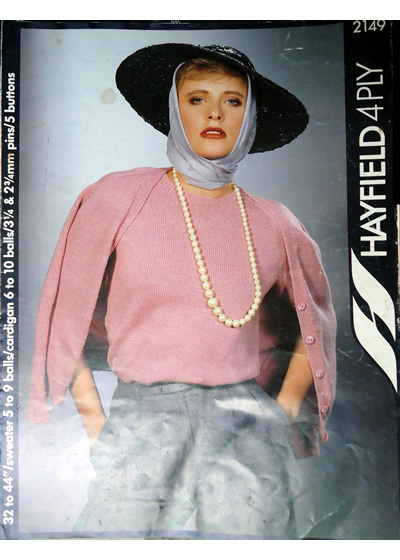 Some surface and corner creasing. 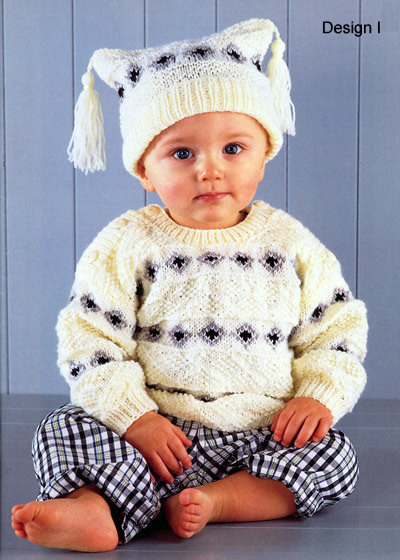 Description: Always charming traditional baby wear. 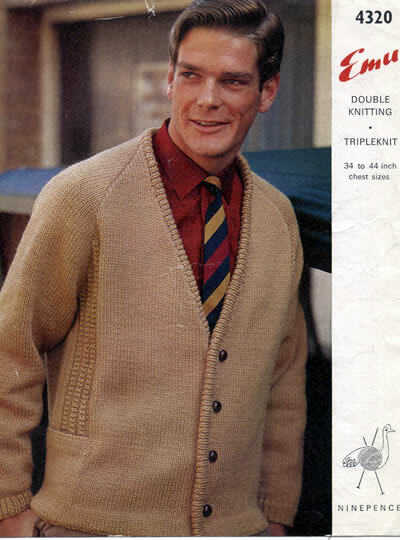 A simple cardigan and rather nice relatively plain matinee jacket, reminiscent of a guernsey with its mock-basket weave yoke. 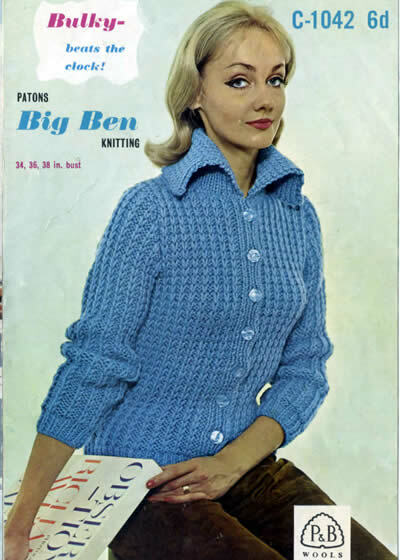 Tension (10x10cm): 28sts x 40 rows over patt. 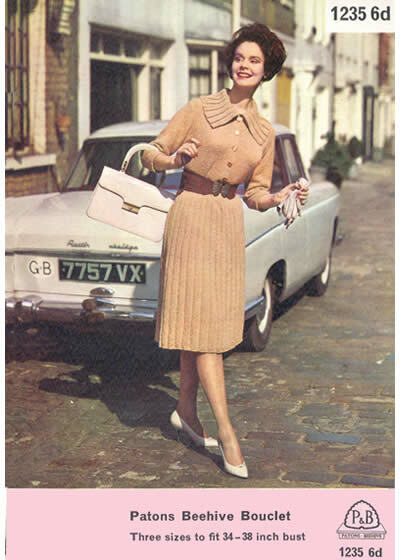 Description: Jacket and dress worked in gold thread. 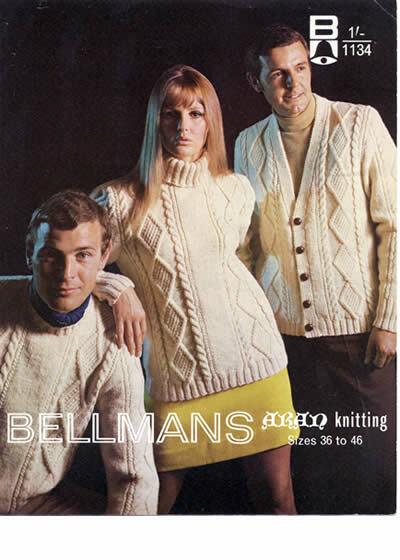 "Worn belted or unbelted" - now that's versatile. 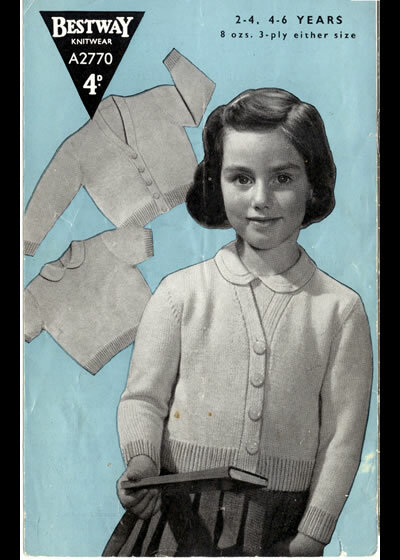 Small tear which does not affect the instructions. 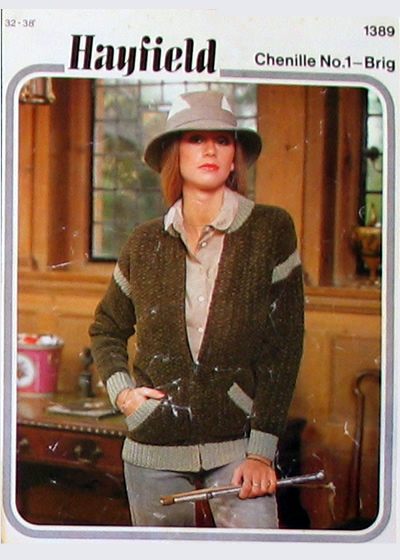 Description: Classic cardigan in larger sizes (2 inch ease). 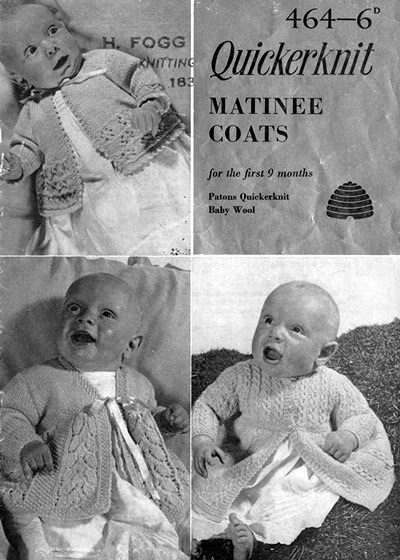 Small tear which does not affect the readability of the instructions. 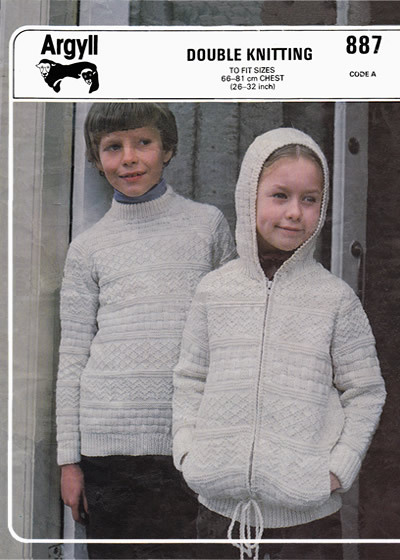 Description: Pleasing Aran patterned zipped hoodies in family sizes. 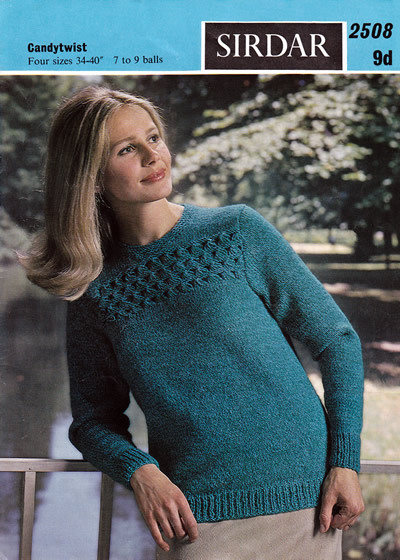 Description: Plain over-sweater tunics with saddle-shoulder and yoke detail in garter stitch; instructions given for 4 ply and DK. 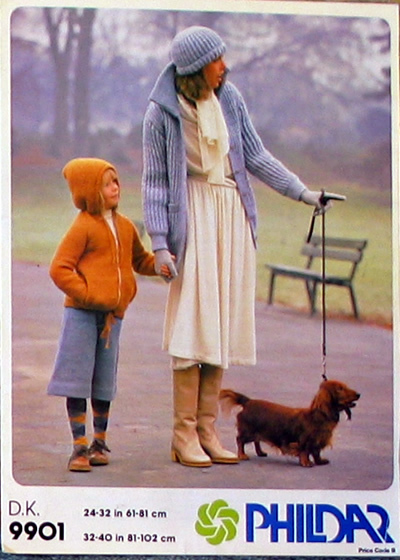 There is a option of a rolled collar as shown on the child's version. 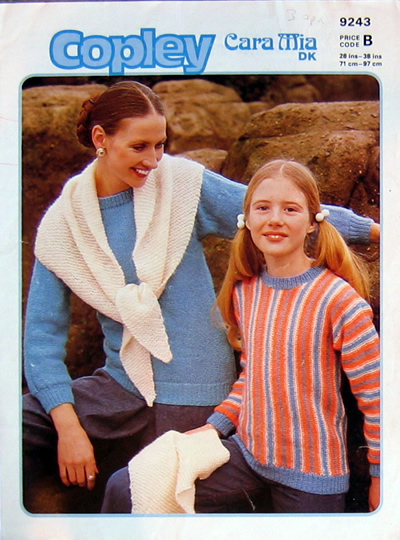 Tension (10x10cm): 24sts x 32 rows in st st. 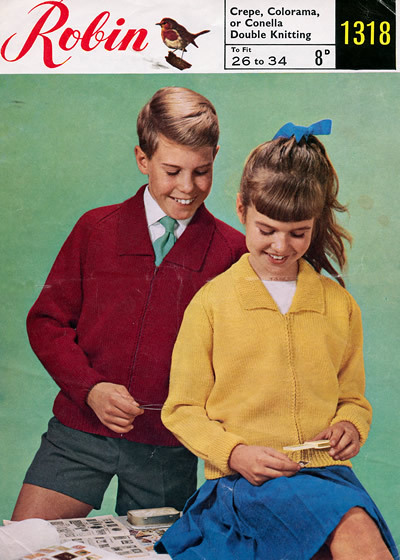 Description: Budding philatelists, wearing zipped cardigans with collar. 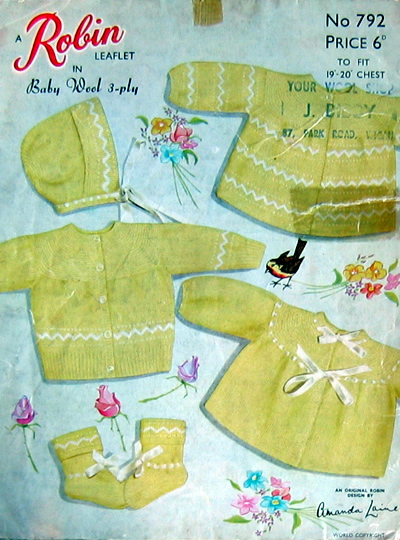 Horizontal creasing and small tear which does not affect the instructions. 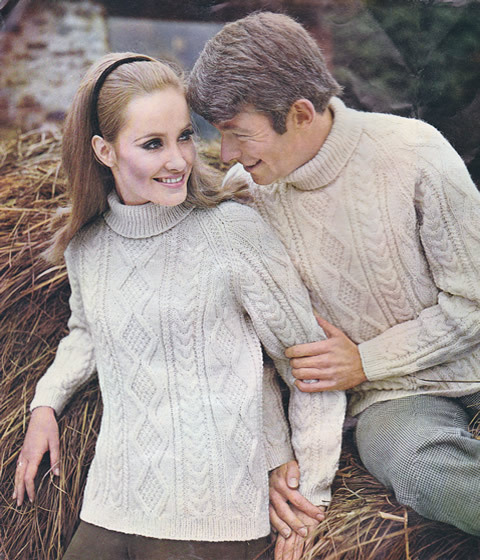 Description: Perfectly plain roll-neck sweaters for Him and Her. 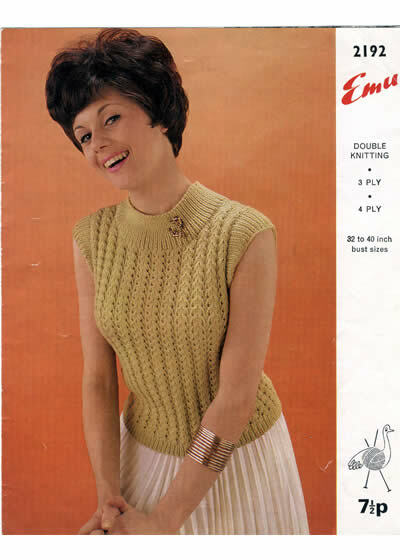 A very popular design for the sixties, where hand knitting was not the height of fashion. 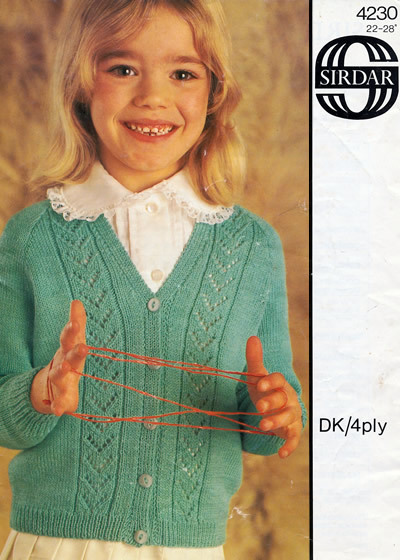 Instructions for 4 ply or DK. 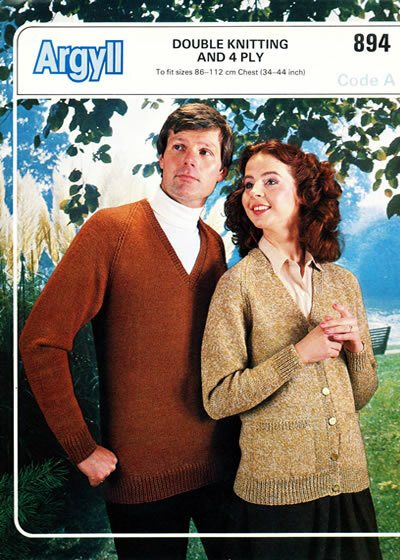 Description: Cardigan Partnership. 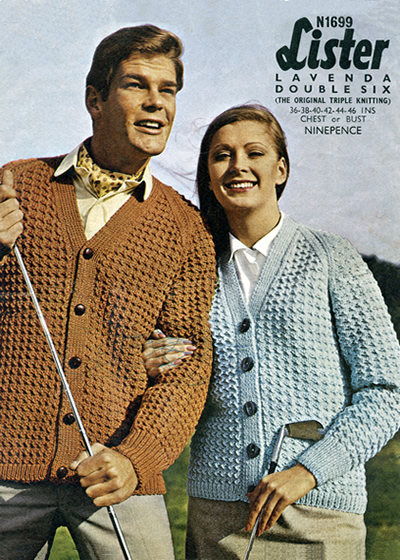 Perfectly plain cardigans in tweedy DK for Him and Her. 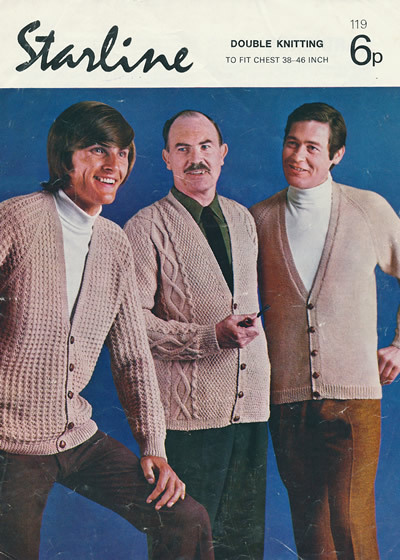 Description: Mens' cardigans in three styles (and styled to appeal to all ages apparently): Aran pattern, textured rib, and perfectly plain. 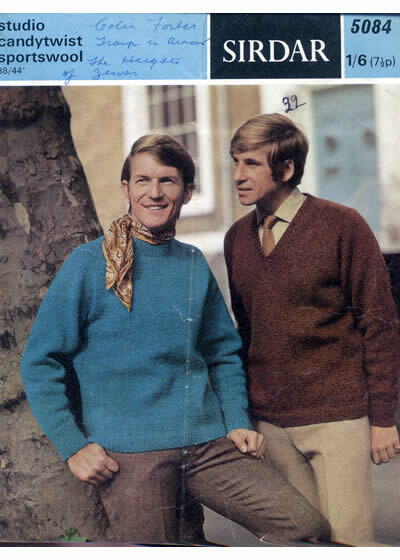 Description: More sixties young folk in their groovy (possibly) striped cardigans. 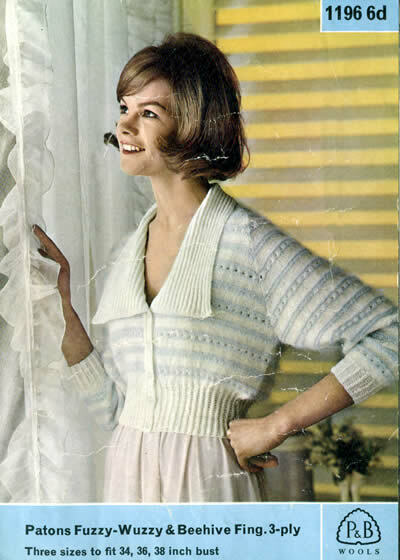 Knitted sideways to make the interesting vertical stripes. 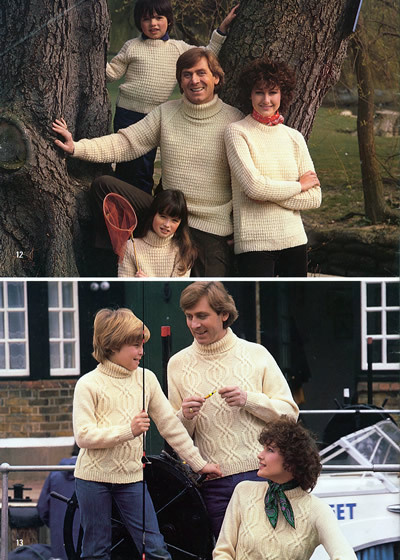 Description: Traditional family cable cricket (or tennis?) 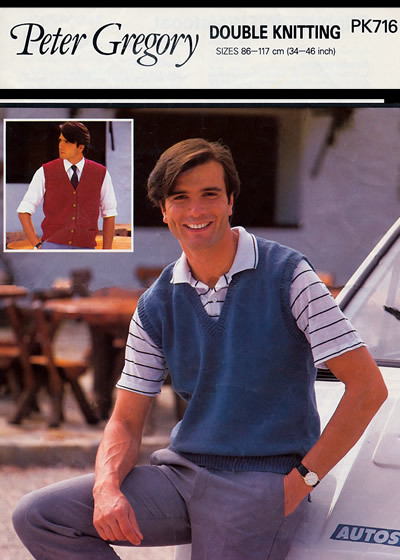 sweater or slipover. 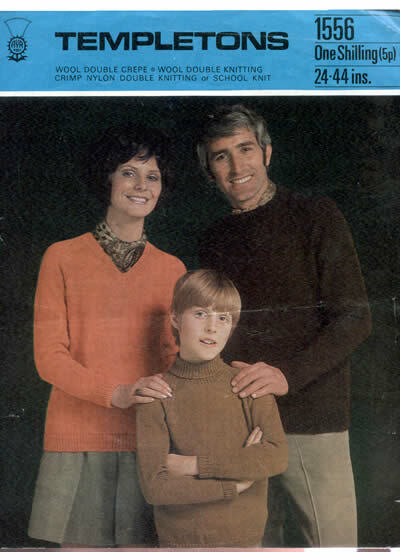 Some light creasing to the front photo. 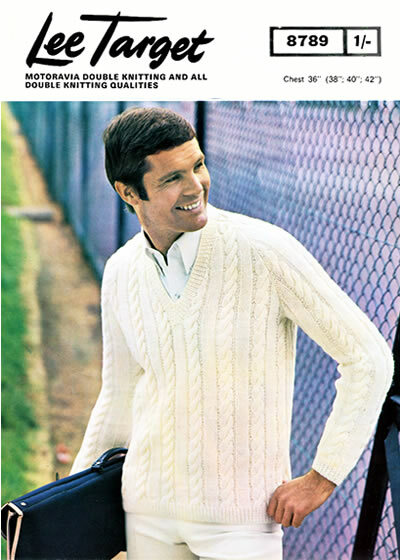 Description: Traditional man's cable cricket (or tennis?) 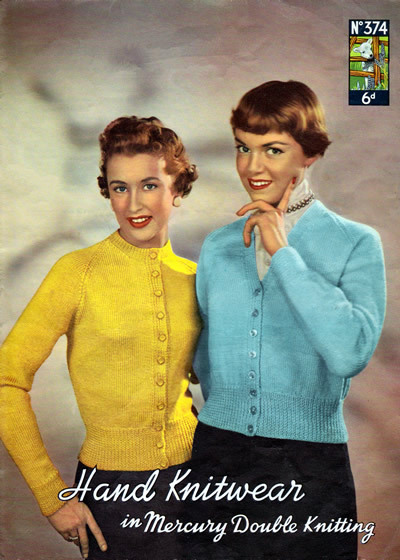 sweater with colours.